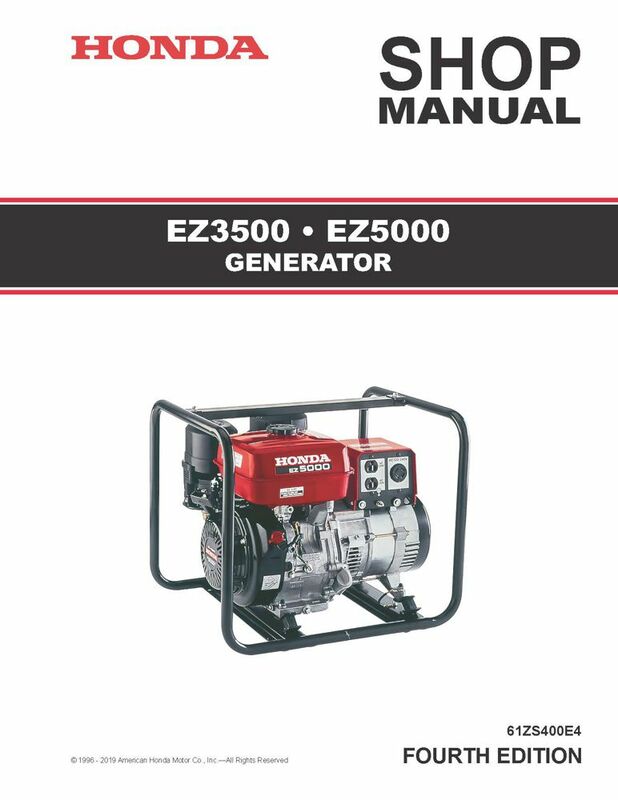 The Honda E300, ED250 Generator Shop Manual covers service and repair procedures for all E300, E400, ED250, and ER400 generators. See images for Table of Contents and sample page; bound, black/white, 8 1/2" x 11", 7-hole punched, 174 pages. Includes E400 and ER400 supplements. Enter your serial number prefix (such as GE300) in the search box to locate applicable shop manuals, parts catalogs, and free downloads. 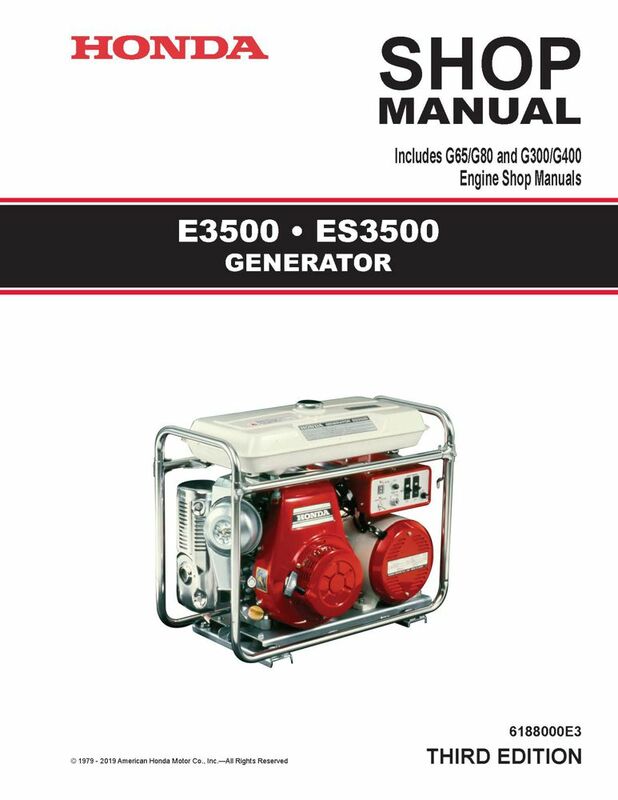 The Honda E3500, ES3500 Generator Shop Manual covers service and repair procedures for all E3500 and ES3500 generators. Enter your serial number prefix (such as ES3500) in the search box to locate applicable shop manuals, parts catalogs, and free downloads. 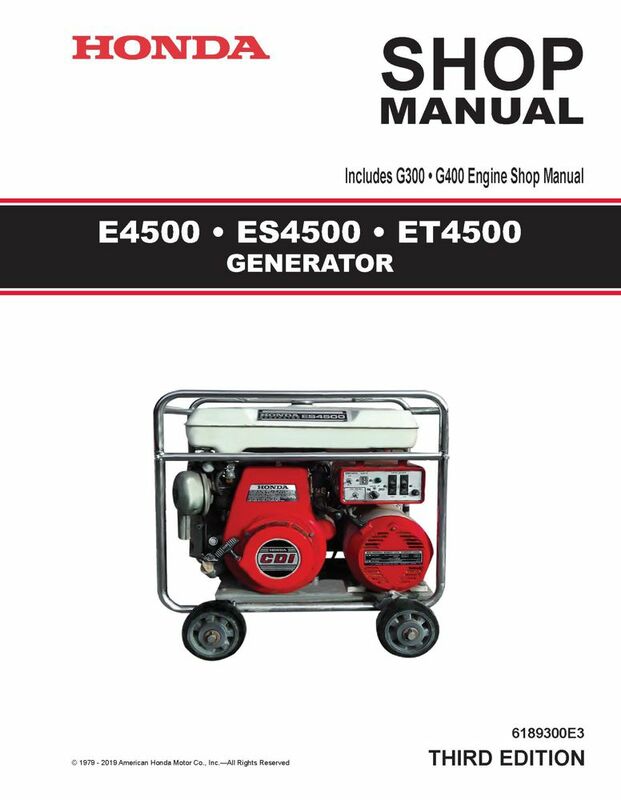 The Honda E4500, ES4500 Generator Shop Manual covers service and repair procedures for the E4500 and ES4500 generators. Enter your serial number prefix (such as ES4500) in the search box to locate applicable shop manuals, parts catalogs, and free downloads. 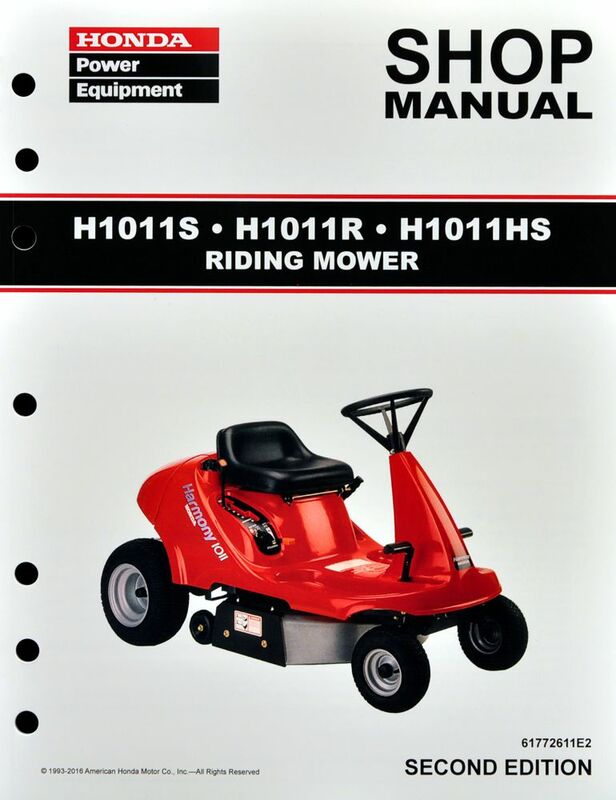 The Honda H1011S, H1011R, H1011HS Riding Mower Shop Manual covers service and repair procedures for the H1011S, H1011R, and H1011HS riding mowers. See images for Table of Contents and sample pages; bound, black/white, 8 1/2" x 11", 7-hole punched, 94 pages. Enter your serial number prefix (such as MZAW) in the search box to locate applicable shop manuals, parts catalogs, and free downloads. 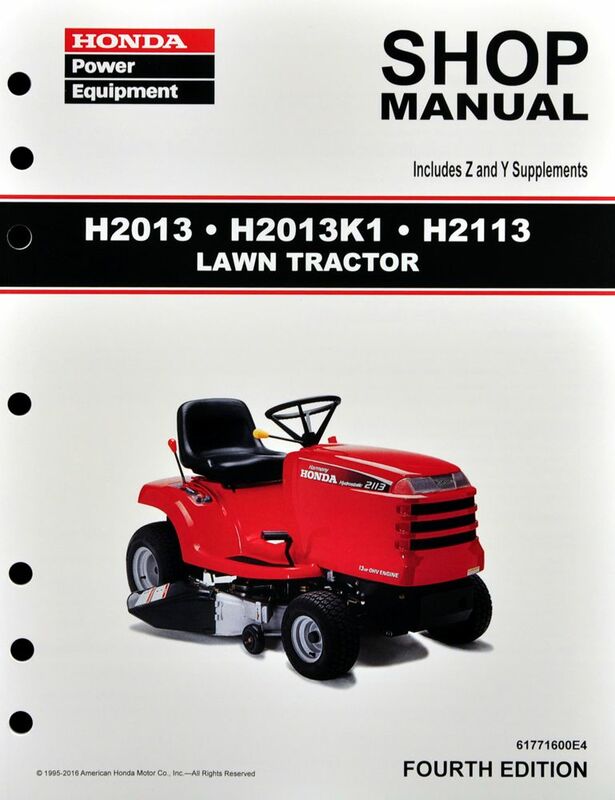 The Honda H2013, H2013K1, H2113 Lawn Tractor Shop Manual covers service and repair procedures for the H2013, H2013K1, and H2113 lawn tractors. See images for Table of Contents and sample pages; bound, black/white, 8 1/2" x 11", 7-hole punched, 122 pages. Enter your serial number prefix (such as MZBF) in the search box to locate applicable shop manuals, parts catalogs, and free downloads. 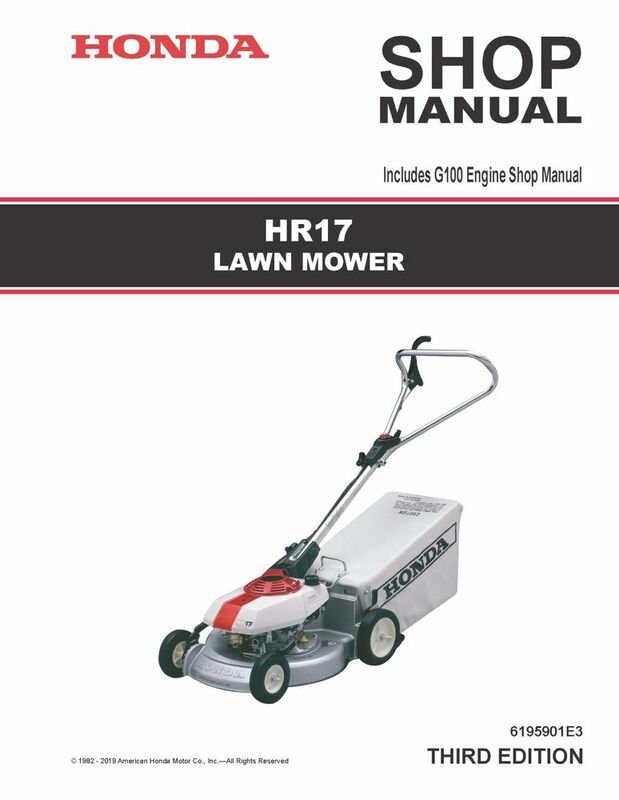 The Honda HR17 Lawn Mower Shop Manual covers service and repair procedures for the HR17 lawn mower. Enter your serial number prefix (such as HR17) in the search box to locate applicable shop manuals, parts catalogs, and free downloads. 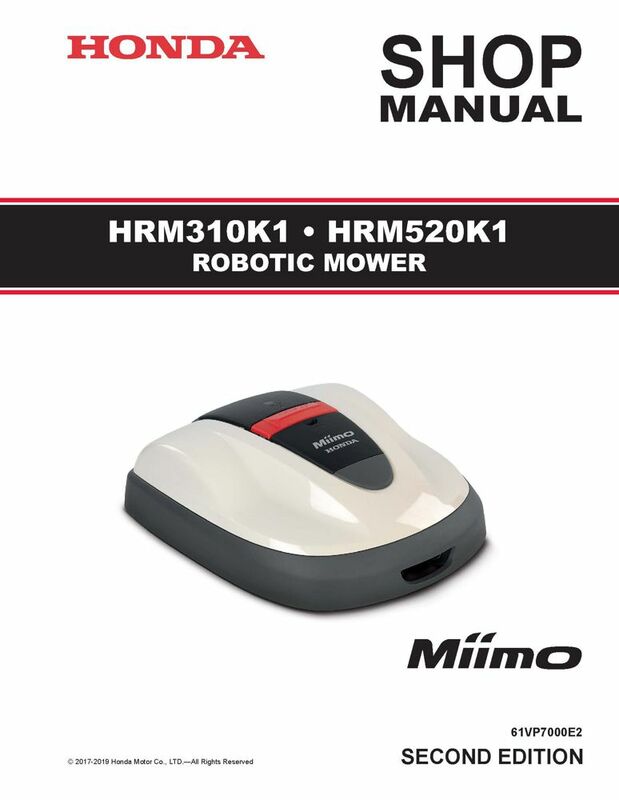 The Honda HRM310, HRM520 Robotic Lawn Mower Shop Manual covers service and repair procedures for the HRM310 and HRM520 robotic lawn mowers. See images for Table of Contents and sample pages; bound, black/white, 8 1/2" x 11", 7-hole punched, 162 pages. Enter your serial number prefix (such as MBEF) in the search box to locate applicable shop manuals, parts catalogs, and free downloads. 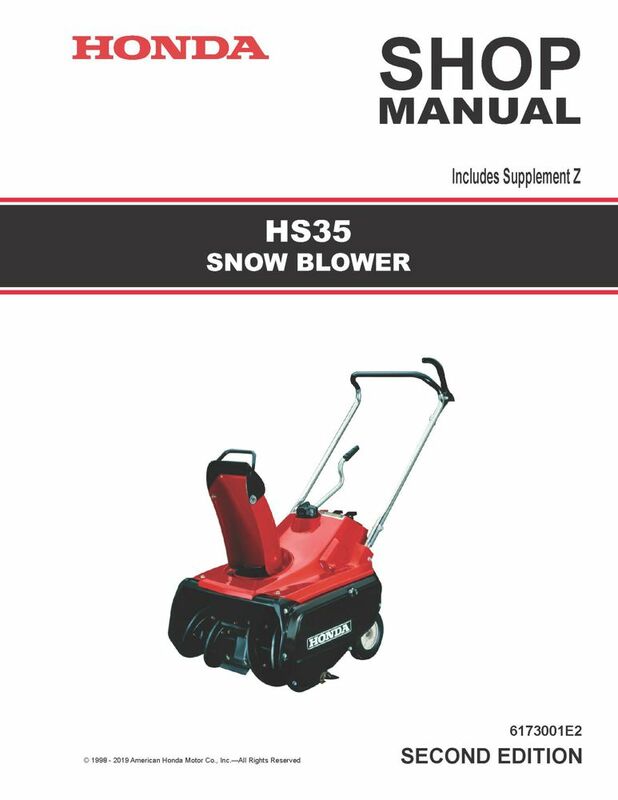 The Honda HS35 Snow Thrower Shop Manual covers service and repair procedures for the HS35 snow throwers. See images for Table of Contents and sample pages; bound, b/w, 8 1/2 x 11, 7-hole punched, 50 pages. Enter your serial number prefix (such as HS35) in the search box to locate applicable shop manuals, parts catalogs, and free downloads. 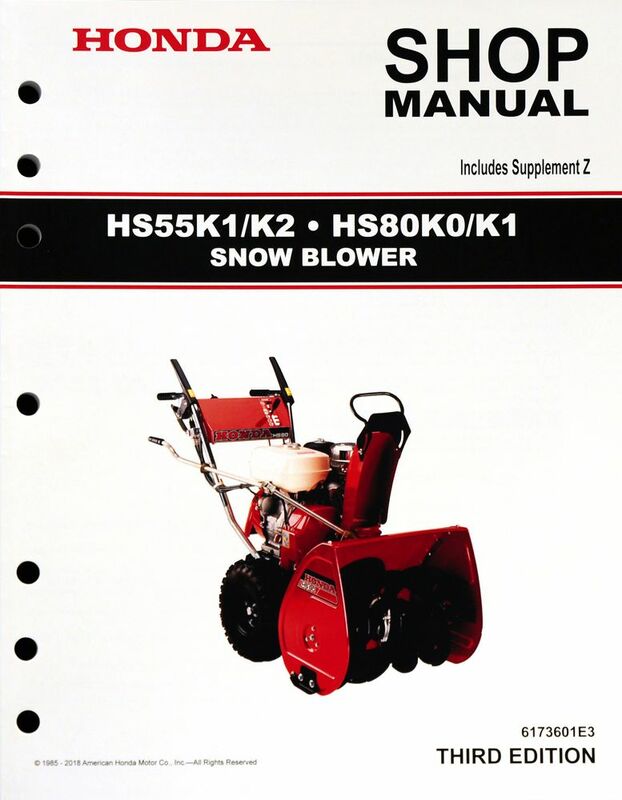 The Honda HS50 Snow Blower Shop Manual covers service and repair procedures for the HS50 snow blowers. See images for Table of Contents and sample pages; bound, b/w, 8 1/2 x 11, 7-hole punched, 62 pages. Enter your serial number prefix (such as HS50) in the search box to locate applicable shop manuals, parts catalogs, and free downloads. 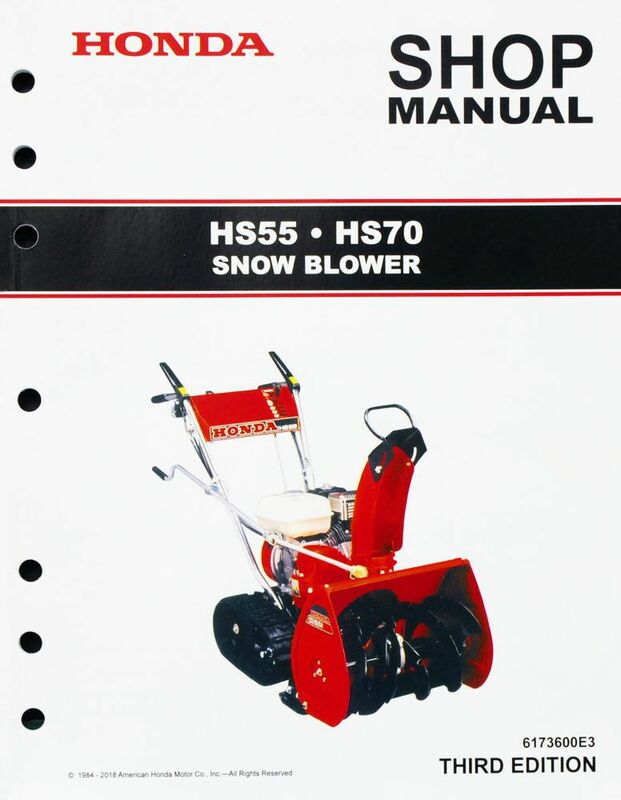 The Honda HS55, HS70 Snow Blower Shop Manual covers service and repair procedures for the HS55K0 and HS70 snow blowers. See images for Table of Contents and sample pages; bound, b/w, 8 1/2 x 11, 7-hole punched, 98 pages. Enter your serial number prefix (such as SA1) in the search box to locate applicable shop manuals, parts catalogs, and free downloads. 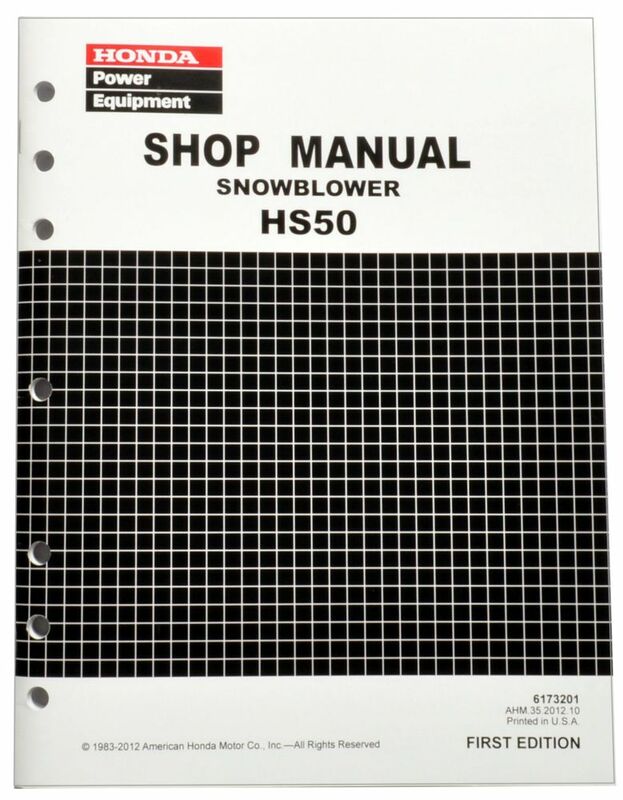 The Honda HS55, HS80 Snow Blower Shop Manual covers service and repair procedures for the HS55K1, HS55K2, HS80K0, and HS80K1 snow blowers. See images for Table of Contents and sample pages; bound, b/w, 8 1/2 x 11, 7-hole punched, 119 pages. 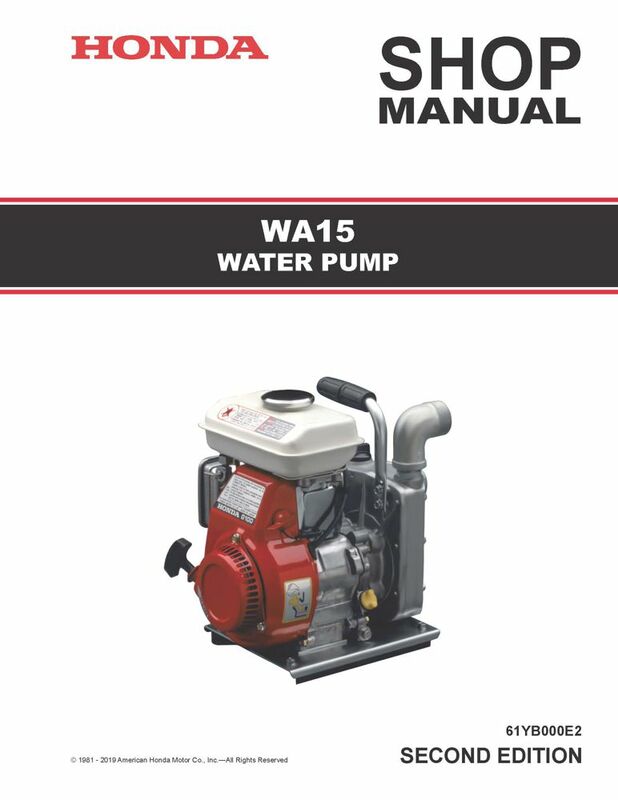 The Honda WA15 Water Pump Shop Manual covers service and repair procedures for the WA15 water pump. See images for Table of Contents and sample pages; bound, black/white, 8 1/2" x 11", 7-hole punched, 44 pages. Enter your serial number prefix (such as G100) in the search box to locate applicable shop manuals, parts catalogs, and free downloads. 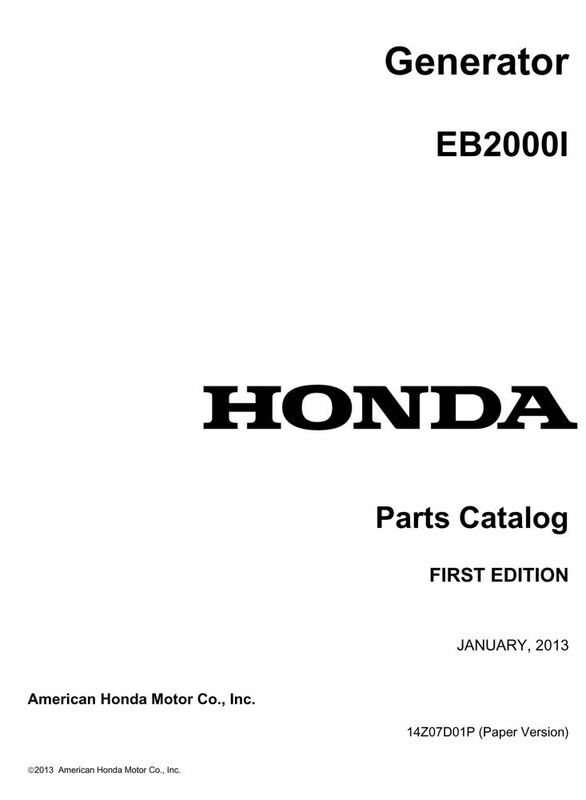 The Honda EB2000i Generator Shop Manual covers service and repair procedures for the EB2000i generators. Enter your serial number prefix (such as EBCJ) in the search box to locate applicable shop manuals, parts catalogs, and free downloads. 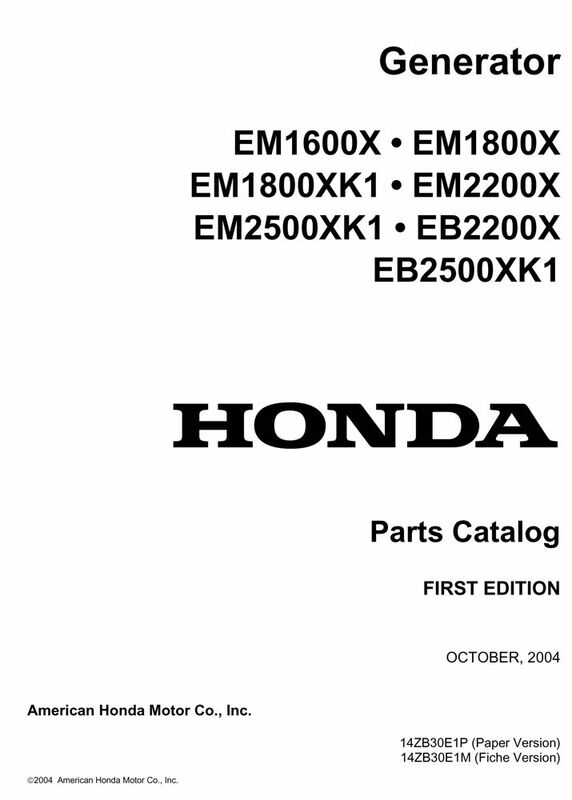 The Honda EM1600X, EM1800X, EM2200X, EB2200X, EM1800XK1, EM2500XK1, EB2500XK1 Generator Shop Manual covers service and repair procedures for the EM1600X, EM1800X, EM2200X, EB2200X, EM1800XK1, EM2500XK1, and EB2500XK1 generators. Enter your serial number prefix (such as EZCN) in the search box to locate applicable shop manuals, parts catalogs, and free downloads. 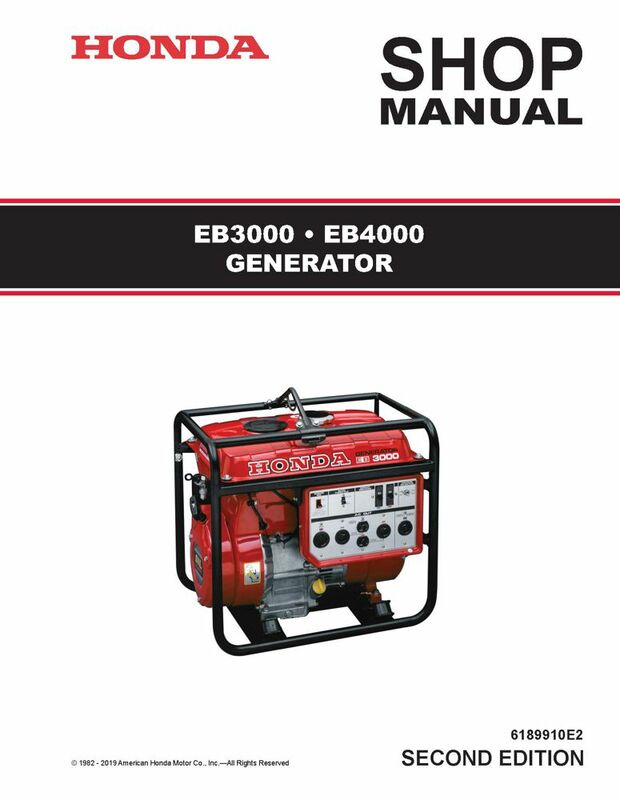 The Honda EB3000, EB4000 Generator Shop Manual covers service and repair procedures for the EB3000 and EB4000 generators. Enter your serial number prefix (such as GE400) in the search box to locate applicable shop manuals, parts catalogs, and free downloads. 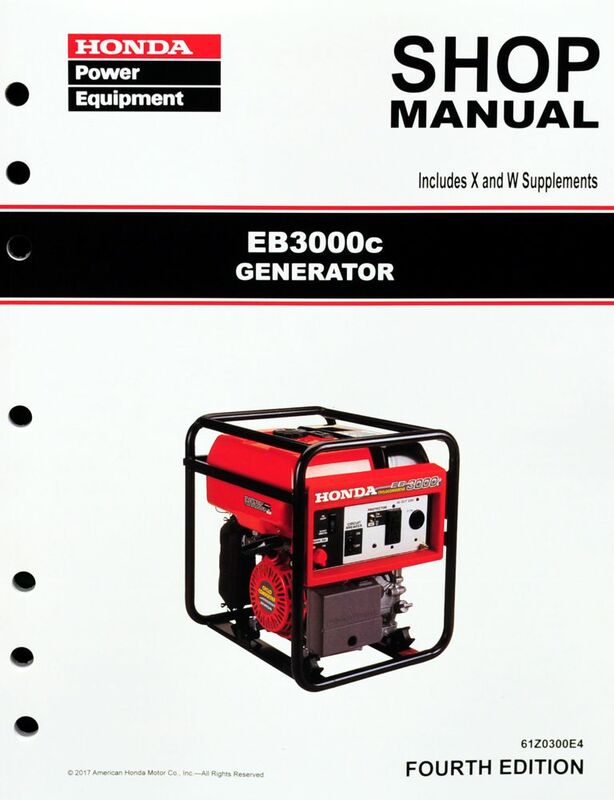 The Honda EB3000c Generator Shop Manual covers service and repair procedures for the EB3000cK0 and EB3000cK1 generators. Enter your serial number prefix (such as EZGP) in the search box to locate applicable shop manuals, parts catalogs, and free downloads. 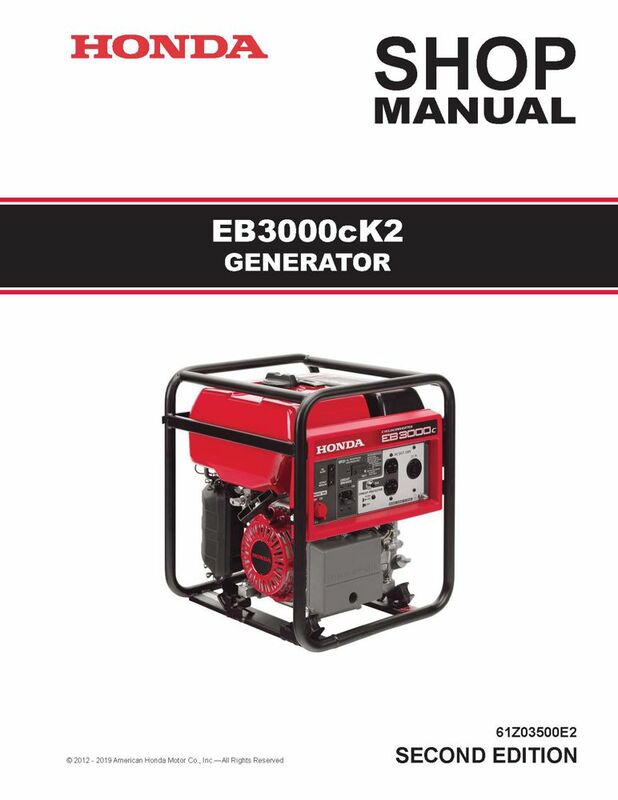 The Honda EB3000cK2 Generator Shop Manual covers service and repair procedures for the EB3000cK2 generators. 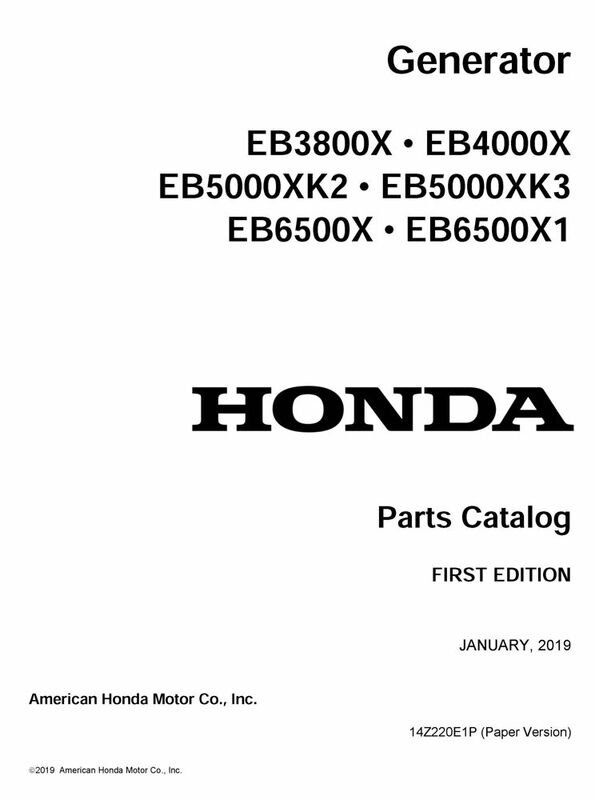 The Honda EB3500/5000X, EM3500X/SX, EM5000X/SX Generator Shop Manual covers service and repair procedures for the EB3500X, EB3500XK1, EB5000X, EB5000XK1, EM3500X, EM3500SX, EM3500SXK1, EM5000X, EM5000SX, and EM5000SXK1 generators. Enter your serial number prefix (such as EA7) in the search box to locate applicable shop manuals, parts catalogs, and free downloads. 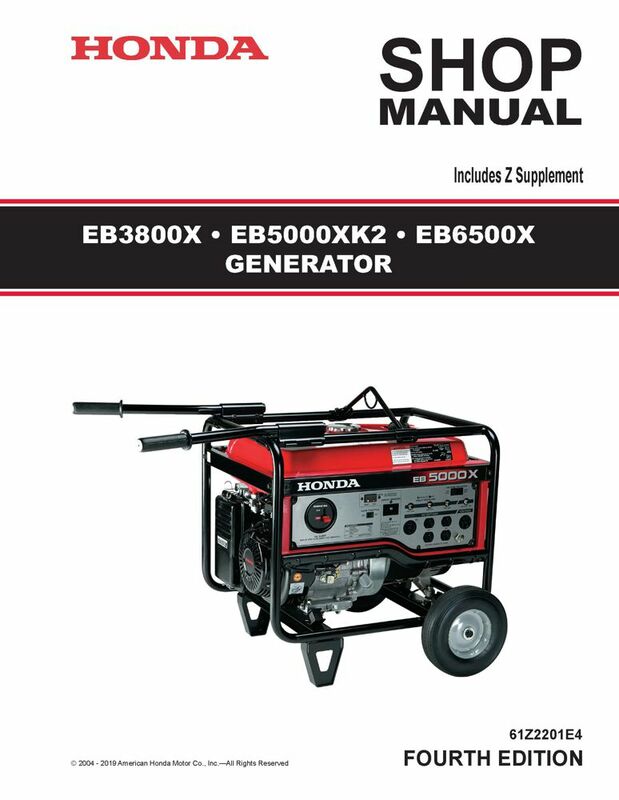 The Honda EB3800X, EB5000XK2, EB6500X Generator Shop Manual covers service and repair procedures for the EB3800X, EB5000XK2, and EB6500X generators. Enter your serial number prefix (such as EALC) in the search box to locate applicable shop manuals, parts catalogs, and free downloads. 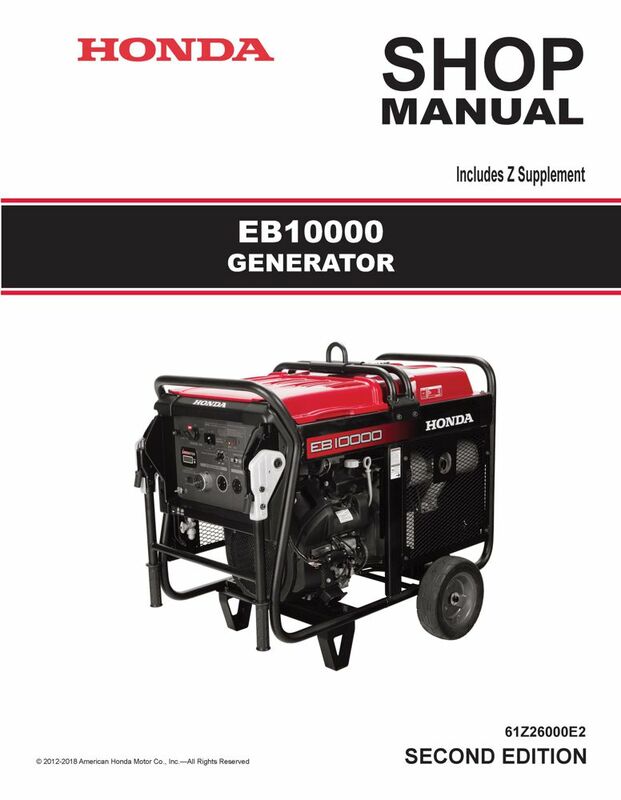 The Honda EB4000X, EB5000XK3, EB6500X1 Generator Shop Manual covers service and repair procedures for the EB4000X, EB5000XK3, and EB6500X1 generators. Enter your serial number prefix (such as EBLC) in the search box to locate applicable shop manuals, parts catalogs, and free downloads. 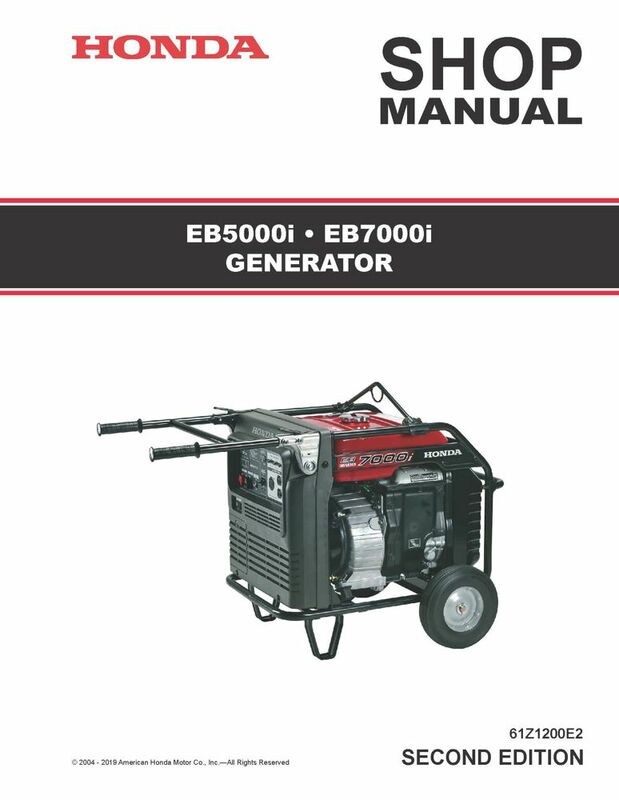 The Honda EB5000i, EB7000i Generator Shop Manual covers service and repair procedures for the EB5000i and EB7000i generators. Enter your serial number prefix (such as EAKJ) in the search box to locate applicable shop manuals, parts catalogs, and free downloads. 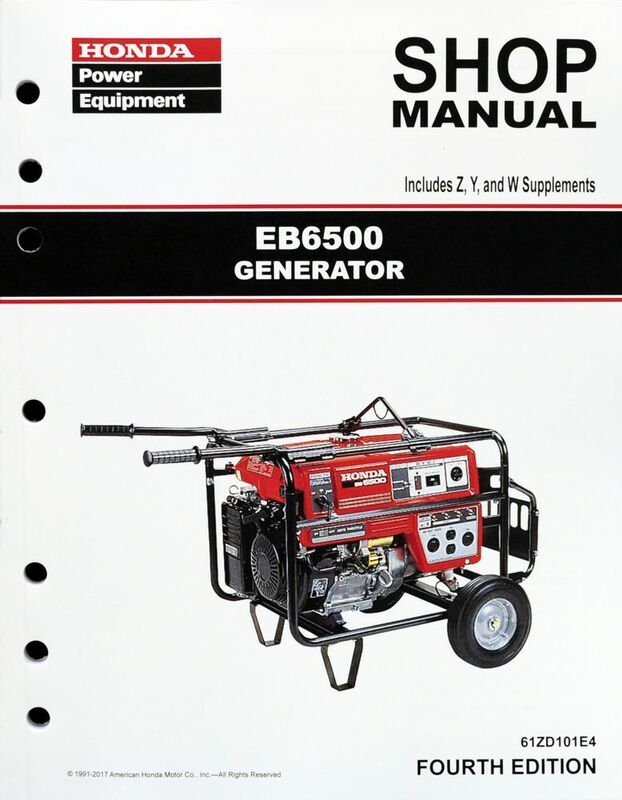 The Honda EB6500SX Generator Shop Manual covers service and repair procedures for the EB6500SX generators. Enter your serial number prefix (such as EZCH) in the search box to locate applicable shop manuals, parts catalogs, and free downloads. 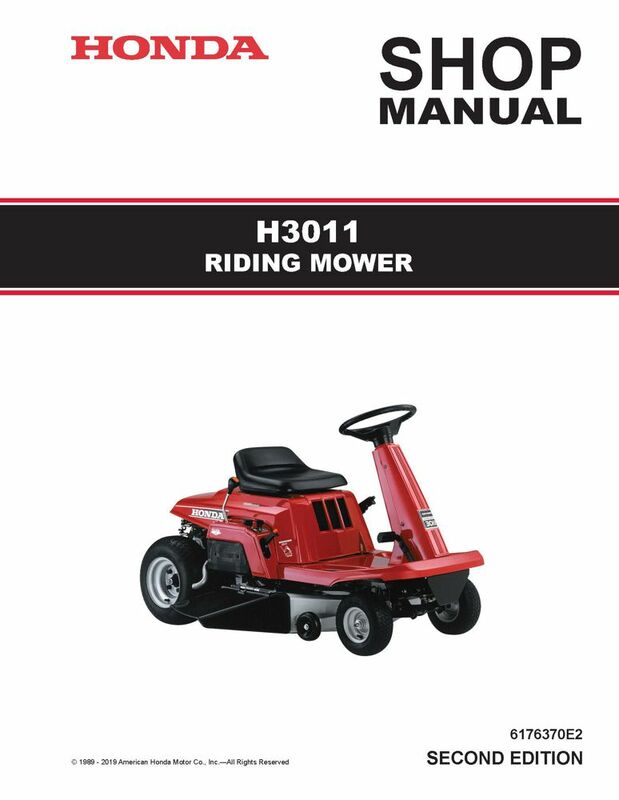 The Honda H3011 Riding Mower Shop Manual covers service and repair procedures for the H3011 riding mower. See images for Table of Contents and sample pages; bound, black/white, 8 1/2" x 11", 7-hole punched, 150 pages. Enter your serial number prefix (such as MZAJ) in the search box to locate applicable shop manuals, parts catalogs, and free downloads. 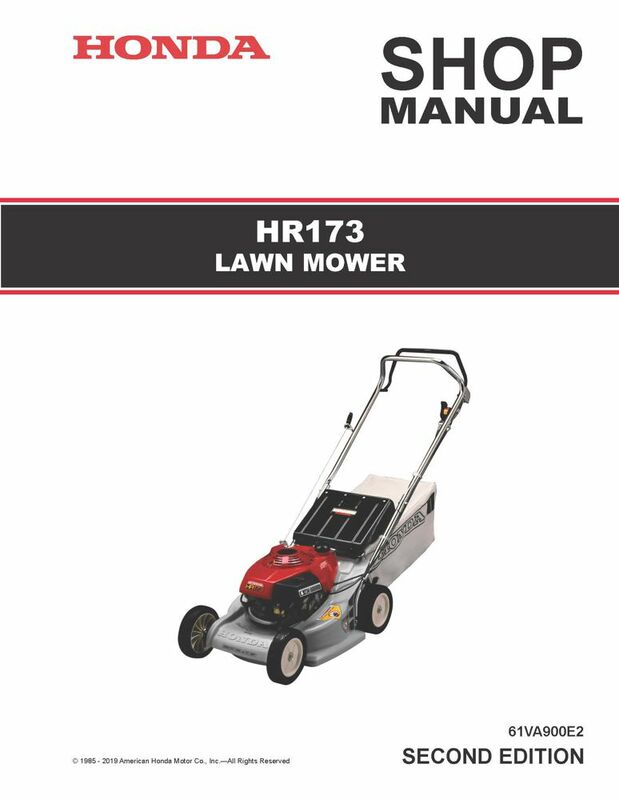 The Honda HR173 Lawn Mower Shop Manual covers service and repair procedures for the HR173 lawn mower. See images for Table of Contents and sample pages; bound, black/white, 8 1/2" x 11", 7-hole punched, 50 pages. Enter your serial number prefix (such as MA2R) in the search box to locate applicable shop manuals, parts catalogs, and free downloads. 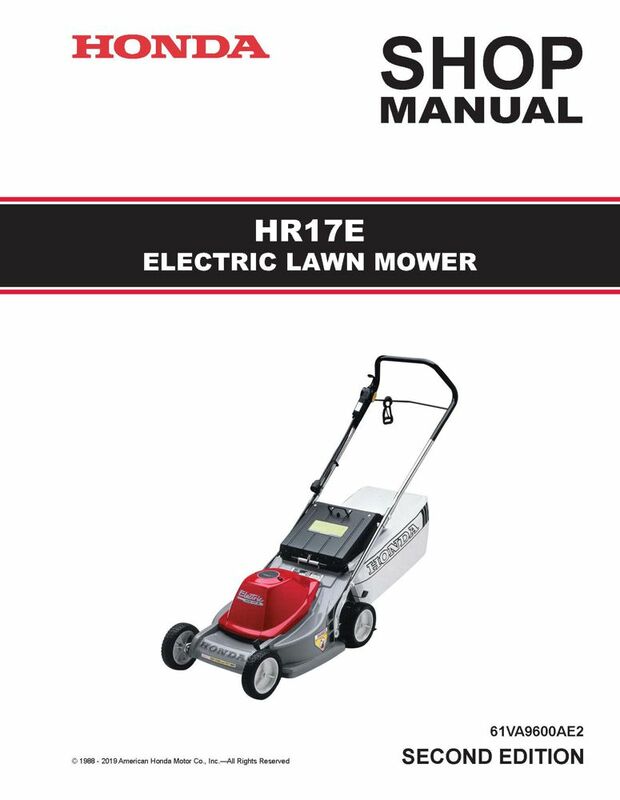 The Honda HR17E Lawn Mower Shop Manual covers service and repair procedures for the HR17E lawn mower. See images for Table of Contents and sample pages; bound, black/white, 8 1/2" x 11", 7-hole punched, 32 pages. Enter your serial number prefix (such as MAER) in the search box to locate applicable shop manuals, parts catalogs, and free downloads. 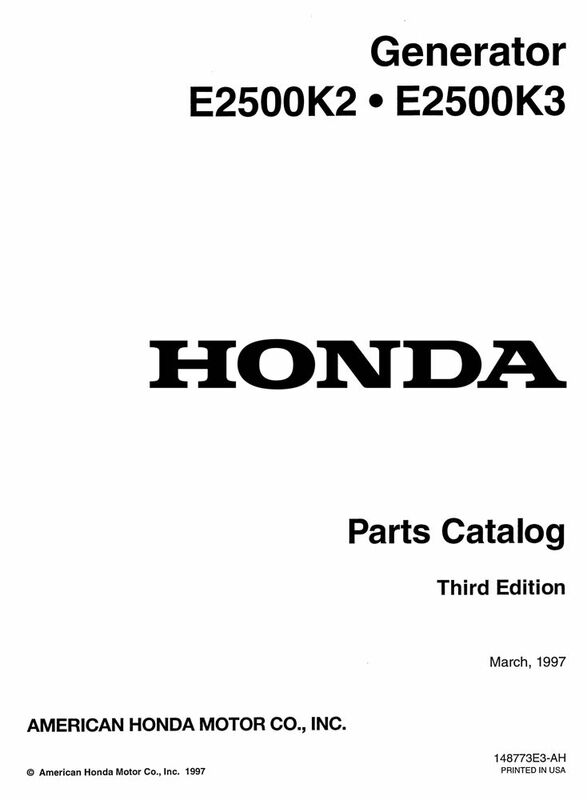 The Honda HR194, HR214, HRA214 Lawn Mower Shop Manual covers service and repair procedures for the HR194, HR214, and HRA214 lawn mowers. See images for Table of Contents and sample pages; bound, black/white, 8 1/2" x 11", 7-hole punched, 95 pages. 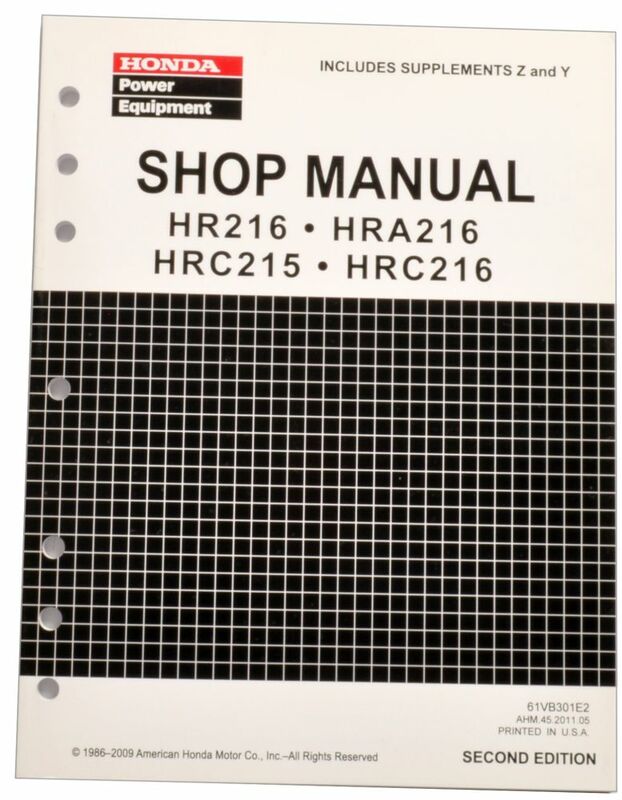 Enter your serial number prefix (such as HRA214) in the search box to locate applicable shop manuals, parts catalogs, and free downloads. 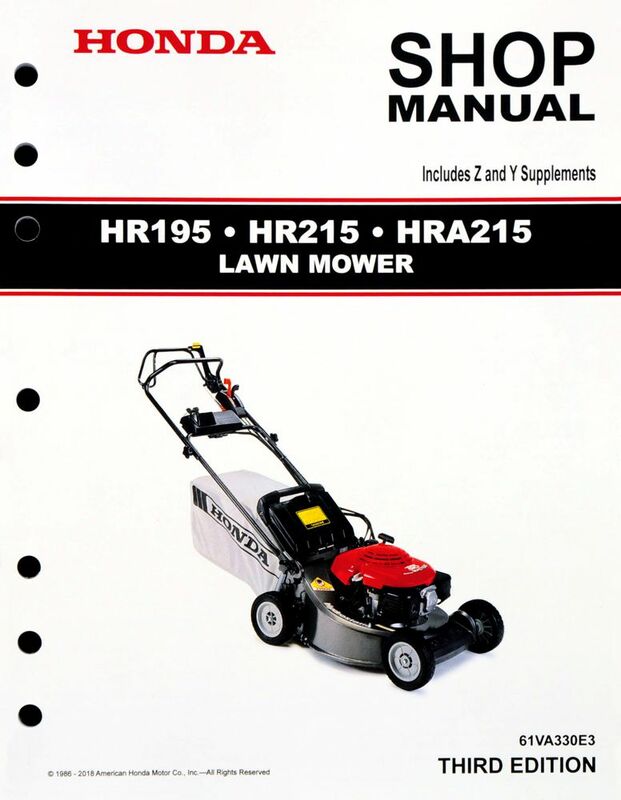 The Honda HR195, HR215, HRA215 Lawn Mower Shop Manual covers service and repair procedures for the HR195, HR215, and HRA215 lawn mowers. See images for Table of Contents and sample pages; bound, black/white, 8 1/2" x 11", 7-hole punched, 157 pages. Enter your serial number prefix (such as MZAL) in the search box to locate applicable shop manuals, parts catalogs, and free downloads. 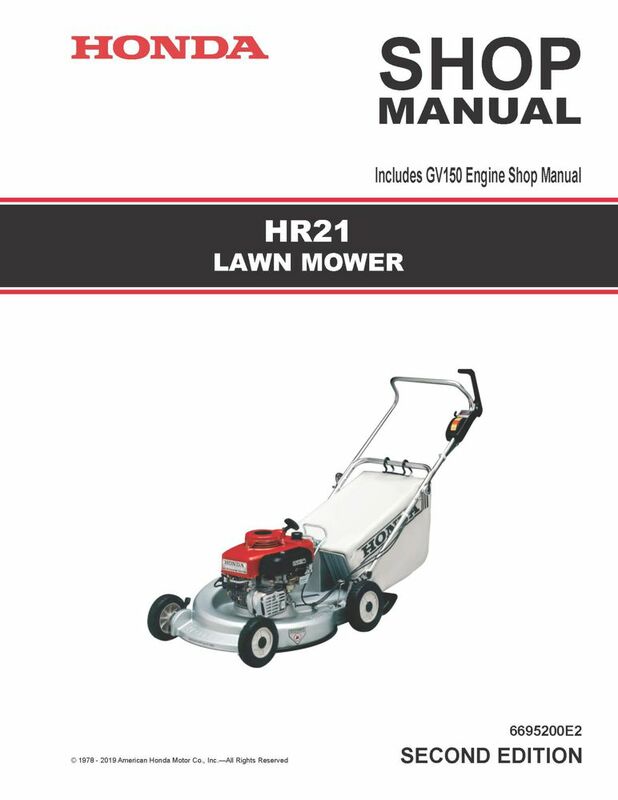 The Honda HR21 Lawn Mower Shop Manual covers service and repair procedures for the HR21 lawn mower. Enter your serial number prefix (such as HR21) in the search box to locate applicable shop manuals, parts catalogs, and free downloads. 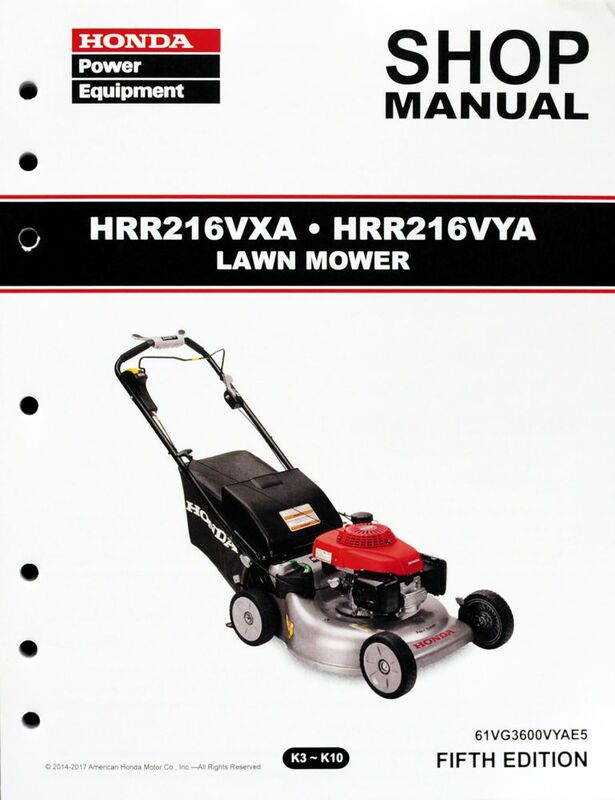 The Honda HR21-5 Lawn Mower Shop Manual covers service and repair procedures for the HR21-5 lawn mower. See images for Table of Contents and sample pages; bound, black/white, 8 1/2" x 11", 7-hole punched, 60 pages. Enter your serial number prefix (such as HR21-5) in the search box to locate applicable shop manuals, parts catalogs, and free downloads. 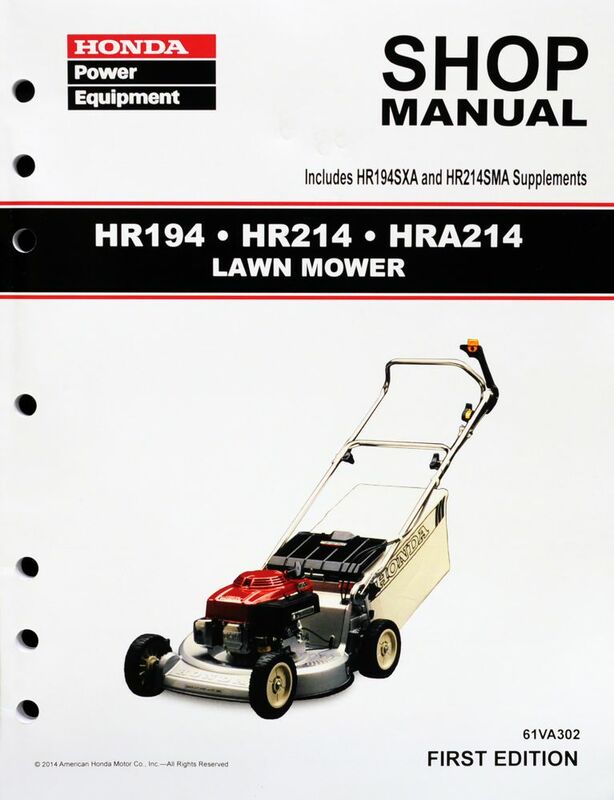 The Honda HR216, HRA216, HRC215, HRC216 Lawn Mower Shop Manual covers service and repair procedures for the HR216, HRA216, HRC215, and HRC216 lawn mowers. See images for Table of Contents and sample pages; bound, black/white, 8 1/2" x 11", 7-hole punched, 141 pages. Enter your serial number prefix (such as MZAU) in the search box to locate applicable shop manuals, parts catalogs, and free downloads. The Honda HRA-21 Lawn Mower Shop Manual covers service and repair procedures for the HRA-21 lawn mower. See images for Table of Contents and sample pages; bound, black/white, 8 1/2" x 11", 7-hole punched, 54 pages. Enter your serial number prefix (such as HRA21) in the search box to locate applicable shop manuals, parts catalogs, and free downloads. 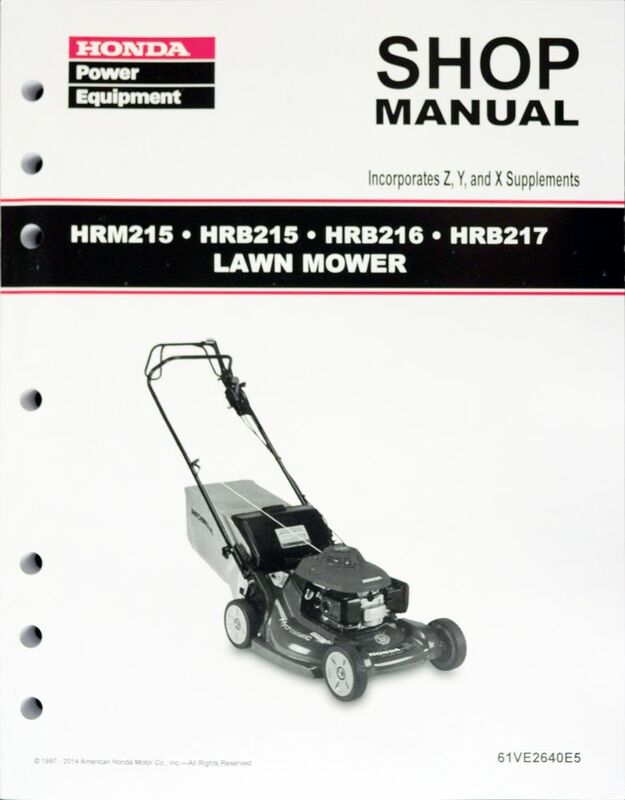 The Honda HRB215, HRM215, HRB216, HRB217 Lawn Mower Shop Manual covers service and repair procedures for the HRB215, HRM215, HRB216, and HRB217 lawn mowers. See images for Table of Contents and sample pages; bound, black/white, 8 1/2" x 11", 7-hole punched, 220 pages. Enter your serial number prefix (such as MZBB) in the search box to locate applicable shop manuals, parts catalogs, and free downloads. 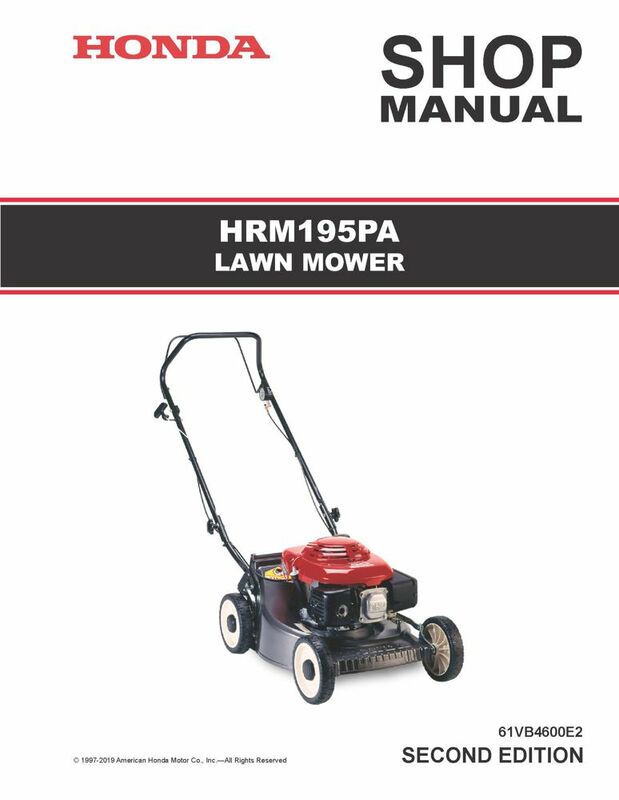 The Honda HRM195PA Lawn Mower Shop Manual covers service and repair procedures for the HRM195PA lawn mower. See images for Table of Contents and sample pages; unbound, black/white, 8 1/2" x 11", 7-hole punched, 66 pages. Enter your serial number prefix (such as MZBV) in the search box to locate applicable shop manuals, parts catalogs, and free downloads. 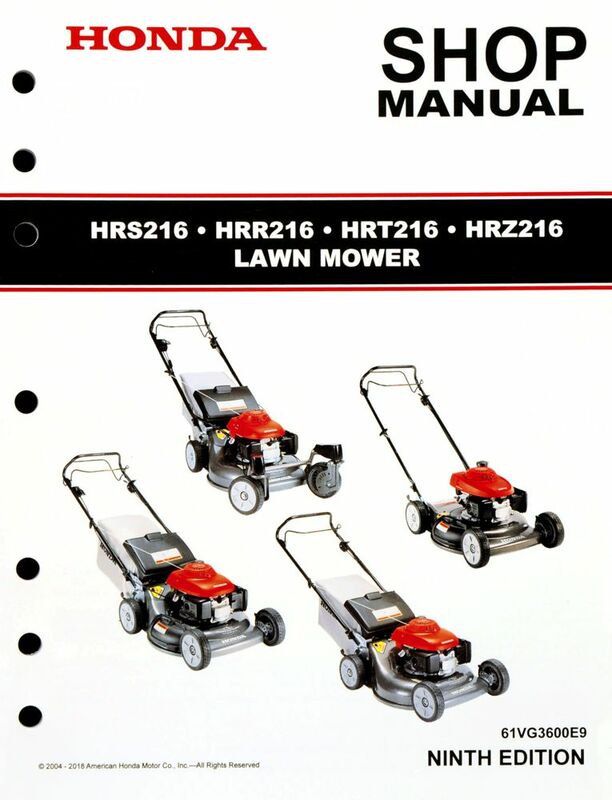 The Honda HRR216, HRS216, HRT216, HRZ216 Lawn Mower Shop Manual covers service and repair procedures for the HRR216 (types PDA, SDA, S3DA, TDA), HRS216 (all types), HRT216 (all types), and HRZ216 (all types) lawn mowers. Enter your serial number prefix (such as MZCG) in the search box to locate applicable shop manuals, parts catalogs, and free downloads. 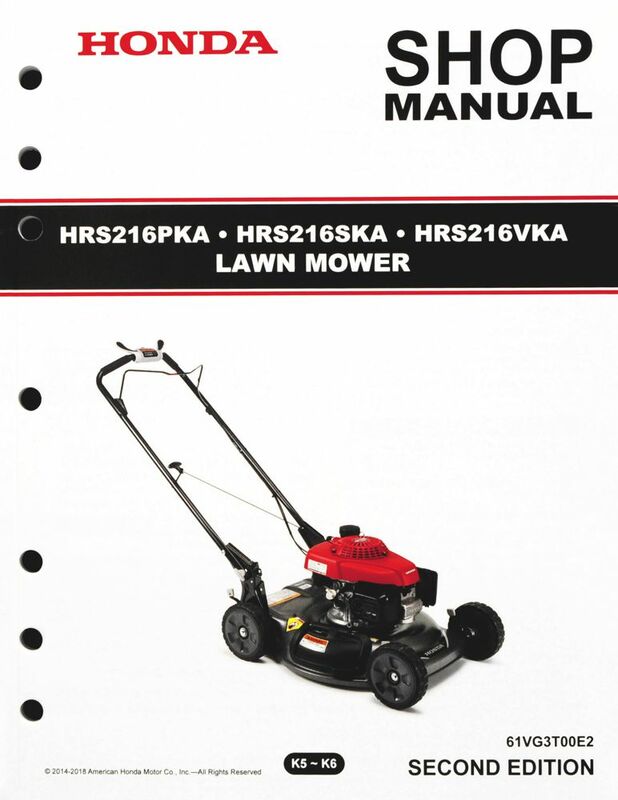 The Honda HRR216 PKA Lawn Mower Shop Manual covers service and repair procedures for the HRR216 PKA type lawn mower. See images for Table of Contents and sample pages; bound, black/white, 8 1/2" x 11", 7-hole punched, 102 pages. 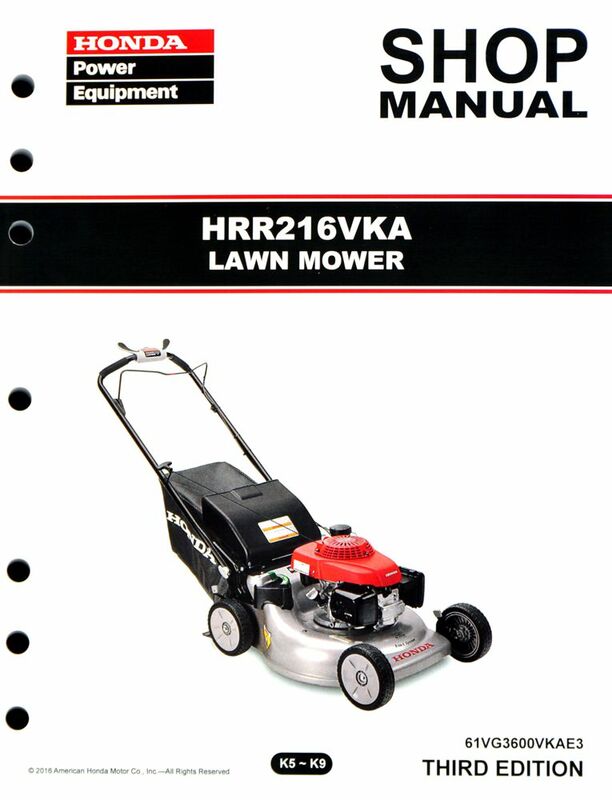 The Honda HRR216 VKA Type Lawn Mower Shop Manual covers service and repair procedures for the HRR216 VKA type lawn mower. See images for Table of Contents and sample pages; bound, black/white, 8 1/2" x 11", 7-hole punched, 175 pages. 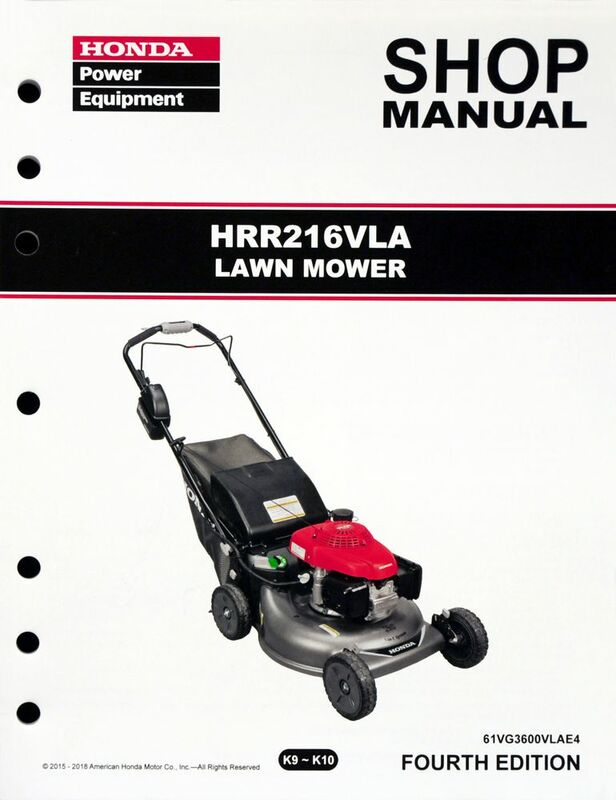 The Honda HRR216 VLA Lawn Mower Shop Manual covers service and repair procedures for the HRR216 VLA type lawn mower. See images for Table of Contents and sample pages; bound, black/white, 8 1/2" x 11", 7-hole punched, 148 pages. 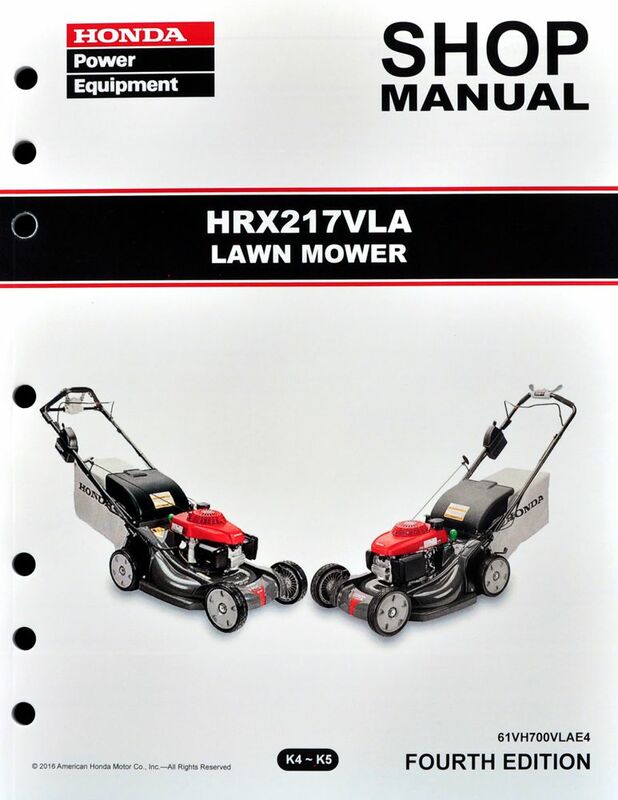 The Honda HRR216 VXA and HRR216 VYA Lawn Mower Shop Manual covers service and repair procedures for the HRR216 VXA and VYA type lawn mowers. See images for Table of Contents and sample pages; bound, black/white, 8 1/2" x 11", 7-hole punched, 201 pages. 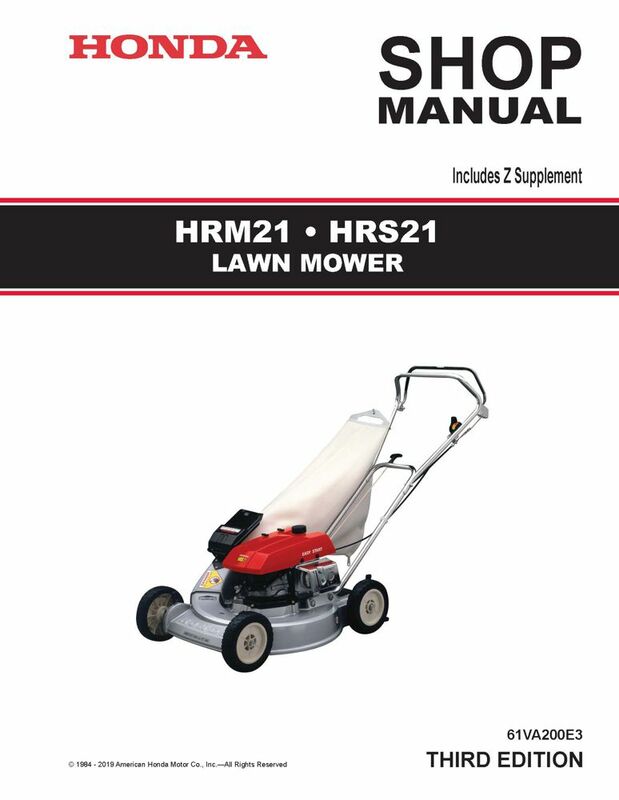 The Honda HRS21, HRM21 Lawn Mower Shop Manual covers service and repair procedures for the HRS21 and HRM21 lawn mowers. Enter your serial number prefix (such as MZAV) in the search box to locate applicable shop manuals, parts catalogs, and free downloads. 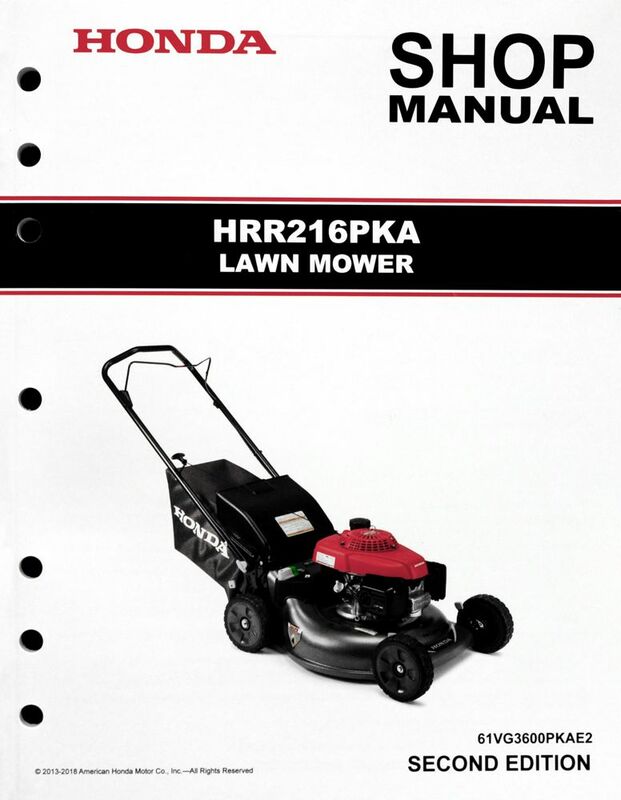 The Honda HRS216PKA, HRS216SKA, HRS216VKA Lawn Mower Shop Manual cover service and repair procedures for HRS216 PKA, SKA, and VKA type lawn mowers. See images for Table of Contents and sample pages; bound, black/white, 8 1/2" x 11", 7-hole punched, 104 pages. Enter your serial number prefix (such as MZBZ) in the search box to locate applicable shop manuals, parts catalogs, and free downloads. 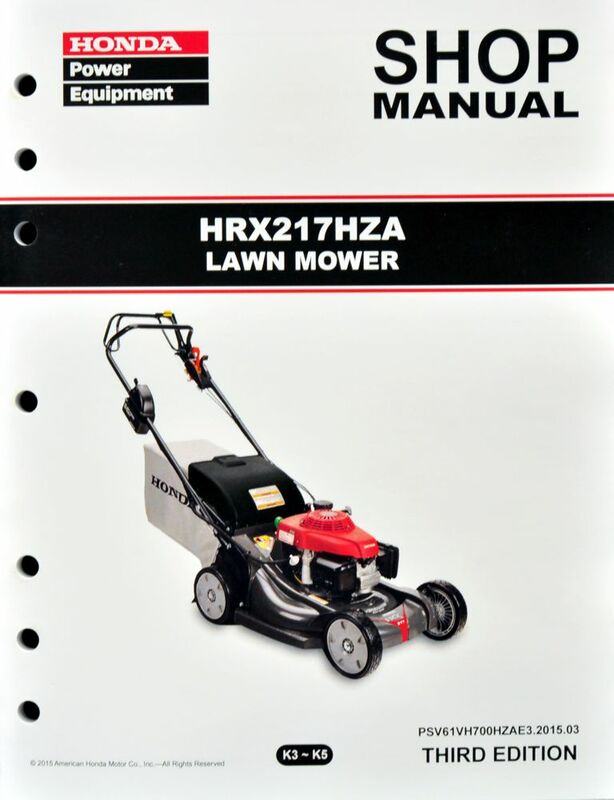 The Honda HRX217 Lawn Mower Shop Manual covers service and repair procedures for the HRX217 HXA, HMA, and TDA type lawn mowers. Enter your serial number prefix (such as MAGA) in the search box to locate applicable shop manuals, parts catalogs, and free downloads. 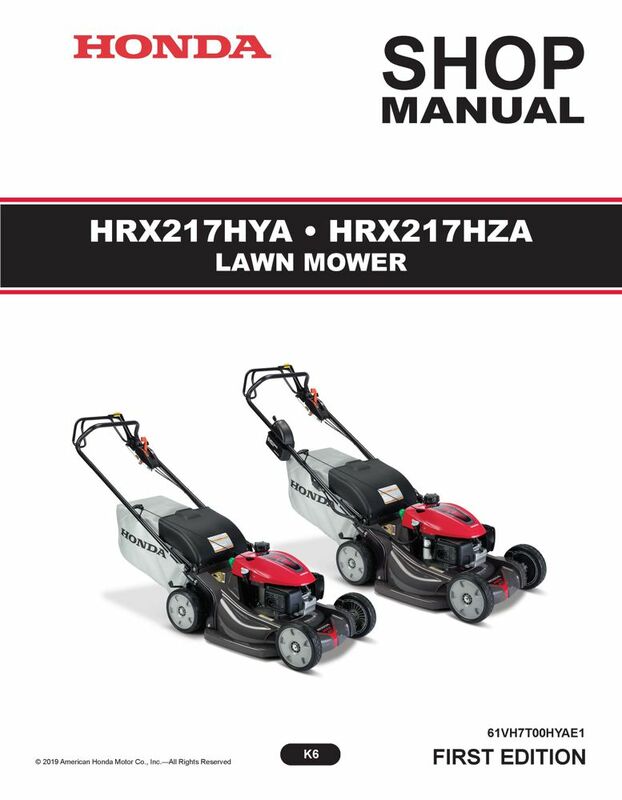 The Honda HRX217 HYA HZA Lawn Mower Shop Manual covers service and repair procedures for the NEW HRX217 HYA and HZA type lawn mowers. Please check your serial number against the detail. Also applies to Australian and Canadian models. See images for Table of Contents and sample pages; bound, black/white, 8 1/2" x 11", 7-hole punched, 168 pages. Enter your serial number prefix (such as MAMA) in the search box to locate applicable shop manuals, parts catalogs, and free downloads. 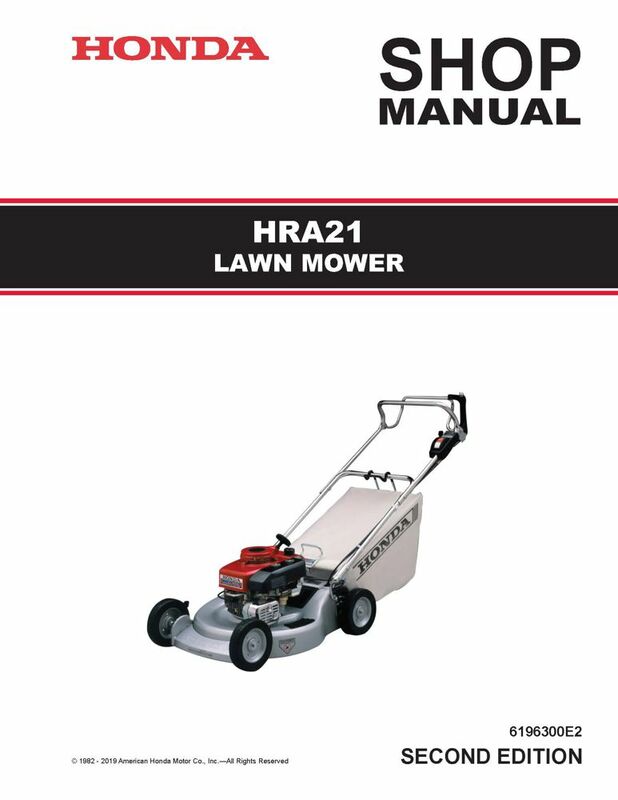 The Honda HRX217 HYA Lawn Mower Shop Manual covers service and repair procedures for the HRX217 HYA K3~K5 type lawn mower. Please check your serial number against the detail. See images for Table of Contents and sample pages; bound, black/white, 8 1/2" x 11", 7-hole punched, 144 pages. 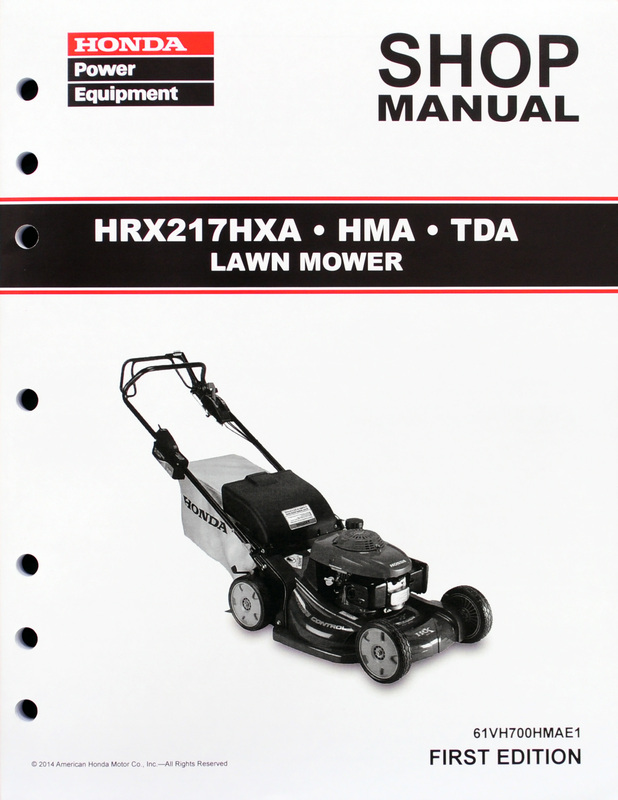 The Honda HRX217 HZA Lawn Mower Shop Manual covers service and repair procedures for the HRX217 HZA K3~K5 type lawn mower. Please check your serial number against the detail. 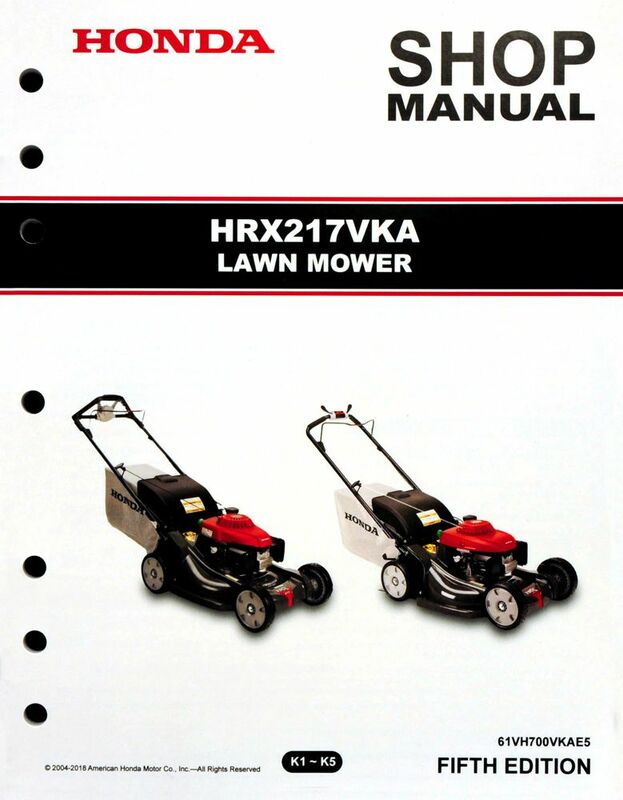 The Honda HRX217 VKA Lawn Mower Shop Manual covers service and repair procedures for the HRX217 VKA K1~K5 type lawn mower. Please check your serial number against the detail. See images for Table of Contents and sample pages; bound, black/white, 8 1/2" x 11", 7-hole punched, 156 pages. 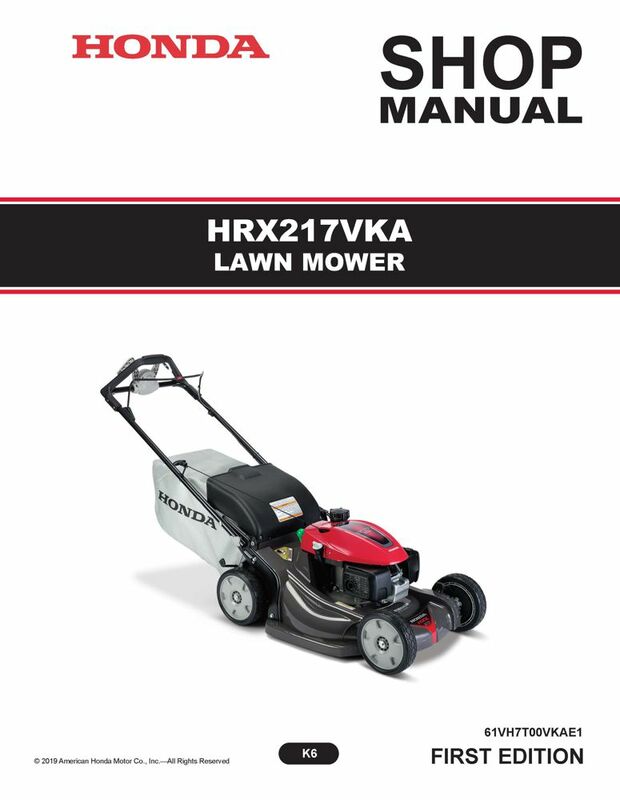 The Honda HRX217 VKA Lawn Mower Shop Manual covers service and repair procedures for the NEW HRX217 VKA K6 type lawn mower. Please check your serial number against the detail. See images for Table of Contents and sample pages; bound, black/white, 8 1/2" x 11", 7-hole punched, 134 pages. The Honda HRX217 VLA Lawn Mower Shop Manual covers service and repair procedures for the HRX217 VLA K4~K5 type lawn mower. Please check your serial number against the detail. See images for Table of Contents and sample pages; bound, black/white, 8 1/2" x 11", 7-hole punched, 153 pages. The Honda HRX217 VLA Lawn Mower Shop Manual covers service and repair procedures for the NEW HRX217 VLA K6 type lawn mower. Please check your serial number against the detail. See images for Table of Contents and sample pages; bound, black/white, 8 1/2" x 11", 7-hole punched, 146 pages. 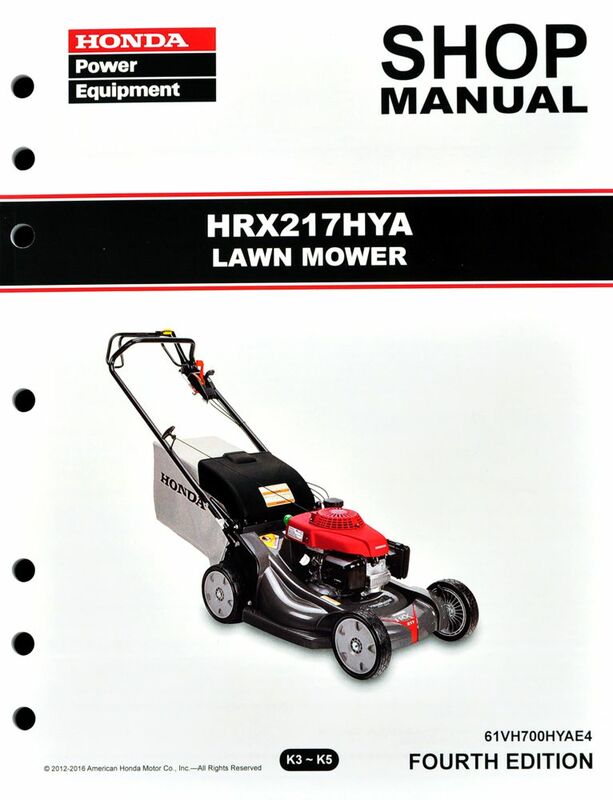 The Honda HRX217 VYA Lawn Mower Shop Manual covers service and repair procedures for the HRX217 VYA K5 type lawn mower. Please check your serial number against the detail. See images for Table of Contents and sample pages; bound, black/white, 8 1/2" x 11", 7-hole punched, 140 pages. 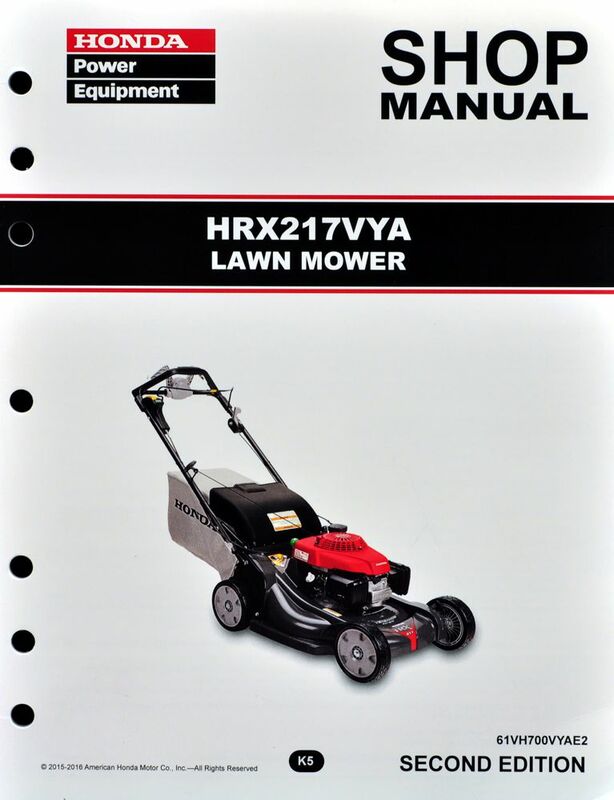 The Honda HRX217 VYA Lawn Mower Shop Manual covers service and repair procedures for the NEW HRX217 VYA K6 type lawn mower. Please check your serial number against the detail. 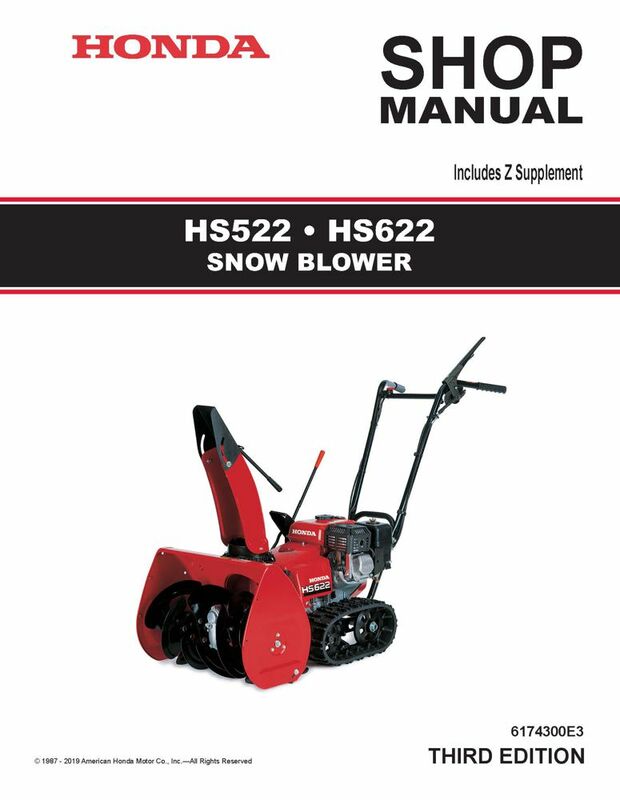 The Honda HS520A, HS520AS Snow Thrower Shop Manual covers service and repair procedures for the HS520A and HS520AS snow throwers. See images for Table of Contents and sample pages; bound, b/w, 8 1/2 x 11, 7-hole punched, 160 pages. Enter your serial number prefix (such as SZBG) in the search box to locate applicable shop manuals, parts catalogs, and free downloads. 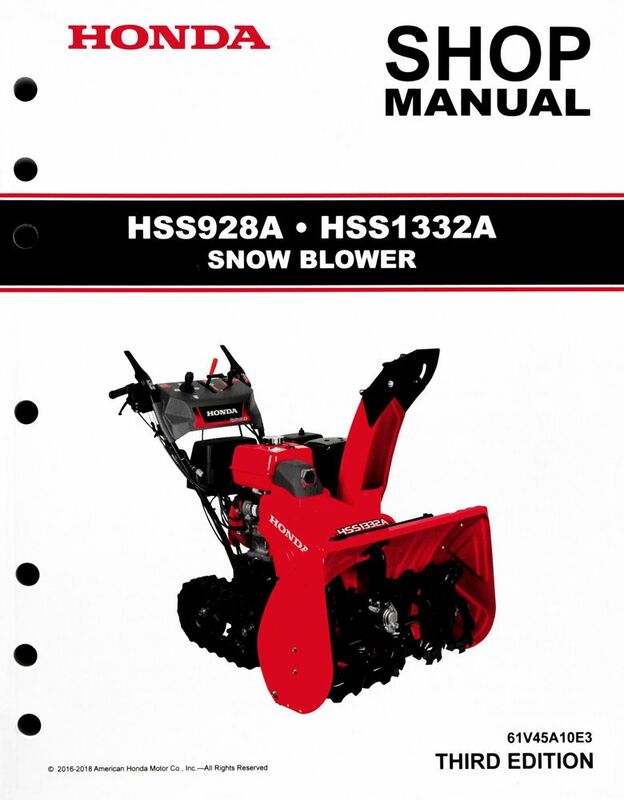 The Honda HS521, HS621 Snow Thrower Shop Manual covers service and repair procedures for the HS521 and HS621 snow throwers. See images for Table of Contents and sample pages; bound, b/w, 8 1/2 x 11, 7-hole punched, 101 pages. Enter your serial number prefix (such as SZAN) in the search box to locate applicable shop manuals, parts catalogs, and free downloads. 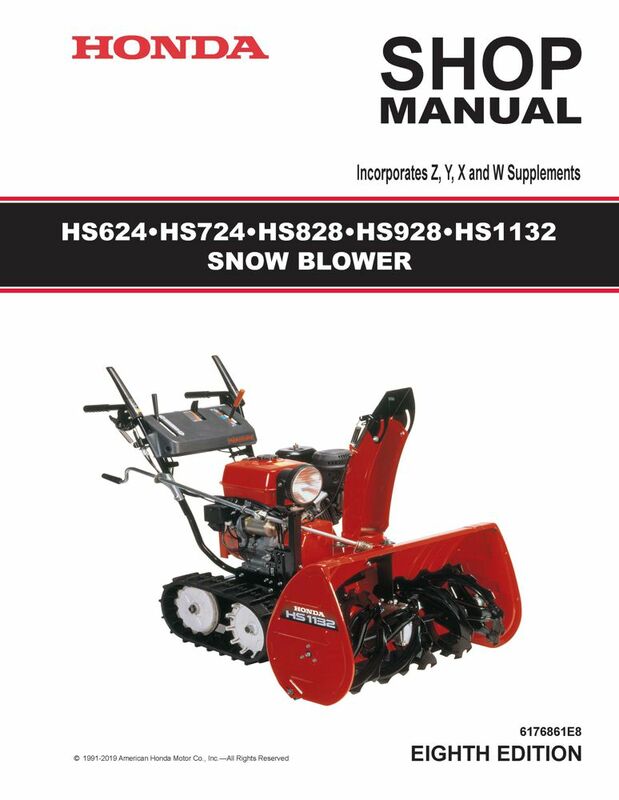 The Honda HS522, HS622 Snow Blower Shop Manual covers service and repair procedures for the HS522 and HS622 snow blowers. Enter your serial number prefix (such as SZAL) in the search box to locate applicable shop manuals, parts catalogs, and free downloads. The Honda HS624, HS724, HS828, HS928, HS1132 Snow Blower Shop Manual covers service and repair procedures for the HS624, HS724K0, HS828, HS928K0, and HS1132 snow blowers. See images for Table of Contents and sample pages; bound, b/w, 8 1/2 x 11, 7-hole punched, 184 pages. Enter your serial number prefix (such as SZBF) in the search box to locate applicable shop manuals, parts catalogs, and free downloads. 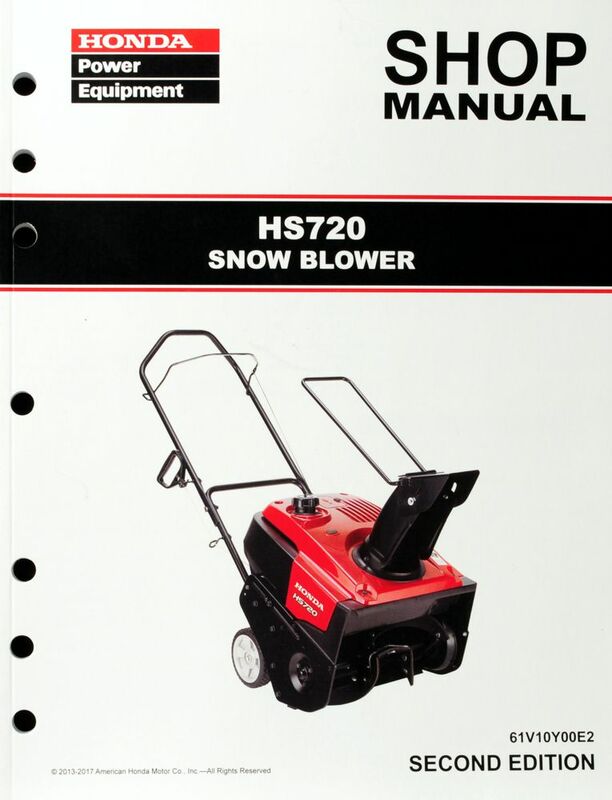 The Honda HS720 Snow Thrower Shop Manual covers service and repair procedures for the HS720A and HS720AS snow thrower for U.S. and Canadian markets. See images for Table of Contents and sample pages; bound, b/w, 8 1/2 x 11, 7-hole punched, 134 pages. Enter your serial number prefix (such as SAAA) in the search box to locate applicable shop manuals, parts catalogs, and free downloads. 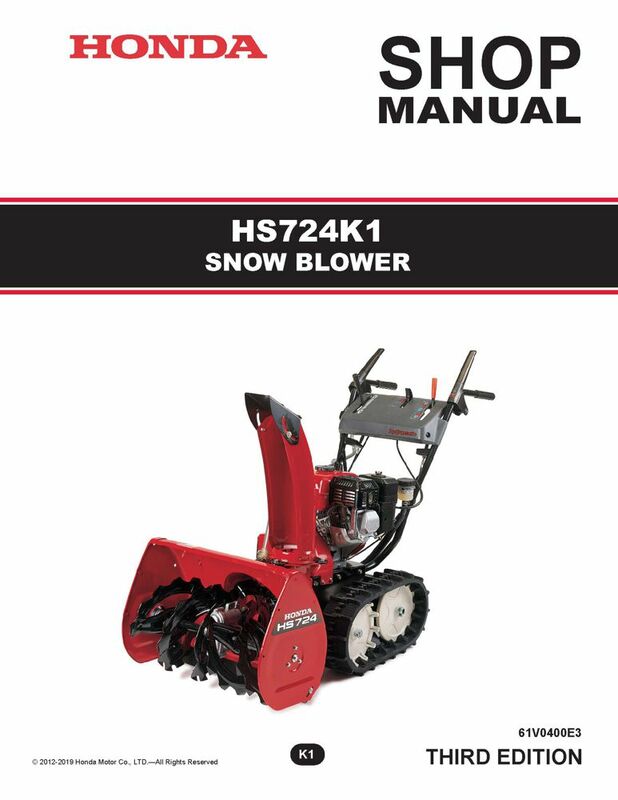 The Honda HS724K1 Snow Blower Shop Manual covers service and repair procedures for the HS724K1 snow blowers. See images for Table of Contents and sample pages; bound, b/w, 8 1/2 x 11, 7-hole punched, 220 pages. Enter your serial number prefix (such as SZBE) in the search box to locate applicable shop manuals, parts catalogs, and free downloads. 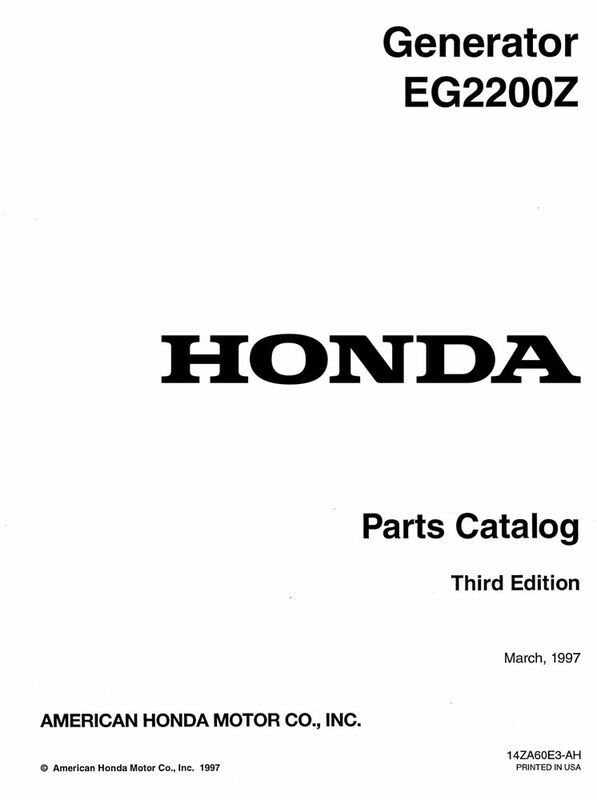 The Honda HS928K1, HS1332 Snow Blower Shop Manual covers service and repair procedures for the HS928K1 and HS1332K0 snow blowers. See images for Table of Contents and sample pages; bound, b/w, 8 1/2 x 11, 7-hole punched, 196 pages. Enter your serial number prefix (such as SAWJ) in the search box to locate applicable shop manuals, parts catalogs, and free downloads. 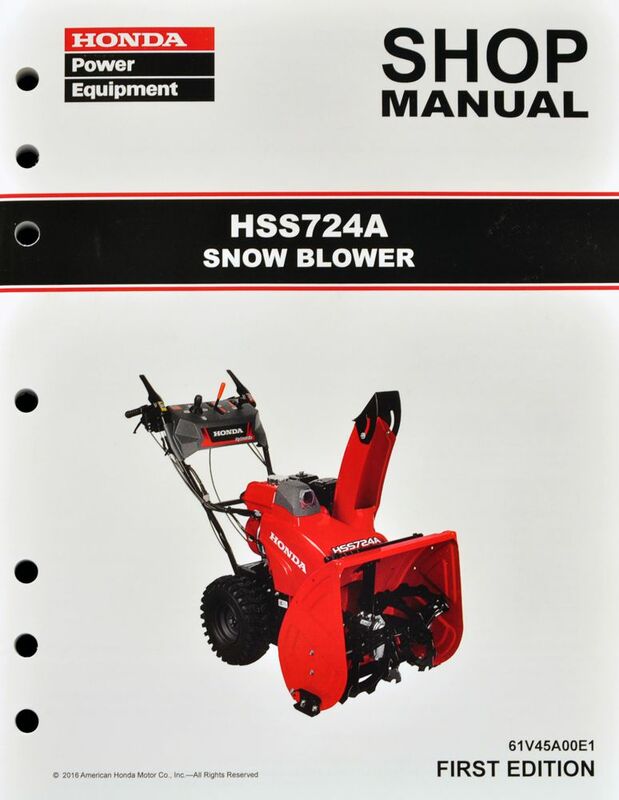 The Honda HSS724A Snow Blower Shop Manual covers service and repair procedures for the HSS724A snow blower for U.S. and Canadian markets. See images for Table of Contents and sample pages; bound, b/w, 8 1/2 x 11, 7-hole punched, 240 pages. Enter your serial number prefix (such as SABA) in the search box to locate applicable shop manuals, parts catalogs, and free downloads. 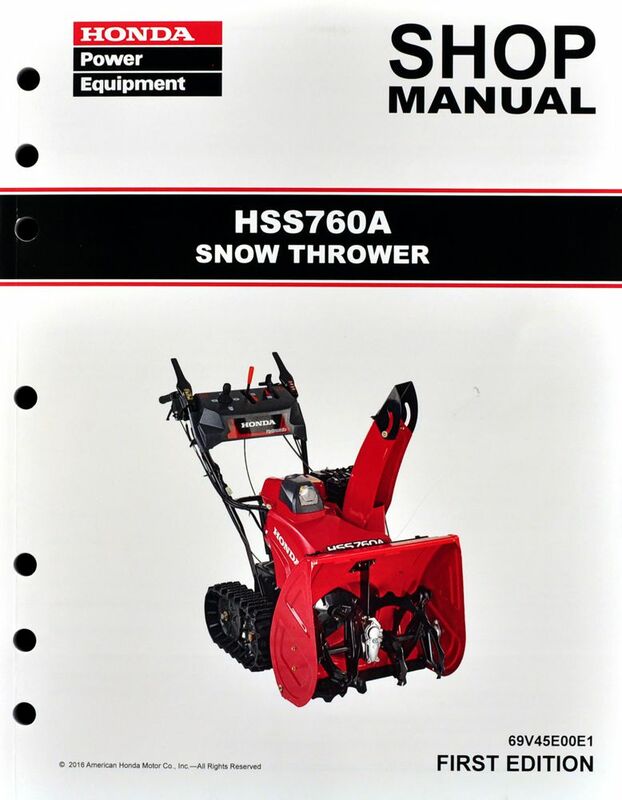 The Honda HSS760A (European) Snow Thrower Shop Manual covers service and repair procedures for the HSS760A snow throwers. See images for Table of Contents and sample pages; bound, b/w, 8 1/2 x 11, 7-hole punched, 241 pages. 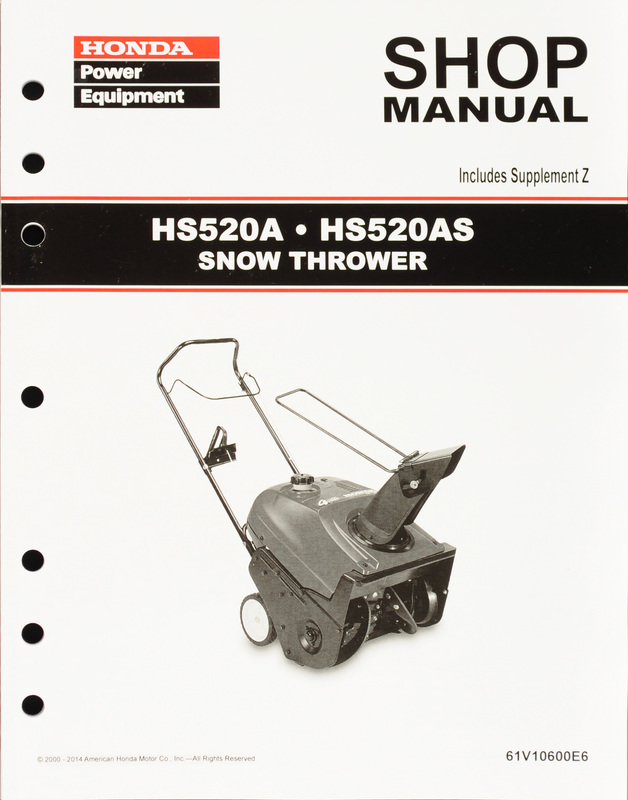 This shop manual applies to the European HSS760A Snow Thrower. Enter your serial number prefix (such as SACA) in the search box to locate applicable shop manuals, parts catalogs, and free downloads. 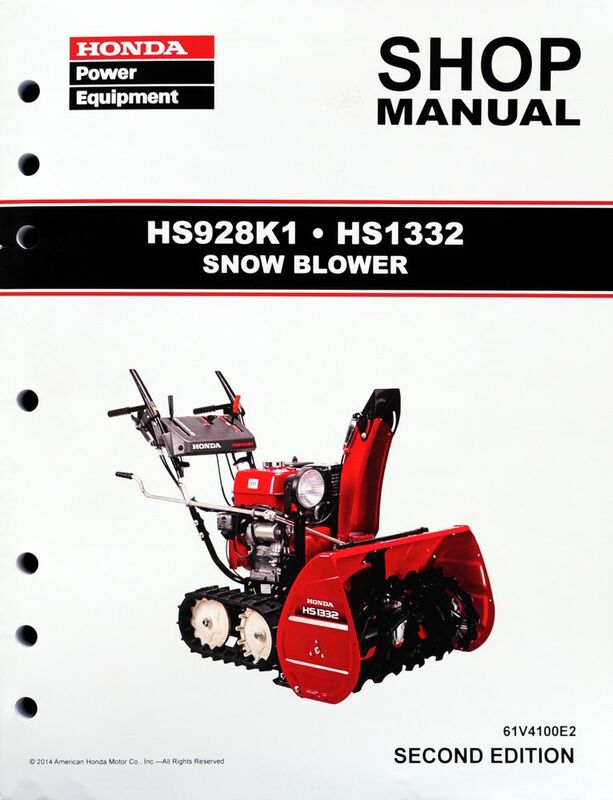 The Honda HSS928A and HSS1332A Snow Blower Shop Manual covers service and repair procedures for the HSS928A and HSS1332A snow blowers for U.S. and Canadian markets. See images for Table of Contents and sample pages; bound, b/w, 8 1/2 x 11, 7-hole punched, 264 pages. Enter your serial number prefix (such as SAFA) in the search box to locate applicable shop manuals, parts catalogs, and free downloads. 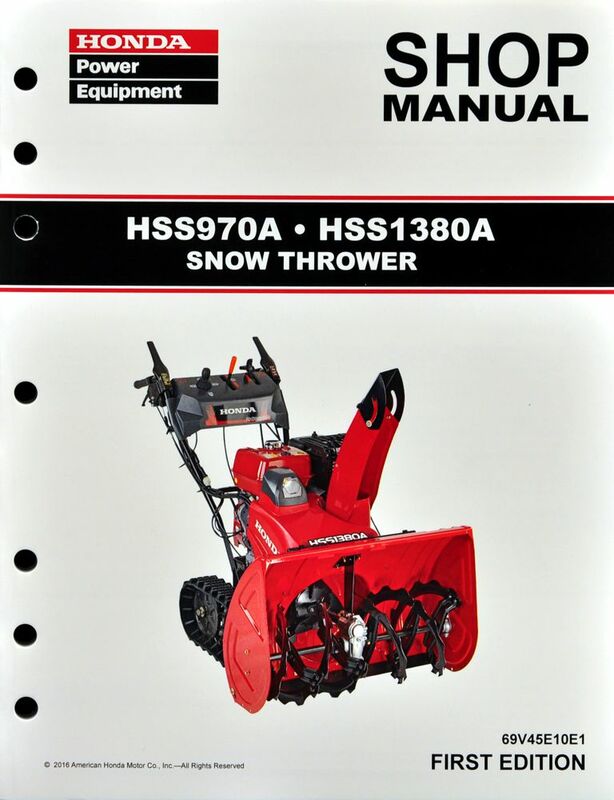 The Honda HSS970A, HSS1380A (European) Snow Thrower Shop Manual covers service and repair procedures for the HSS970A, HSS1380A snow throwers. See images for Table of Contents and sample pages; bound, b/w, 8 1/2 x 11, 7-hole punched, 263 pages. 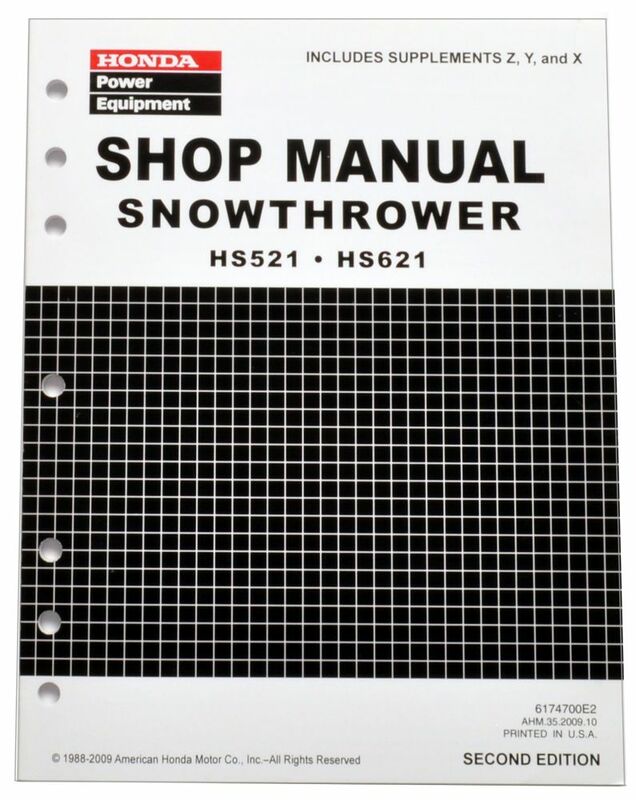 This shop manual applies to the European HSS970A and HSS1380A Snow Throwers. Enter your serial number prefix (such as SAGA) in the search box to locate applicable shop manuals, parts catalogs, and free downloads. 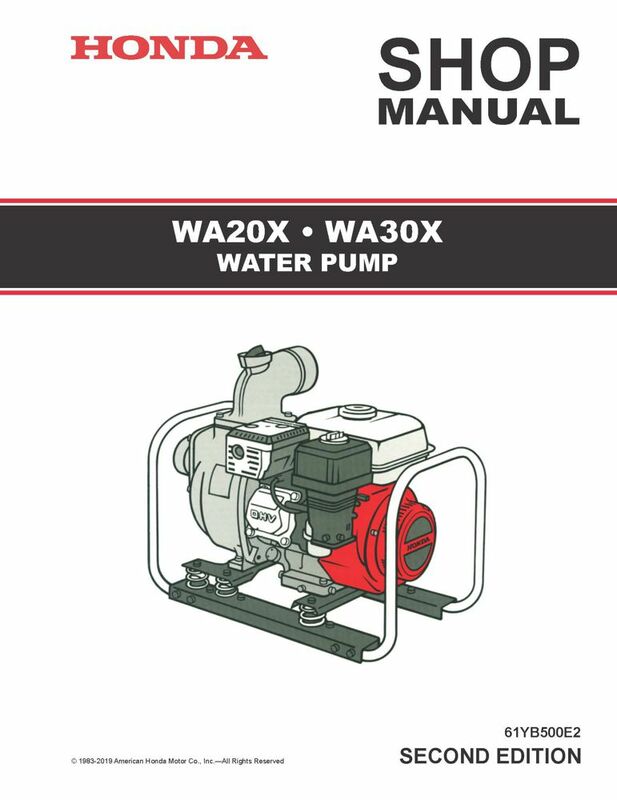 The Honda WA20 Water Pump Shop Manual covers service and repair procedures for the WA20K1 water pump. 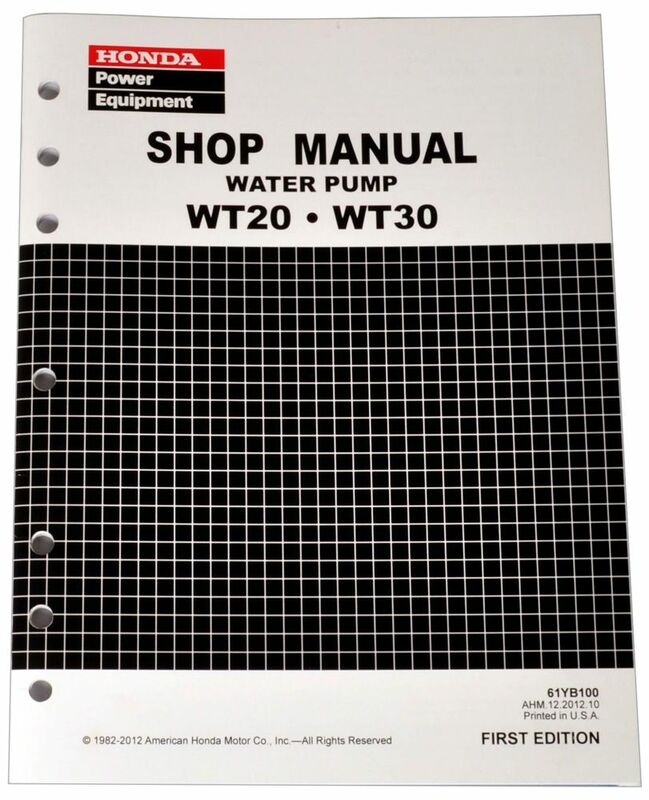 Enter your serial number prefix (such as WA20K1) in the search box to locate applicable shop manuals, parts catalogs, and free downloads. 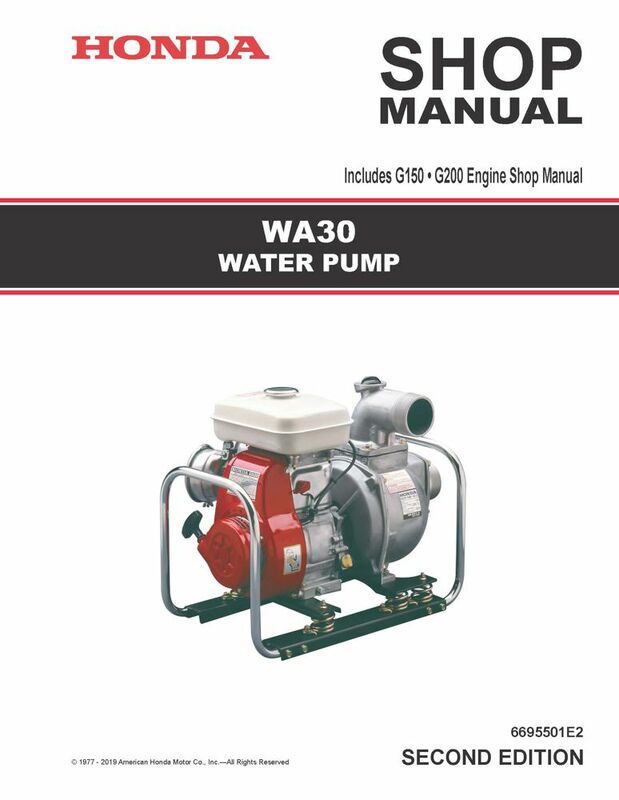 The Honda WA30 Water Pump Shop Manual covers service and repair procedures for the WA30 water pump. See images for Table of Contents and sample pages; bound, black/white, 8 1/2" x 11", 7-hole punched, 98 pages. Enter your serial number prefix (such as WA30) in the search box to locate applicable shop manuals, parts catalogs, and free downloads. 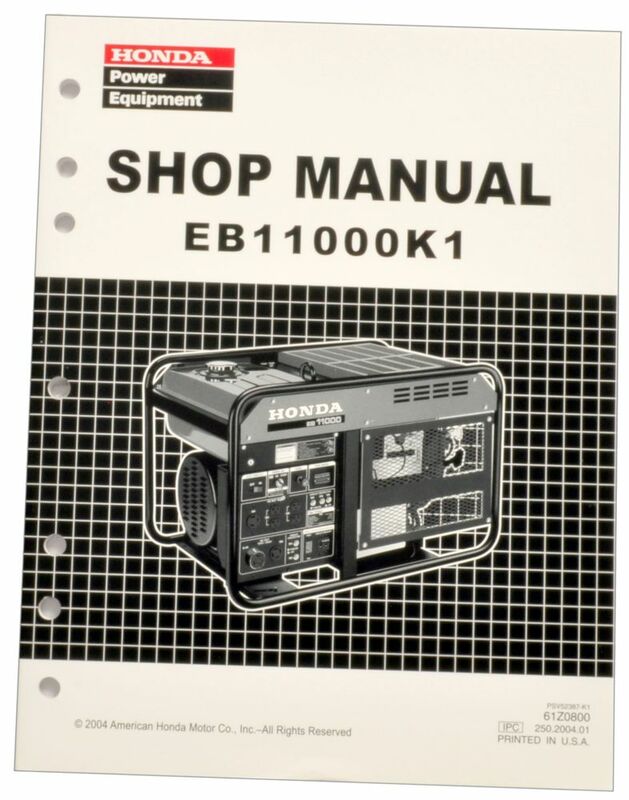 The Honda EB10000 Generator Shop Manual covers service and repair procedures for the EB10000 generators. Enter your serial number prefix (such as EBVC) in the search box to locate applicable shop manuals, parts catalogs, and free downloads. 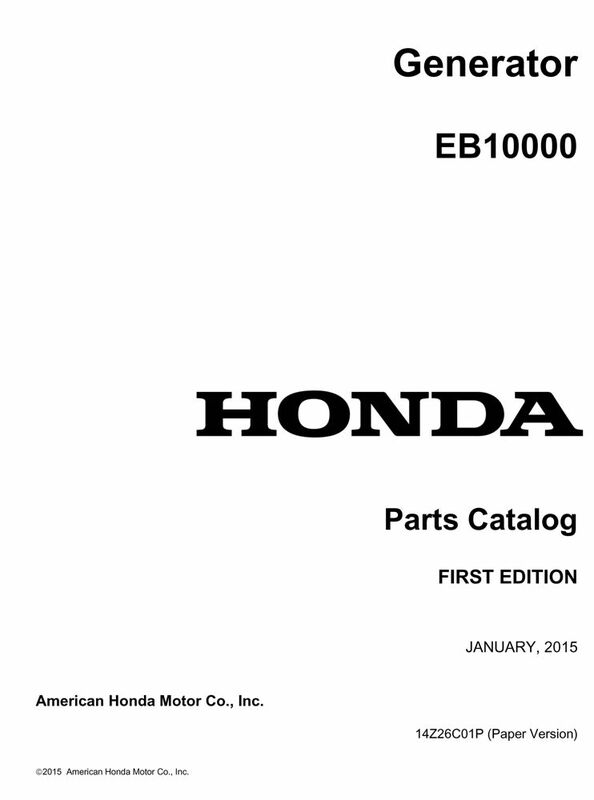 The Honda EB11000K0 Generator Shop Manual covers service and repair procedures for the EB11000K0 generators. Enter your serial number prefix (such as EZCQ) in the search box to locate applicable shop manuals, parts catalogs, and free downloads. 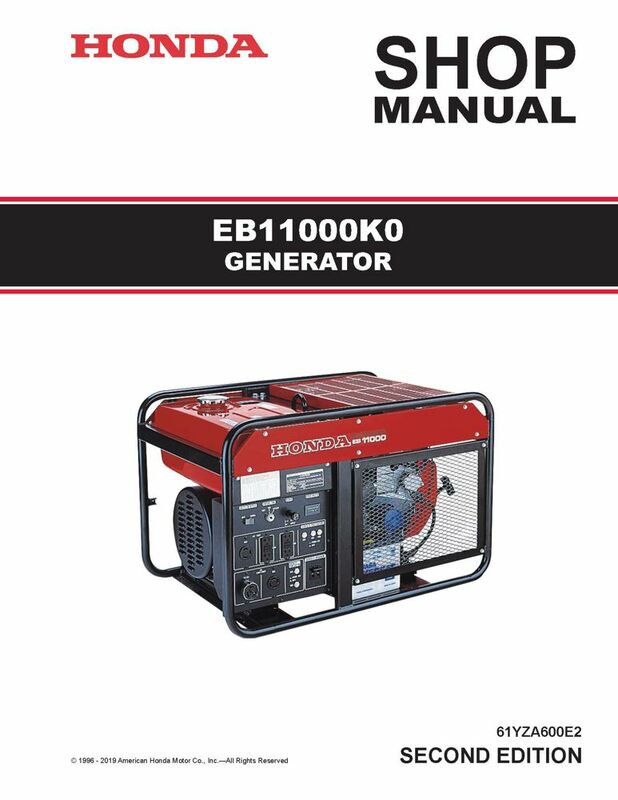 The Honda EB11000K1 Generator Shop Manual covers service and repair procedures for the EB11000K1 generators. Enter your serial number prefix (such as EZGT) in the search box to locate applicable shop manuals, parts catalogs, and free downloads. 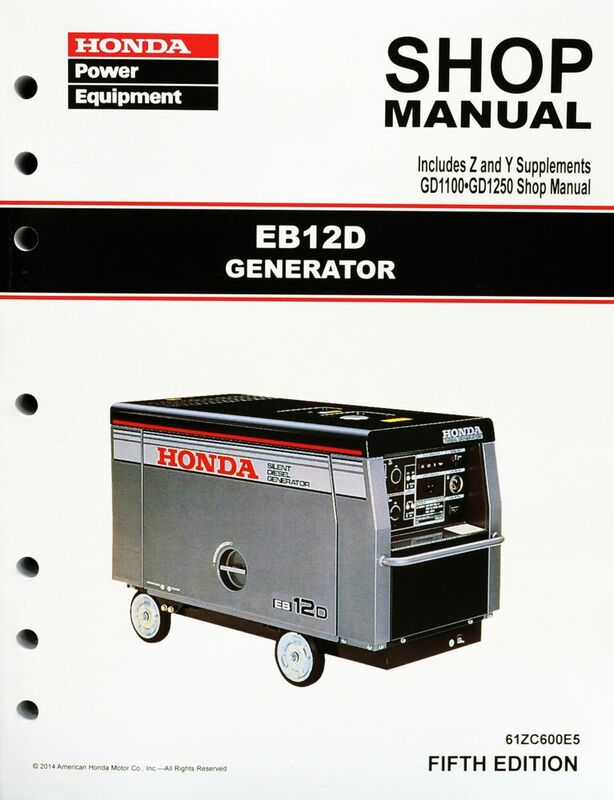 The Honda EB12D Generator Shop Manual covers service and repair procedures for the EB12D generators. Enter your serial number prefix (such as EDD) in the search box to locate applicable shop manuals, parts catalogs, and free downloads. 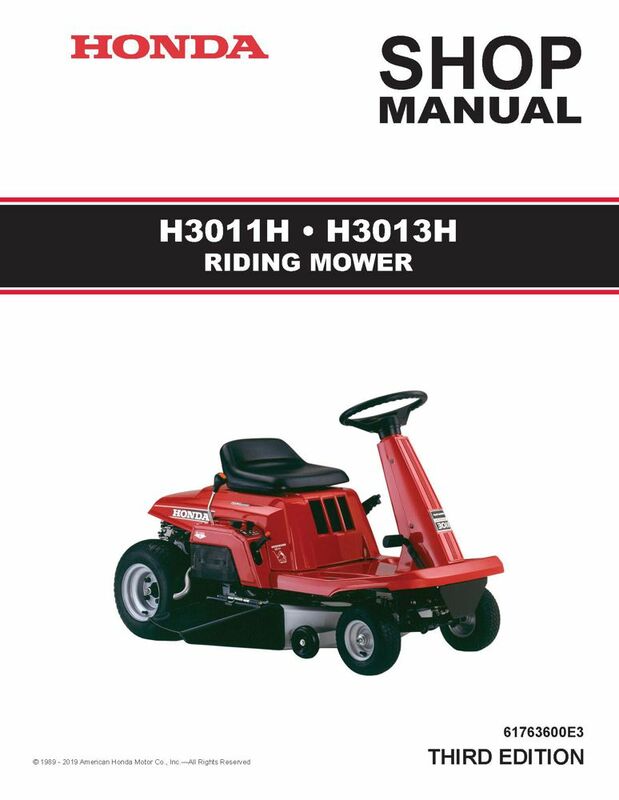 The Honda H3011H, H3013H Riding Mower Shop Manual covers service and repair procedures for the H3011H and H3013H riding mowers. See images for Table of Contents and sample pages; bound, black/white, 8 1/2" x 11", 7-hole punched, 198 pages. Enter your serial number prefix (such as MZAH) in the search box to locate applicable shop manuals, parts catalogs, and free downloads. 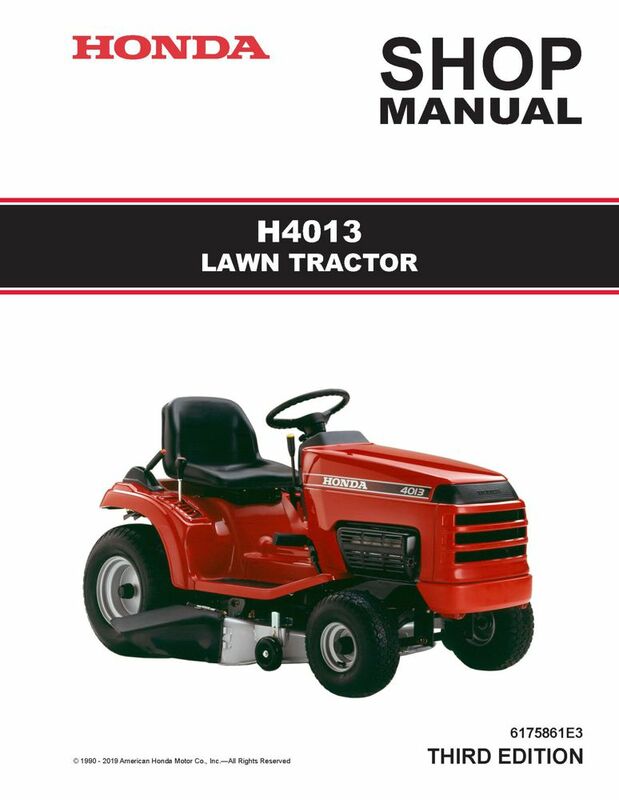 The Honda H4013 Lawn Tractor Shop Manual covers service and repair procedures for the H4013 lawn tractor. Enter your serial number prefix (such as MZAR) in the search box to locate applicable shop manuals, parts catalogs, and free downloads. 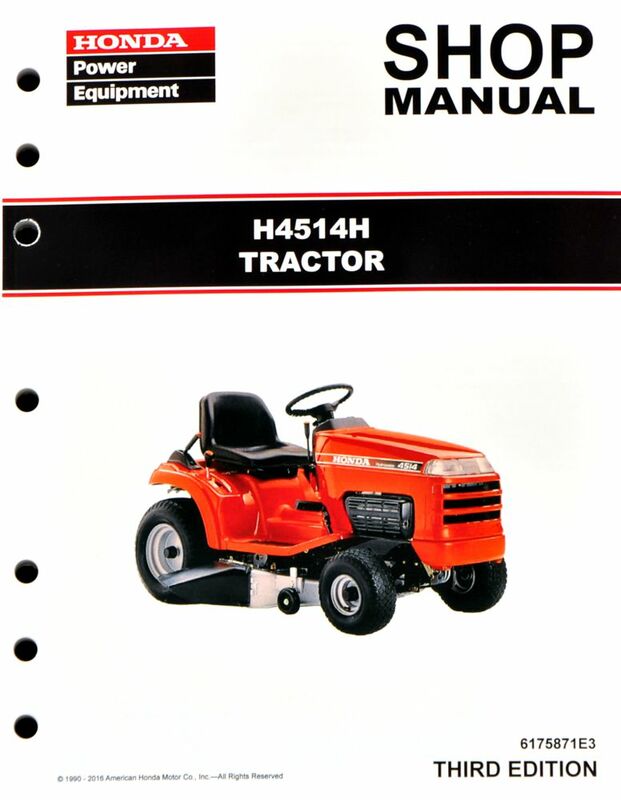 The Honda H4514H Lawn Tractor Shop Manual covers service and repair procedures for the H4514H lawn tractor. See images for Table of Contents and sample pages; bound, black/white, 8 1/2" x 11", 7-hole punched, 234 pages. Enter your serial number prefix (such as MZAS) in the search box to locate applicable shop manuals, parts catalogs, and free downloads. 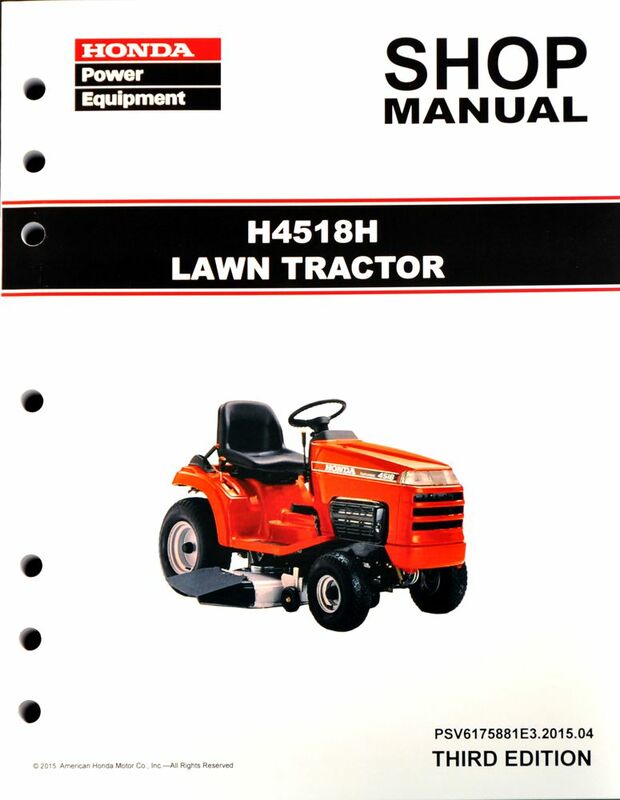 The Honda H4518H Lawn Tractor Shop Manual covers service and repair procedures for the H4518H lawn tractor. See images for Table of Contents and sample pages; bound, black/white, 8 1/2" x 11", 7-hole punched, 268 pages. Enter your serial number prefix (such as MZAT) in the search box to locate applicable shop manuals, parts catalogs, and free downloads. 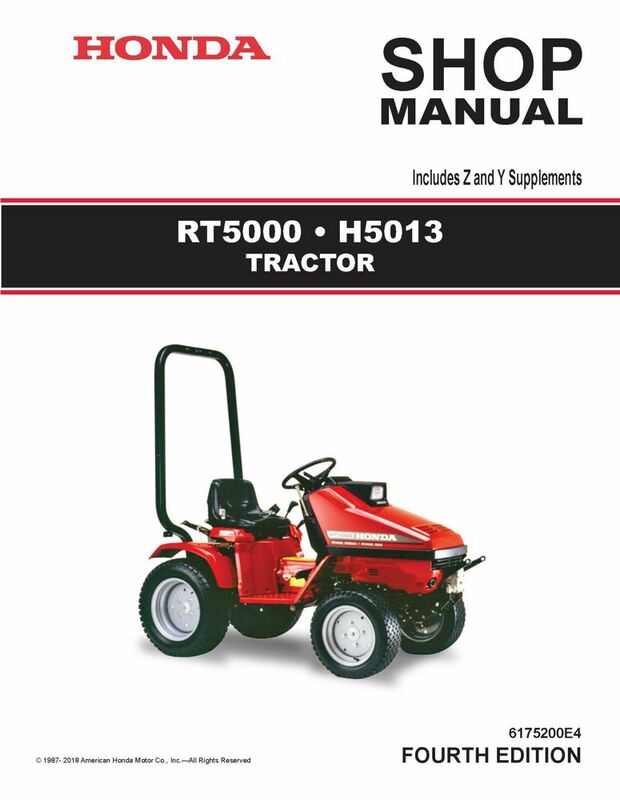 The Honda H5013, RT5000 Tractor Shop Manual covers service and repair procedures for the H5013 and RT5000 tractors. See images for Table of Contents and sample pages; bound, black/white, 8 1/2" x 11", 7-hole punched, 392 pages. Enter your serial number prefix (such as FA2A) in the search box to locate applicable shop manuals, parts catalogs, and free downloads. 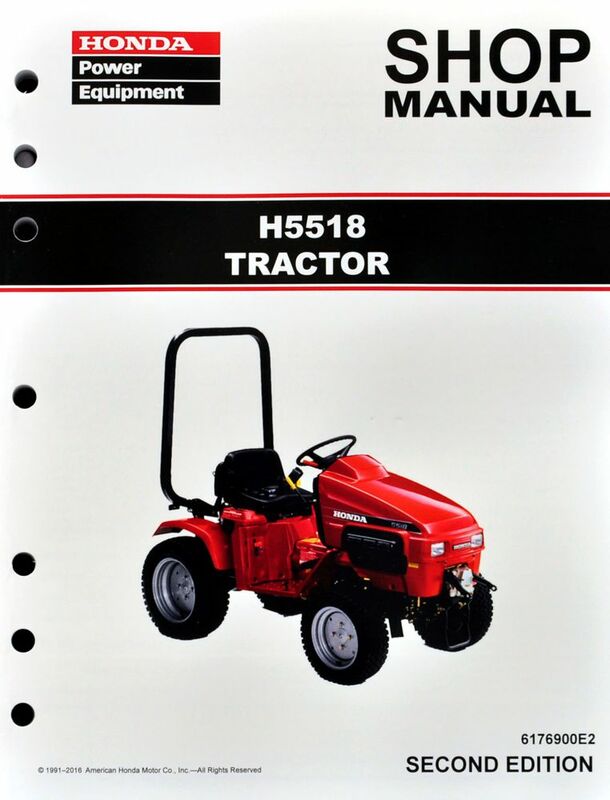 The Honda H5518 Tractor Shop Manual covers service and repair procedures for the H5518 tractor. See images for Table of Contents and sample pages; bound, black/white, 8 1/2" x 11", 7-hole punched, 266 pages. Enter your serial number prefix (such as TZAC) in the search box to locate applicable shop manuals, parts catalogs, and free downloads. 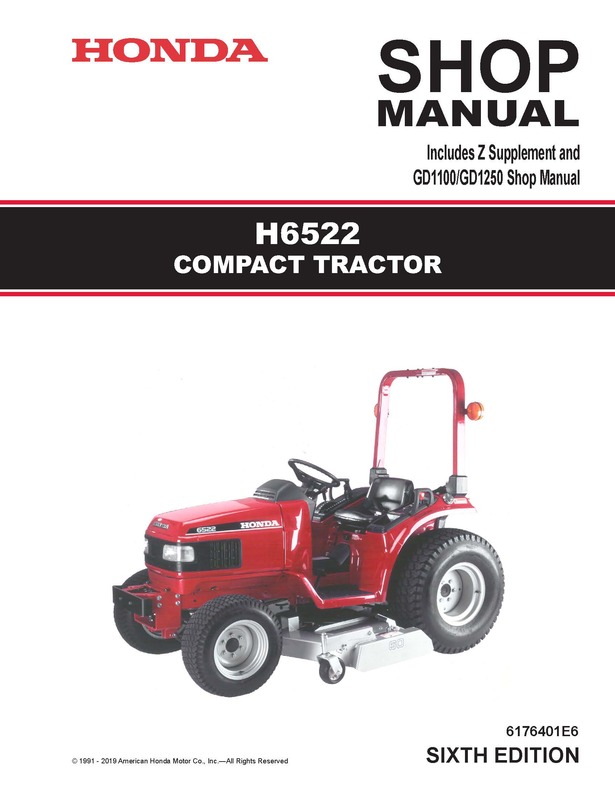 The Honda H6522 Compact Tractor Shop Manual covers service and repair procedures for the H6522 compact tractor. See images for Table of Contents and sample pages; bound, black/white, 8 1/2" x 11", 7-hole punched, 336 pages. Enter your serial number prefix (such as TZAD) in the search box to locate applicable shop manuals, parts catalogs, and free downloads. 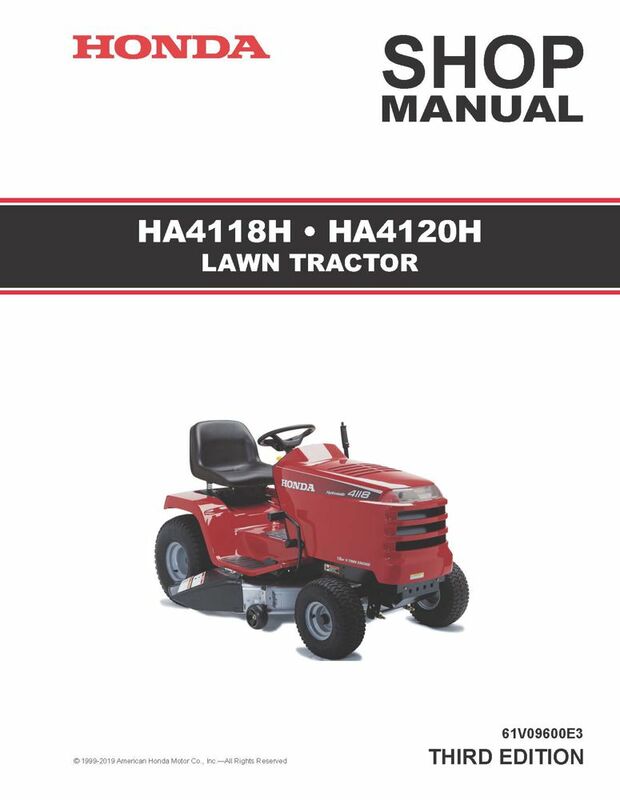 The Honda HA4118H, HA4120H Lawn Tractor Shop Manual covers service and repair procedures for the HA4118H and HA4120H lawn tractors. See images for Table of Contents and sample pages; bound, black/white, 8 1/2" x 11", 7-hole punched, 164 pages. Enter your serial number prefix (such as MZCJ) in the search box to locate applicable shop manuals, parts catalogs, and free downloads. Cover of manual slightly damaged. 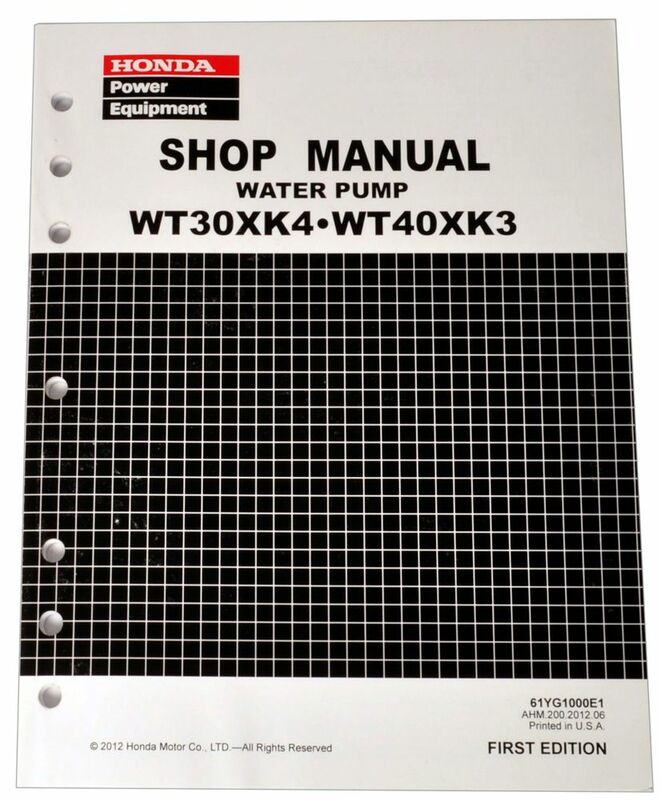 The Honda Power Equipment WT20, WT30 Water Pump Shop Manual covers service and repair procedures for the WT20 and WT30 water pumps. Bound, b/w, 8 1/2 x 11, 7-hole punched, 45 pages. Cover of manual slightly damaged. 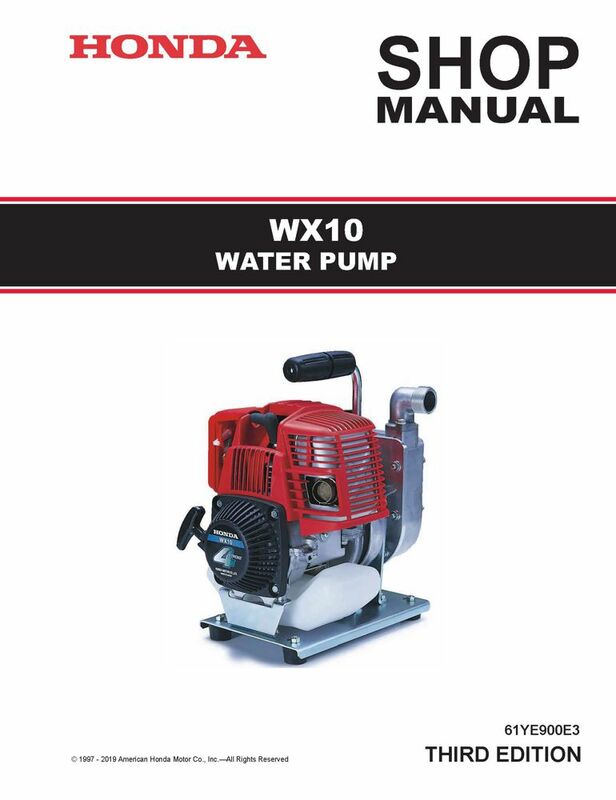 The Honda Power Equipment WT30XK4, WT40XK3 Water Pump Shop Manual covers service and repair procedures for the WT30XK4 and WT40XK3 water pumps. Slightly damaged during shipping from print vendor. Bound, b/w, 8 1/2 x 11, 7-hole punched, 123 pages. 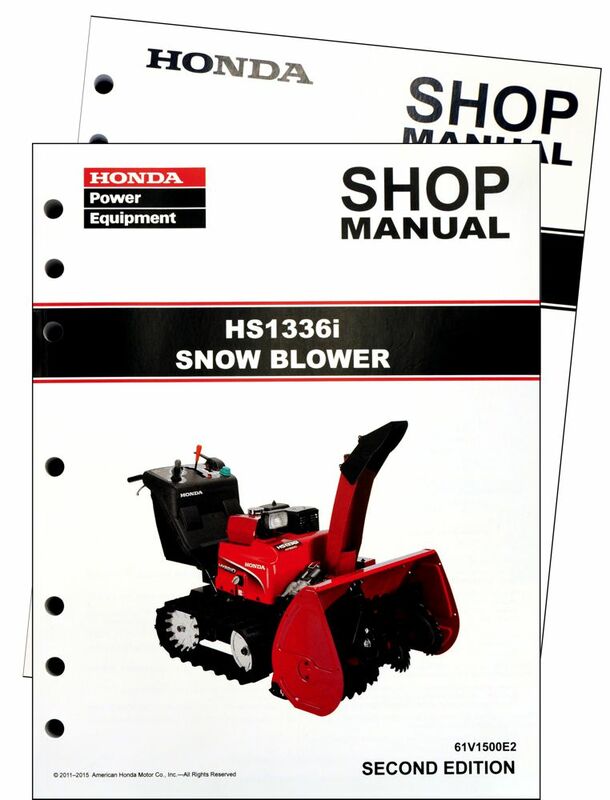 The Honda HS1336i Snow Blower Shop Manual covers service and repair procedures for the HS1336i and HSM1336iK2 snow blowers. See images for Table of Contents and sample pages; bound, b/w, 8 1/2 x 11, 7-hole punched, 386 pages plus HSM1336iK2 supplement. Enter your serial number prefix (such as SBAJ) in the search box to locate applicable shop manuals, parts catalogs, and free downloads. 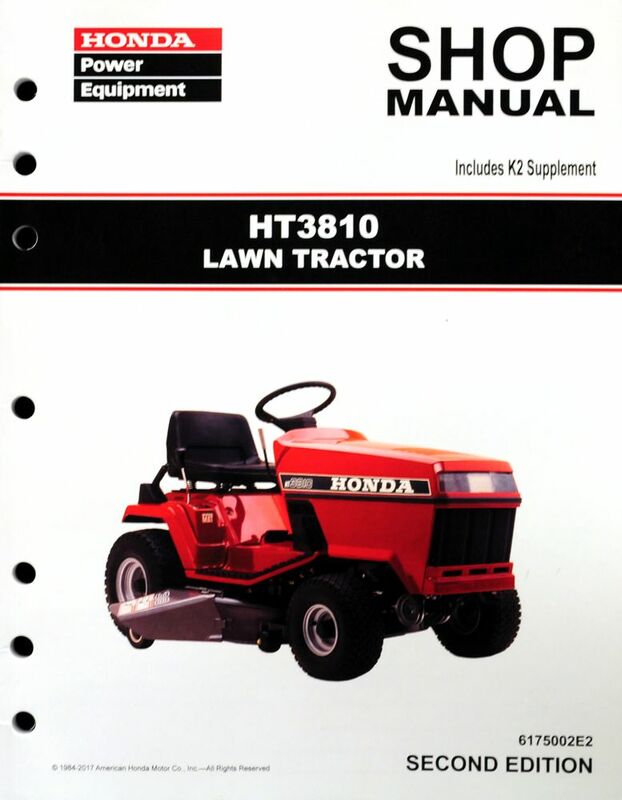 The Honda HT3810 Lawn Tractor Shop Manual covers service and repair procedures for the HT3810 lawn tractor. See images for Table of Contents and sample pages; bound, black/white, 8 1/2" x 11", 7-hole punched, 154 pages. Enter your serial number prefix (such as HT3810) in the search box to locate applicable shop manuals, parts catalogs, and free downloads. 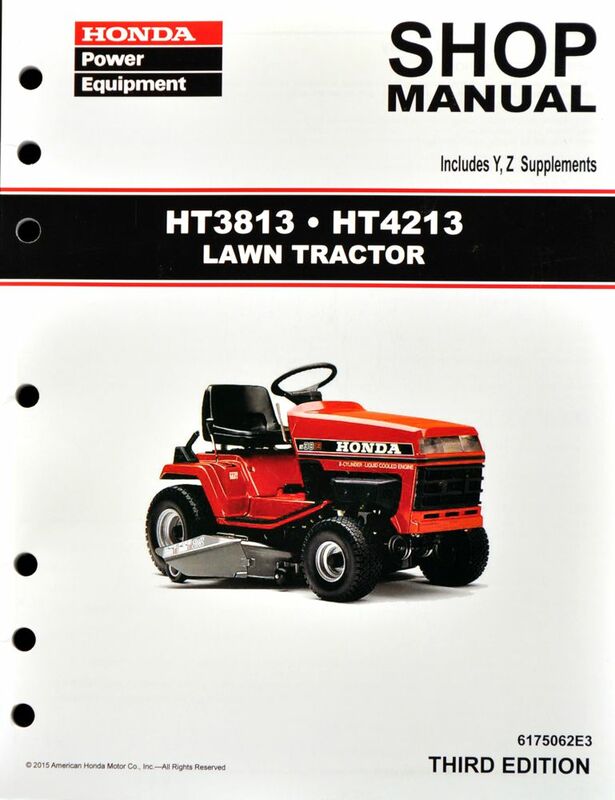 The Honda HT3813, HT4213 Lawn Tractor Shop Manual covers service and repair procedures for the HT3813K0, HT3813K1, and HT4213 lawn tractors. See images for Table of Contents and sample pages; bound, black/white, 8 1/2" x 11", 7-hole punched, 196 pages. Enter your serial number prefix (such as MAAT) in the search box to locate applicable shop manuals, parts catalogs, and free downloads. 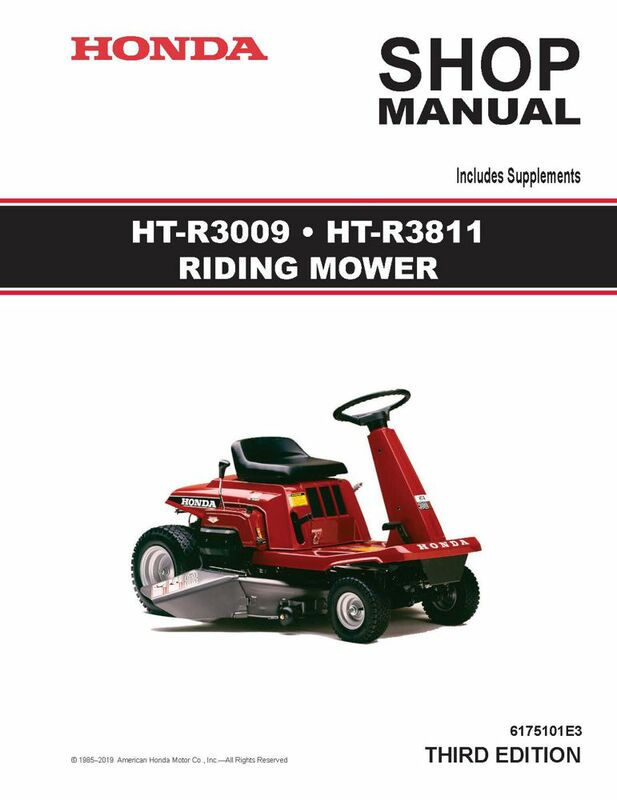 The Honda HT-R3009, HT-R3811 Riding Mower Shop Manual covers service and repair procedures for the HT-R3009K0, HT-R3009K1, and HT-R3811 riding mowers. See images for Table of Contents and sample pages; bound, black/white, 8 1/2" x 11", 7-hole punched, 244 pages. Enter your serial number prefix (such as MABT) in the search box to locate applicable shop manuals, parts catalogs, and free downloads. 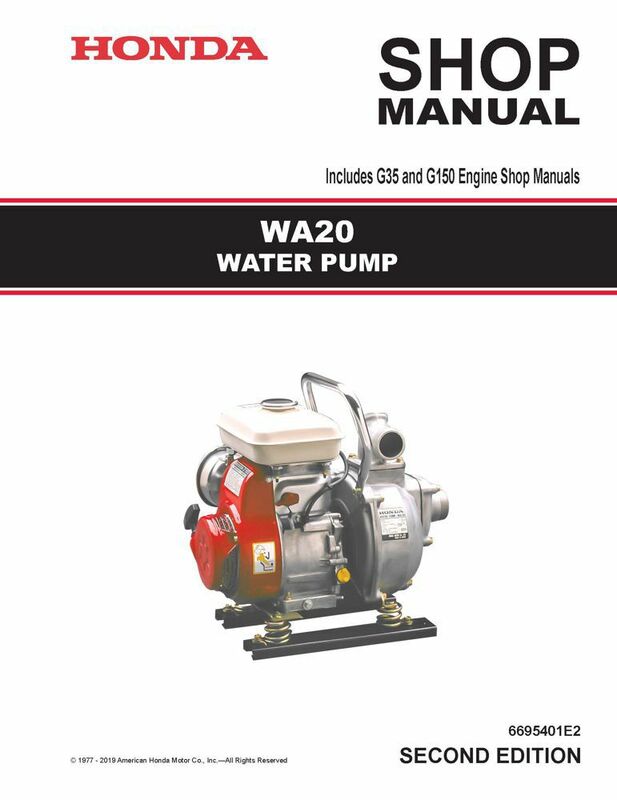 The Honda WA20X, WA30X Water Pump Shop Manual covers service and repair procedures for the WA20X and WA30X water pumps. See images for Table of Contents and sample pages; bound, black/white, 8 1/2" x 11", 7-hole punched, 63 pages. 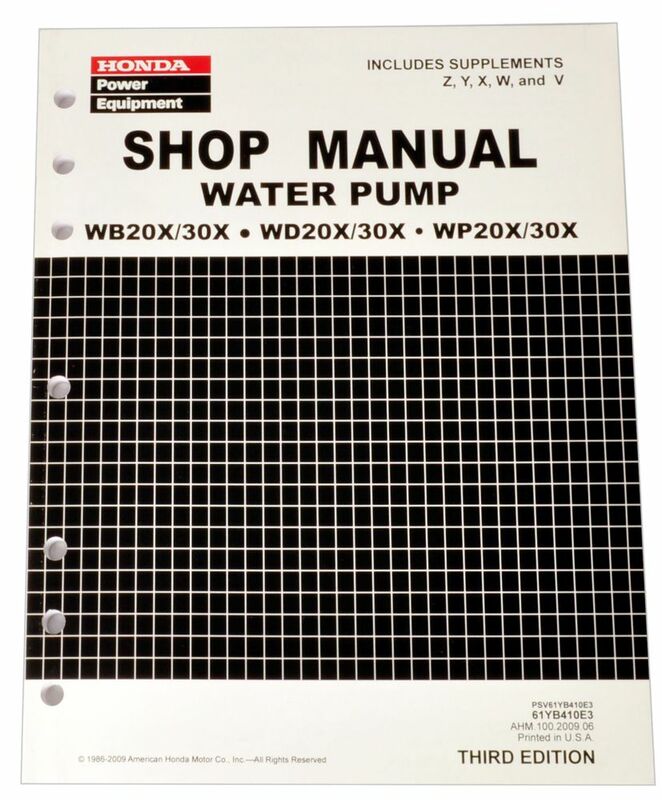 Enter your serial number prefix (such as WA30X) in the search box to locate applicable shop manuals, parts catalogs, and free downloads. 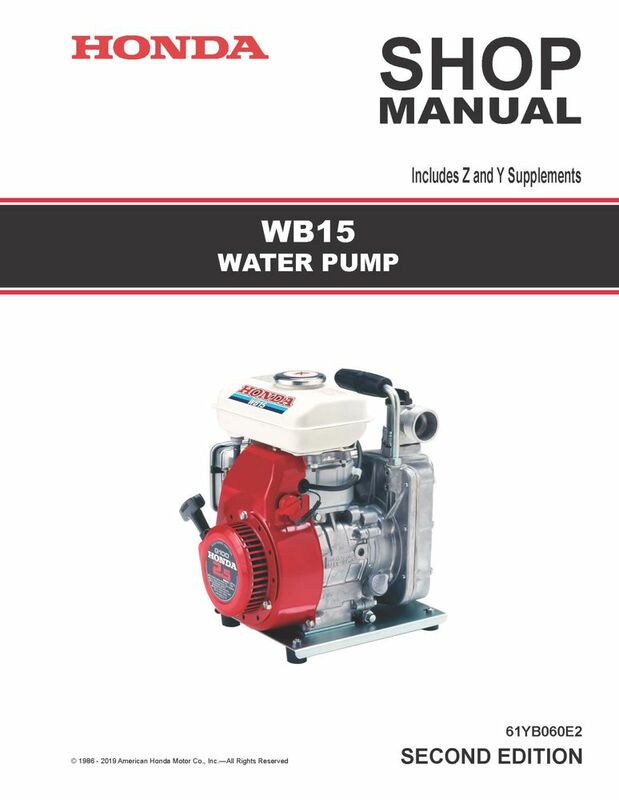 The Honda WB15 Water Pump Shop Manual covers service and repair procedures for the WB15 water pump. See images for Table of Contents and sample pages; bound, black/white, 8 1/2" x 11", 7-hole punched, 76 pages includes supplements. 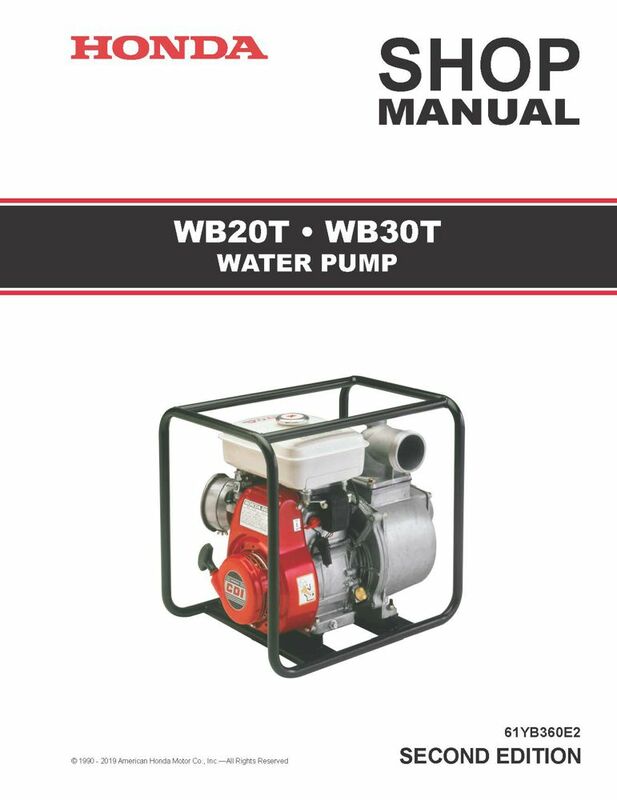 The Honda WB20T, WB30T Water Pump Shop Manual covers service and repair procedures for the WB20T and WB30T water pumps. See images for Table of Contents and sample pages; bound, black/white, 8 1/2" x 11", 7-hole punched, 56 pages. Enter your serial number prefix (such as WZAN) in the search box to locate applicable shop manuals, parts catalogs, and free downloads. Enter your serial number prefix (such as WACT) in the search box to locate applicable shop manuals, parts catalogs, and free downloads. 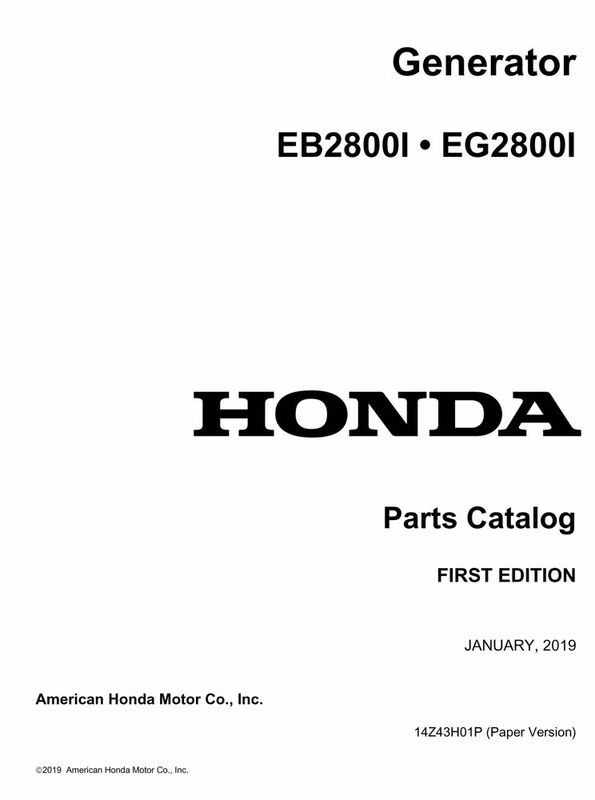 The Honda WB20X/WB30X, WD20X/WD30X, WP20X/WP30X Water Pump Shop Manual covers service and repair procedures for the WB20X/WB30X, WD20X/WD30X, and WP20X/WP30X water pumps. See images for Table of Contents and sample pages; bound, black/white, 8 1/2" x 11", 7-hole punched, 132 pages plus five supplements. Enter your serial number prefix (such as WZBE) in the search box to locate applicable shop manuals, parts catalogs, and free downloads. 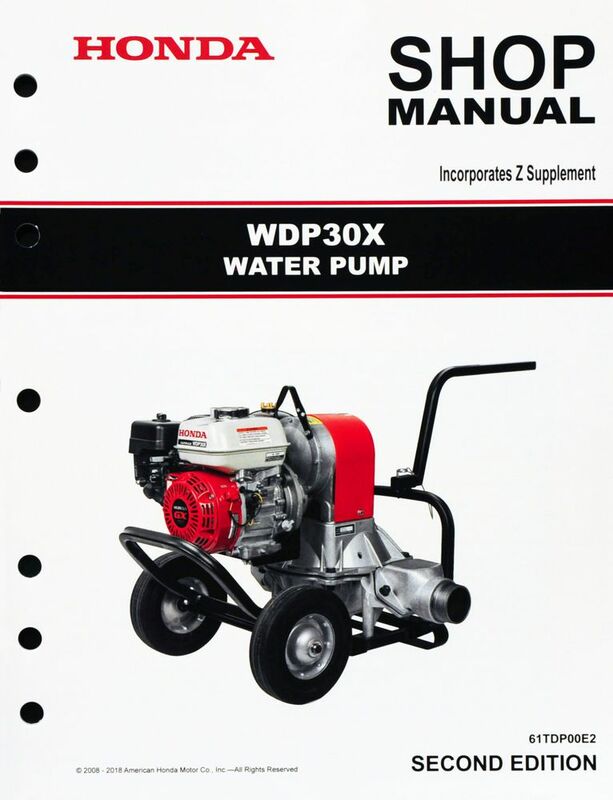 The Honda WDP30X, WDP30XK1 Water Pump Shop Manual covers service and repair procedures for the WDP30X, WDP30XK1, and WDP30XK2 water pumps. See images for Table of Contents and sample pages; bound, black/white, 8 1/2" x 11", 7-hole punched, 75 pages plus supplement. Enter your serial number prefix (such as WZCA) in the search box to locate applicable shop manuals, parts catalogs, and free downloads. 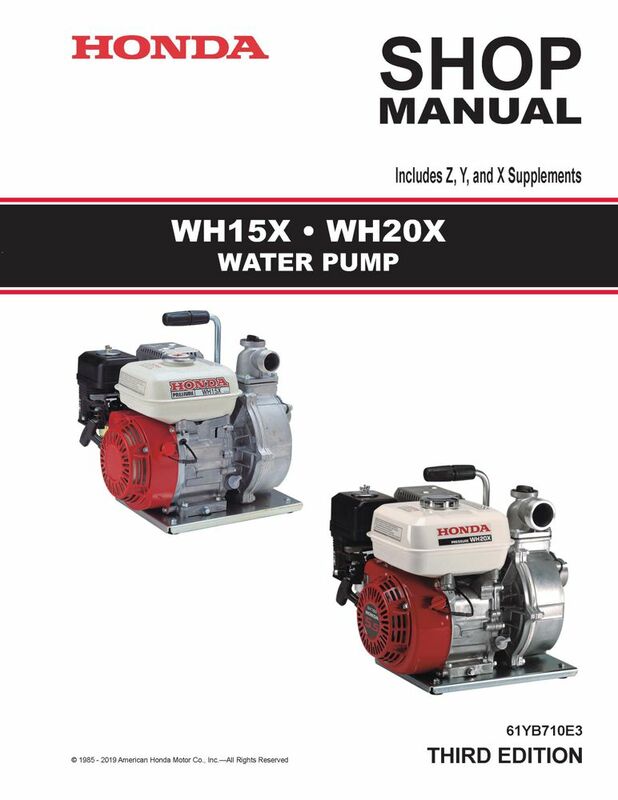 The Honda WH15X, WH20X Water Pump Shop Manual covers service and repair procedures for the WH15XK1, WH15XK2, WH20XK0, WH20XK1, and WH20XK2 water pumps. See images for Table of Contents and sample pages; bound, black/white, 8 1/2" x 11", 7-hole punched, 84 pages includes supplements. Enter your serial number prefix (such as WASJ) in the search box to locate applicable shop manuals, parts catalogs, and free downloads. 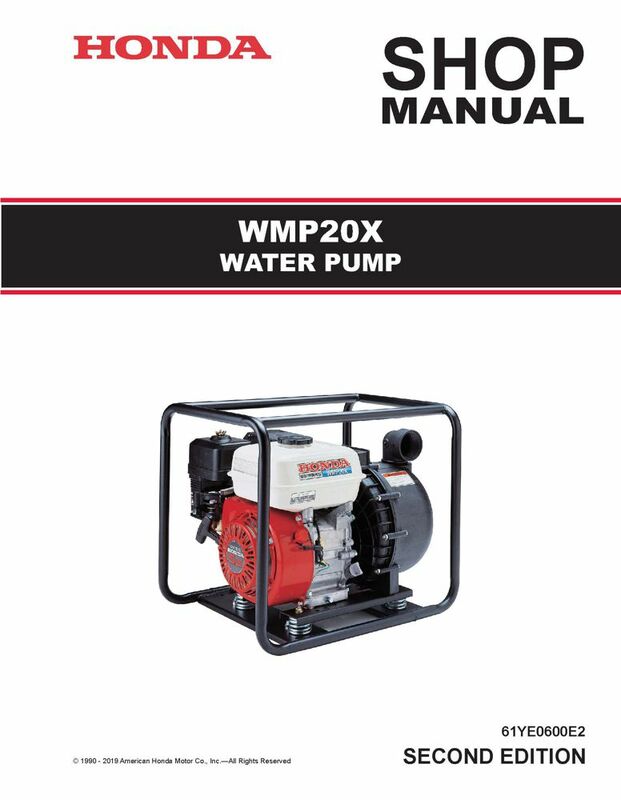 The Honda WMP20X Multi-Purpose Water Pump Shop Manual covers service and repair procedures for the WMP20X and WMP20X1 multi-purpose pumps. See images for Table of Contents and sample pages; bound, black/white, 8 1/2" x 11", 7-hole punched, 78 pages. Enter your serial number prefix (such as WMP20X) in the search box to locate applicable shop manuals, parts catalogs, and free downloads. 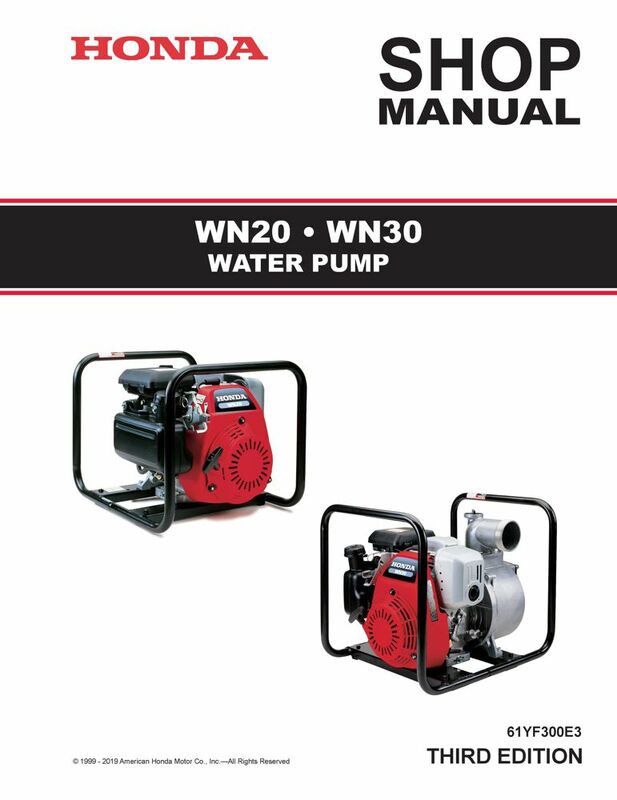 The Honda WN20, WN30 Water Pump Shop Manual covers service and repair procedures for the WN20 and WN30 water pumps. See images for Table of Contents and sample pages; bound, black/white, 8 1/2" x 11", 7-hole punched, 88 pages. Enter your serial number prefix (such as WZBW) in the search box to locate applicable shop manuals, parts catalogs, and free downloads. 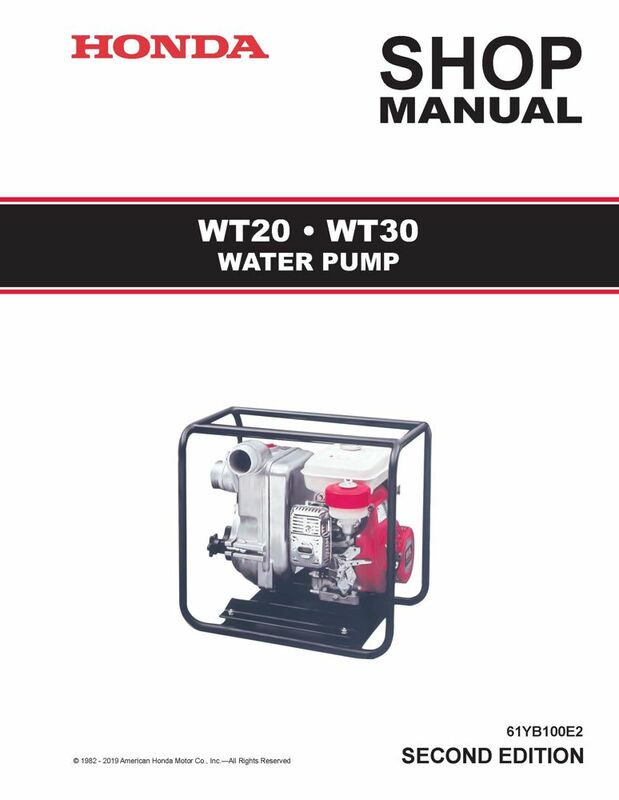 The Honda WT20, WT30 Water Pump Shop Manual covers service and repair procedures for the WT20 and WT30 water pumps. See images for Table of Contents and sample pages; bound, black/white, 8 1/2" x 11", 7-hole punched, 48 pages. 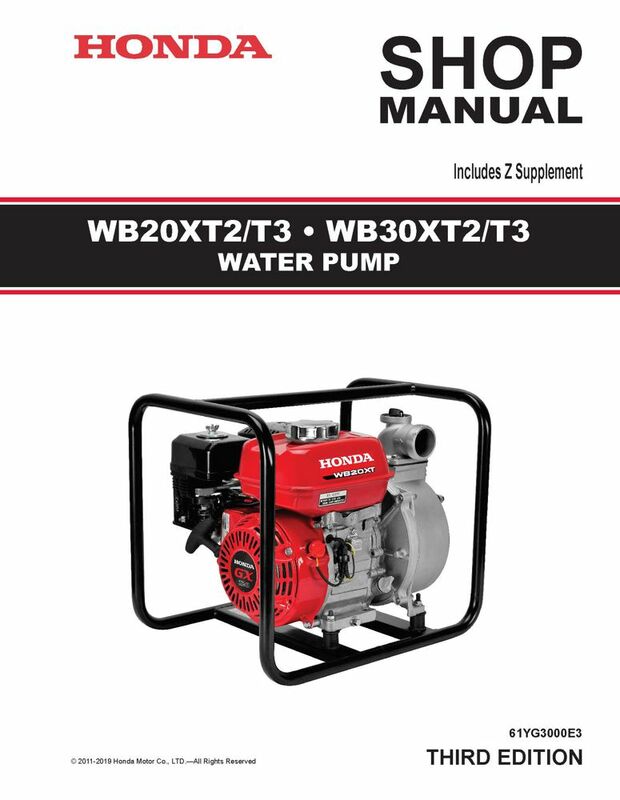 The Honda WT20X, WT30X, WT40X Water Pump Shop Manual covers service and repair procedures for the WT20XK0, WT20XK2, WT20XK3, WT20XK4, WT30XK0, WT30XK1, WT30XK2, WT30XK3, WT40XK0, WT40XK1 and WT40XK2 water pumps. See images for Table of Contents and sample pages; bound, black/white, 8 1/2" x 11", 7-hole punched, 112 pages. Enter your serial number prefix (such as WAG) in the search box to locate applicable shop manuals, parts catalogs, and free downloads. 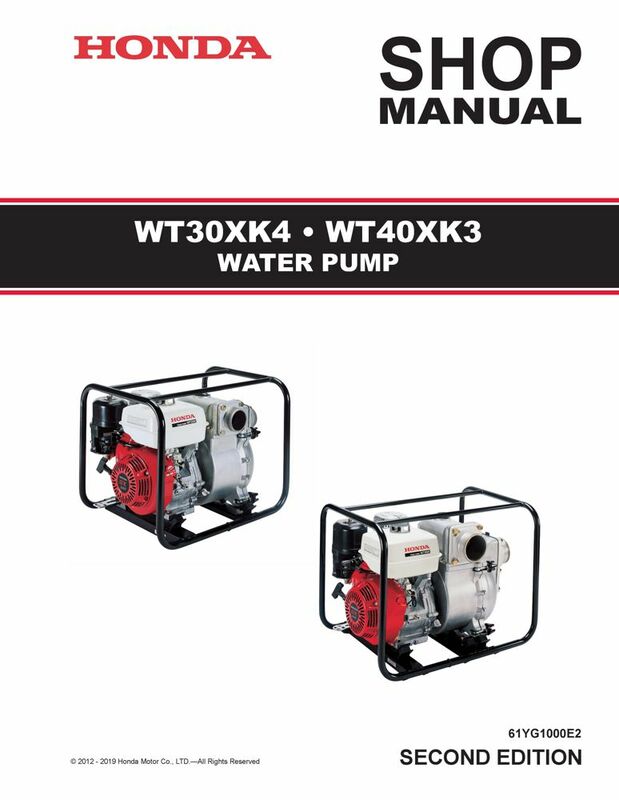 The Honda WT30XK4, WT40XK3 Water Pump Shop Manual covers service and repair procedures for the WT30XK4 and WT40XK3 water pumps. See images for Table of Contents and sample pages; bound, black/white, 8 1/2" x 11", 7-hole punched, 124 pages. Enter your serial number prefix (such as WAYJ) in the search box to locate applicable shop manuals, parts catalogs, and free downloads. 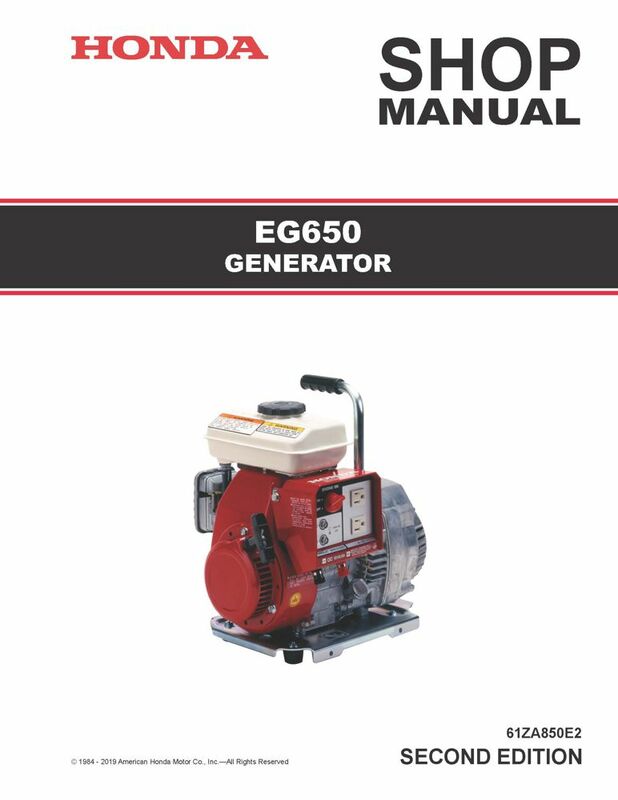 The Honda EG650 Generator Shop Manual covers service and repair procedures for the EG650 generators. 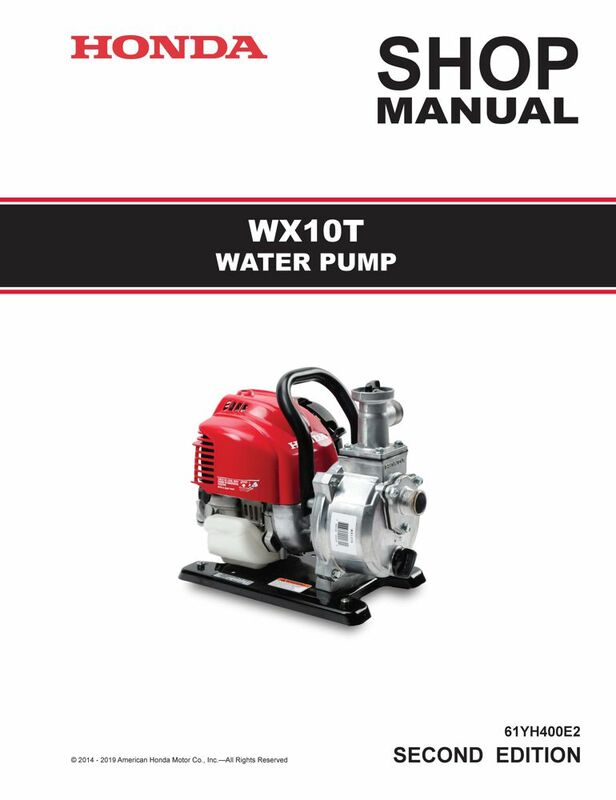 The Honda WX10 Water Pump Shop Manual covers service and repair procedures for the WX10K0 water pump. See images for Table of Contents and sample pages; bound, black/white, 8 1/2" x 11", 7-hole punched, 68 pages. Enter your serial number prefix (such as WZBR) in the search box to locate applicable shop manuals, parts catalogs, and free downloads. 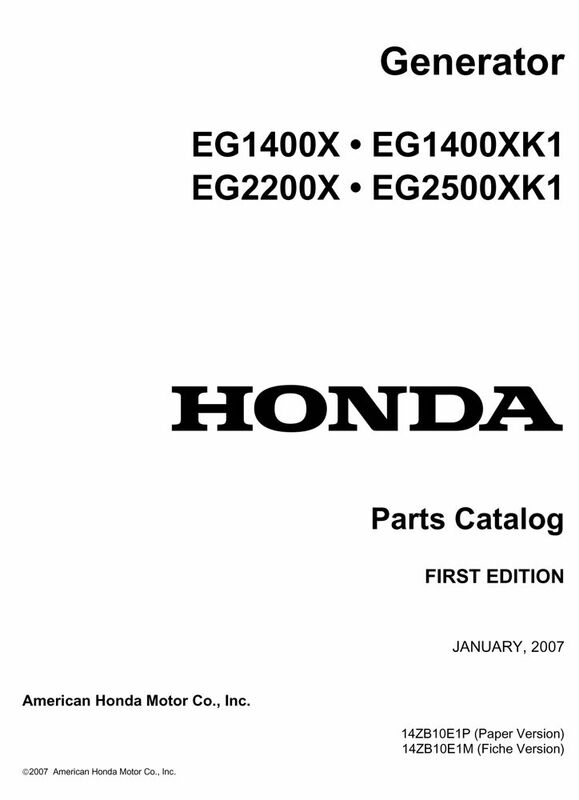 The Honda EG1000, EG1400Z, EG2200Z Generator Shop Manual covers service and repair procedures for the EG1000, EG1400Z, and EG2200Z generators. Enter your serial number prefix (such as GE200) in the search box to locate applicable shop manuals, parts catalogs, and free downloads. 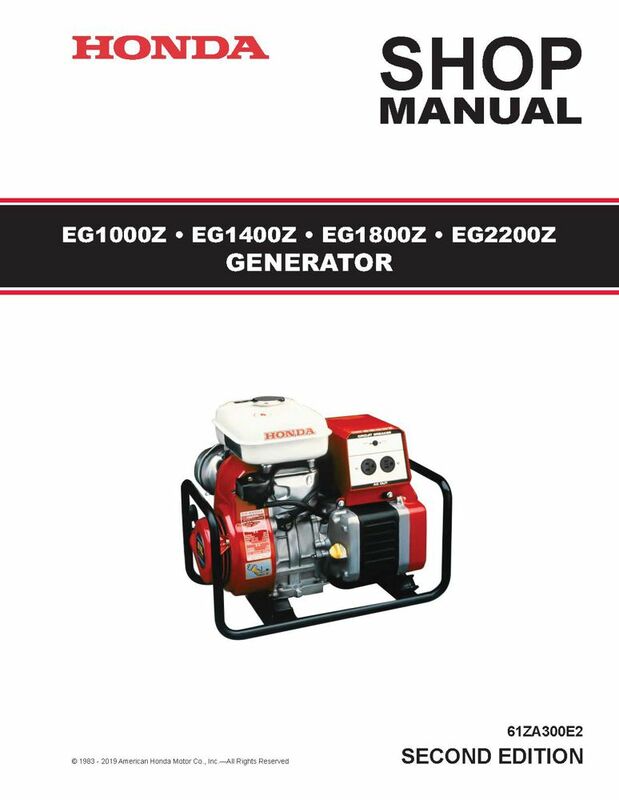 The Honda EG14000, EG2200X, EG2500X Generator Shop Manual covers service and repair procedures for the EG1400X, EG2200X, and EG2500X generators. Enter your serial number prefix (such as EZCR) in the search box to locate applicable shop manuals, parts catalogs, and free downloads. 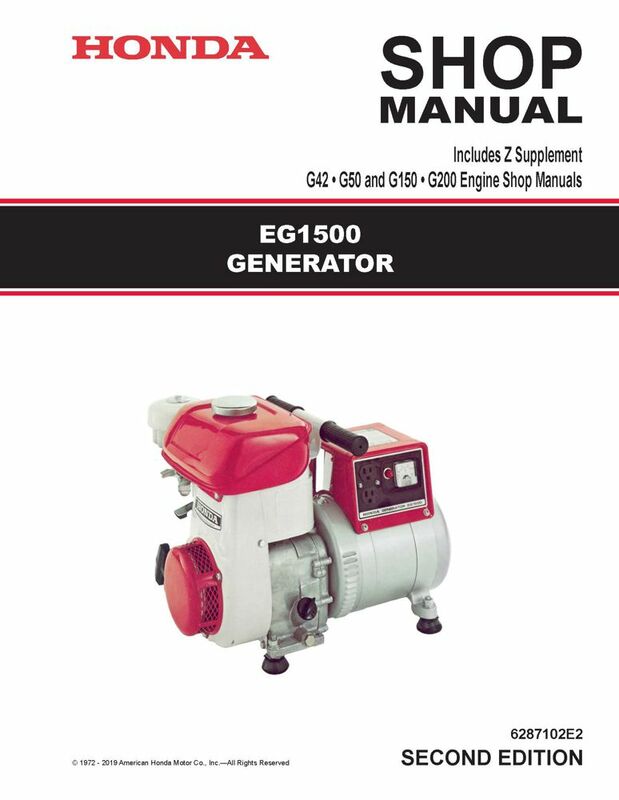 The Honda EG1500 Generator Shop Manual covers service and repair procedures for the EG1500 generators. See images for Table of Contents and sample page; bound, black/white, 8 1/2" x 11", 7-hole punched, 160 pages. 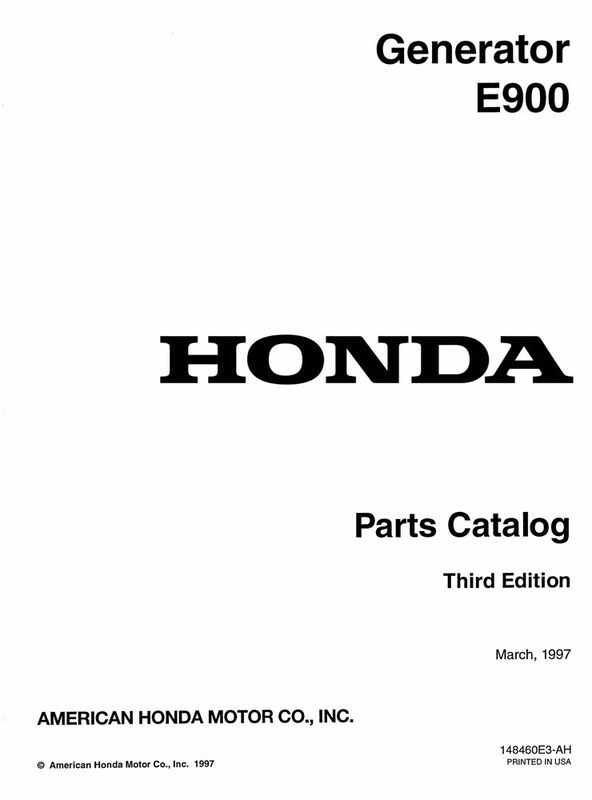 Includes G42/G50 and G150/200 Engine Shop Manuals. Enter your serial number prefix (such as G200) in the search box to locate applicable shop manuals, parts catalogs, and free downloads. 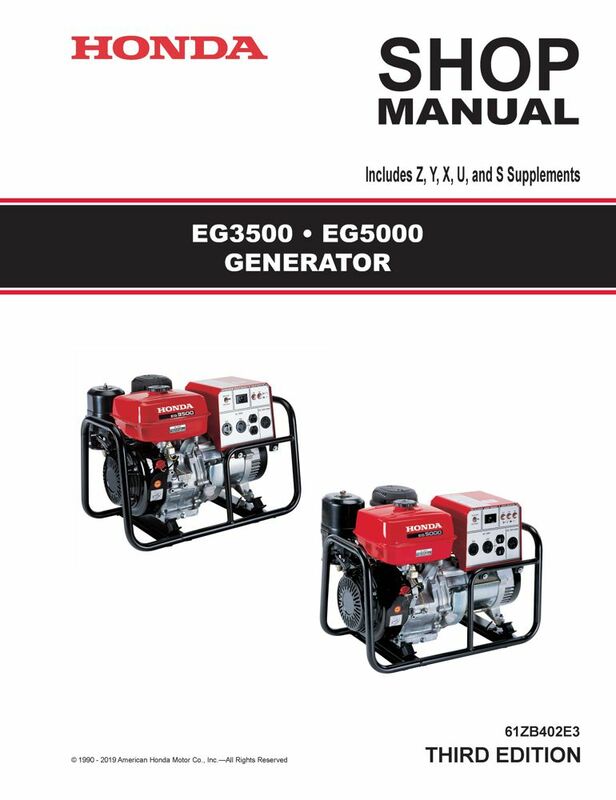 The Honda EG3500X, EG5000X Generator Shop Manual covers service and repair procedures for the EG3500X, EG3500XK1, EG5000X, and EG5000XK1 generators. 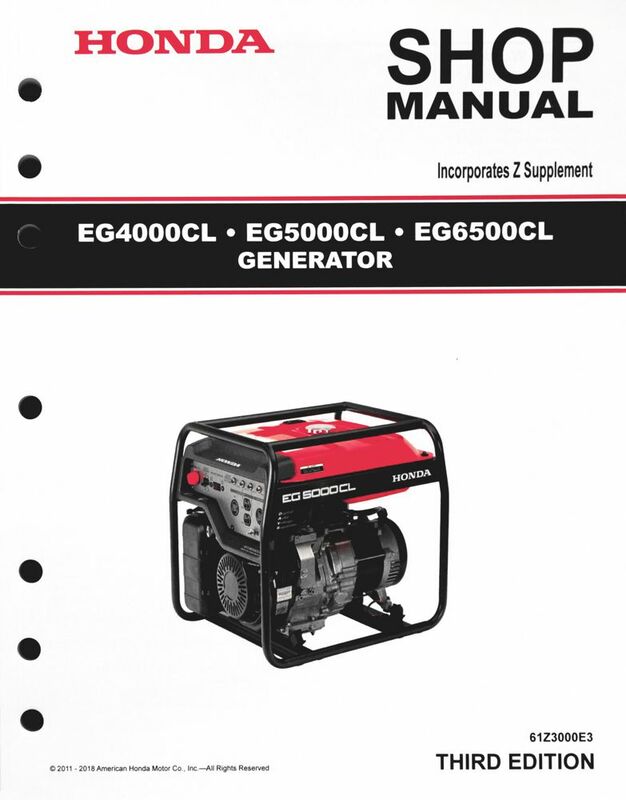 The Honda EG4000CL, EG5000CL, EG6500CL Generator Shop Manual covers service and repair procedures for the EG4000CL, EG5000CL, and EG6500CL generators. Enter your serial number prefix (such as EBBC) in the search box to locate applicable shop manuals, parts catalogs, and free downloads. 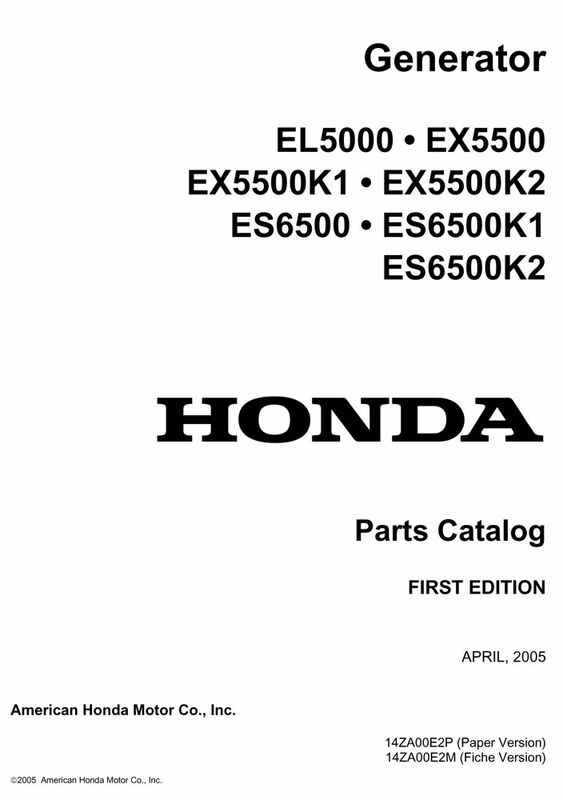 The Honda EL5000, ES6500, EX5500 Generator Shop Manual covers service and repair procedures for the EL5000, ES6500, and EX5500 generators. Enter your serial number prefix (such as EA1) in the search box to locate applicable shop manuals, parts catalogs, and free downloads. 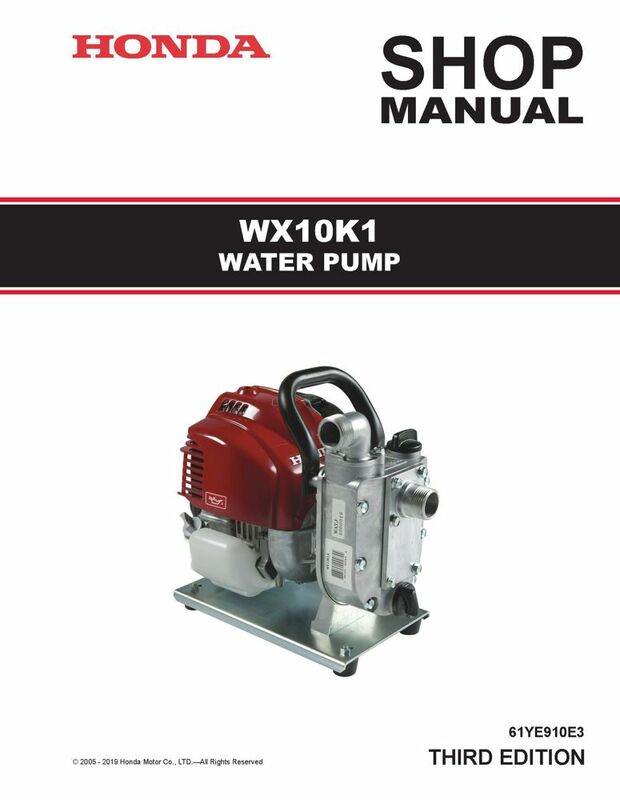 The Honda WX10K1 Water Pump Shop Manual covers service and repair procedures for the WX10K1 water pump. See images for Table of Contents and sample pages; bound, black/white, 8 1/2" x 11", 7-hole punched, 80 pages. Enter your serial number prefix (such as WATJ) in the search box to locate applicable shop manuals, parts catalogs, and free downloads. 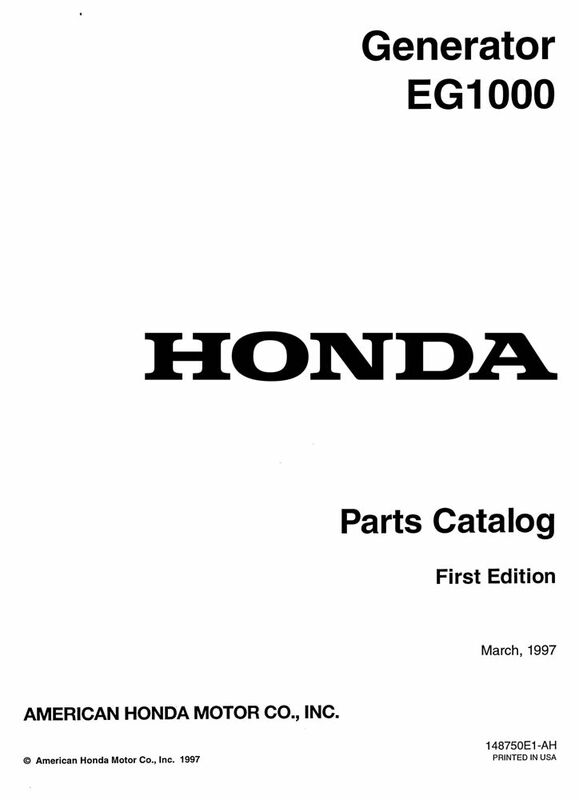 The Honda WX10T Water Pump Shop Manual covers service and repair procedures for the WX10T water pump. See images for Table of Contents and sample pages; bound, black/white, 8 1/2" x 11", 7-hole punched, 106 pages. Enter your serial number prefix (such as WAGT) in the search box to locate applicable shop manuals, parts catalogs, and free downloads. 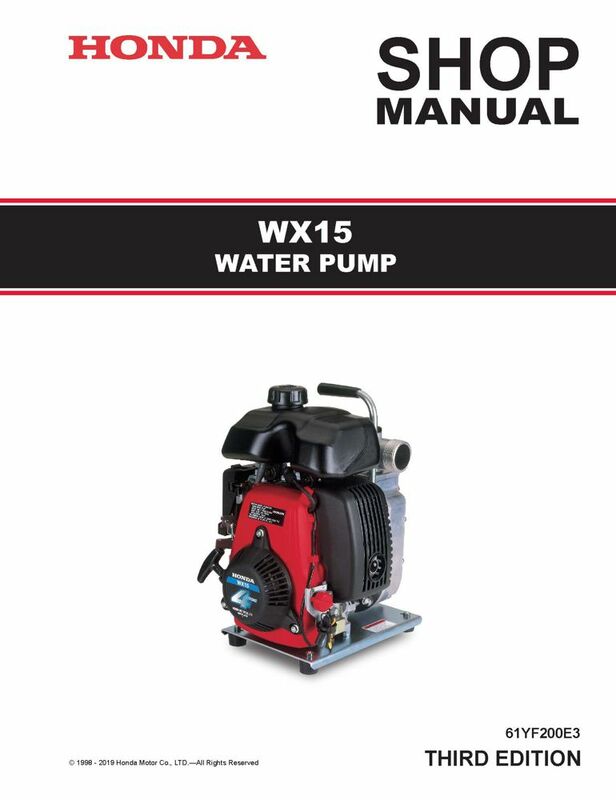 The Honda WX15 Water Pump Shop Manual covers service and repair procedures for the WX15 water pump. See images for Table of Contents and sample pages; bound, black/white, 8 1/2" x 11", 7-hole punched, 82 pages. Enter your serial number prefix (such as WZBY) in the search box to locate applicable shop manuals, parts catalogs, and free downloads. 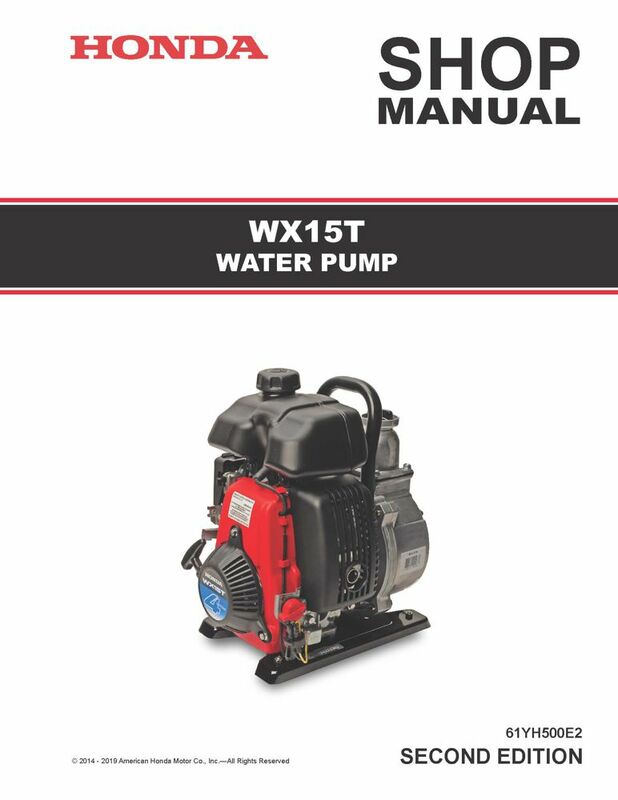 The Honda WX15T Water Pump Shop Manual covers service and repair procedures for the WX15T water pump. See images for Table of Contents and sample pages; bound, black/white, 8 1/2" x 11", 7-hole punched, 100 pages. Enter your serial number prefix (such as WAHT) in the search box to locate applicable shop manuals, parts catalogs, and free downloads. 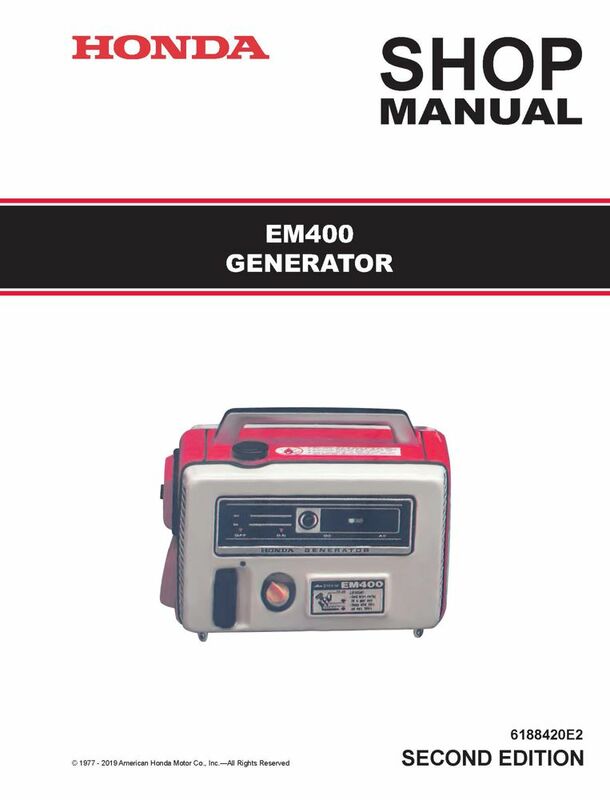 The Honda EM400 Generator Shop Manual covers service and repair procedures for the EM400K0 and EM400K1 generators. Enter your serial number prefix (such as EM400) in the search box to locate applicable shop manuals, parts catalogs, and free downloads. 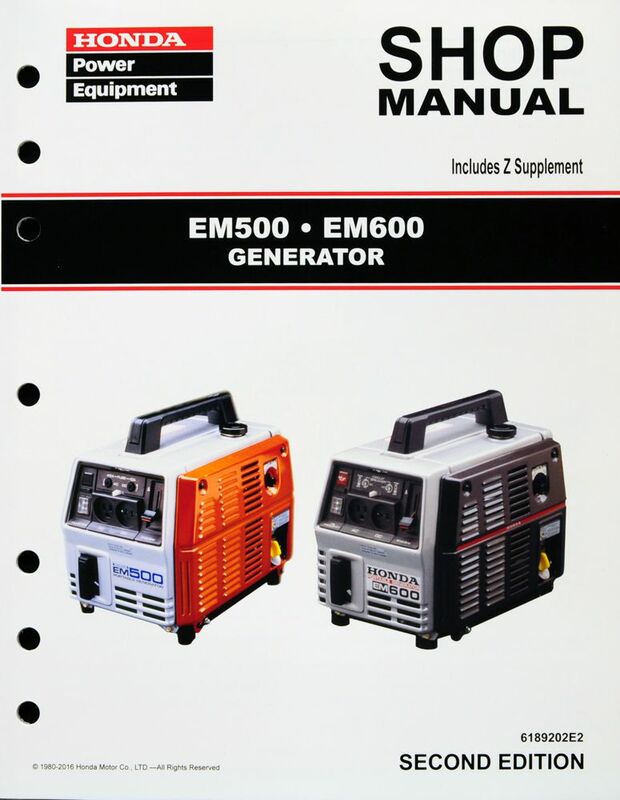 The Honda EM500, EM500K1, EM600 Generator Shop Manual covers service and repair procedures for the EM500, EM500K1, and EM600 generators. Enter your serial number prefix (such as EM600) in the search box to locate applicable shop manuals, parts catalogs, and free downloads. 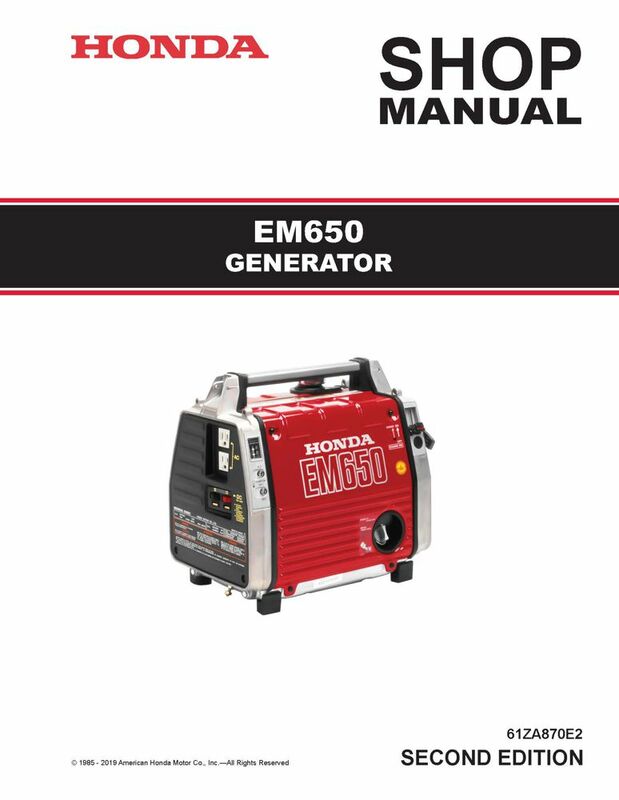 The Honda EM650 Generator Shop Manual covers service and repair procedures for the EM650 generators. Enter your serial number prefix (such as EA3) in the search box to locate applicable shop manuals, parts catalogs, and free downloads. 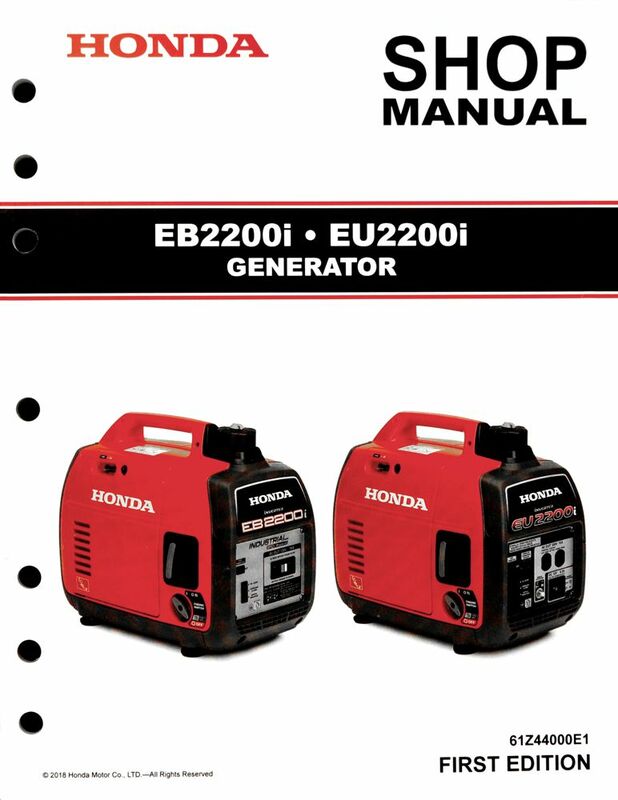 The Honda EB2200i, EU2200i Generator Shop Manual covers service and repair procedures for the EB2200i and EU2200i generators. Enter your serial number prefix (such as EAMT) in the search box to locate applicable shop manuals, parts catalogs, and free downloads. 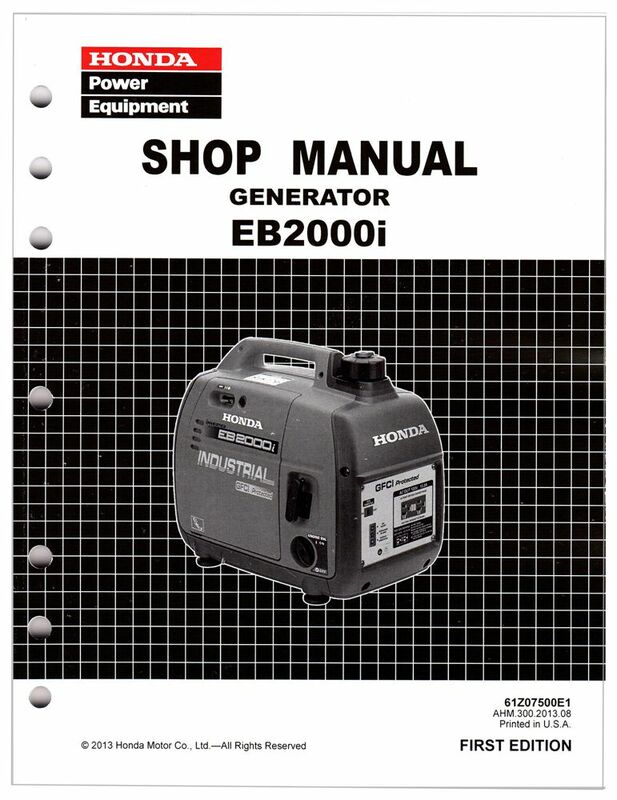 The Honda EB2800i, EG2800i Generator Shop Manual covers service and repair procedures for the EB2800i and EG2800i generators. Enter your serial number prefix (such as EABA) in the search box to locate applicable shop manuals, parts catalogs, and free downloads. 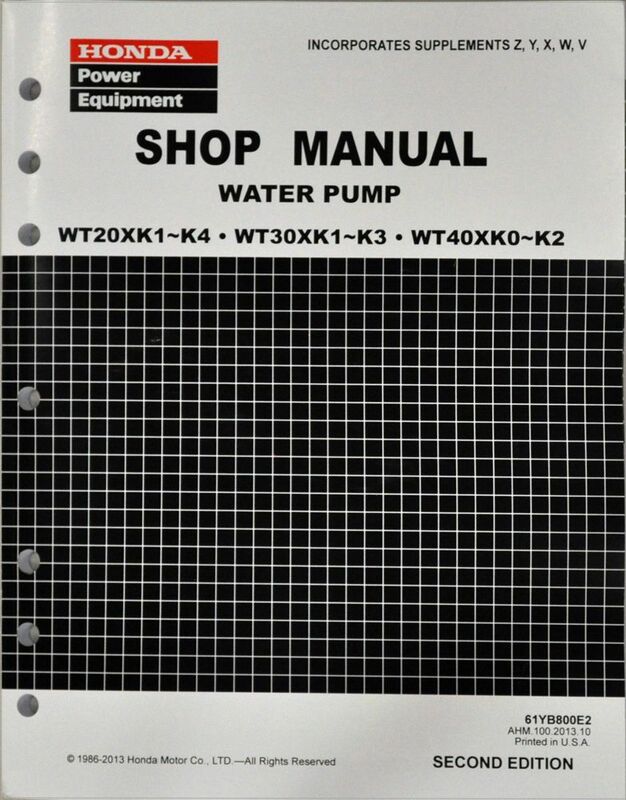 Shop manual for the Canadian (!!!) version of the EG2800i generator. English only; no French language available. 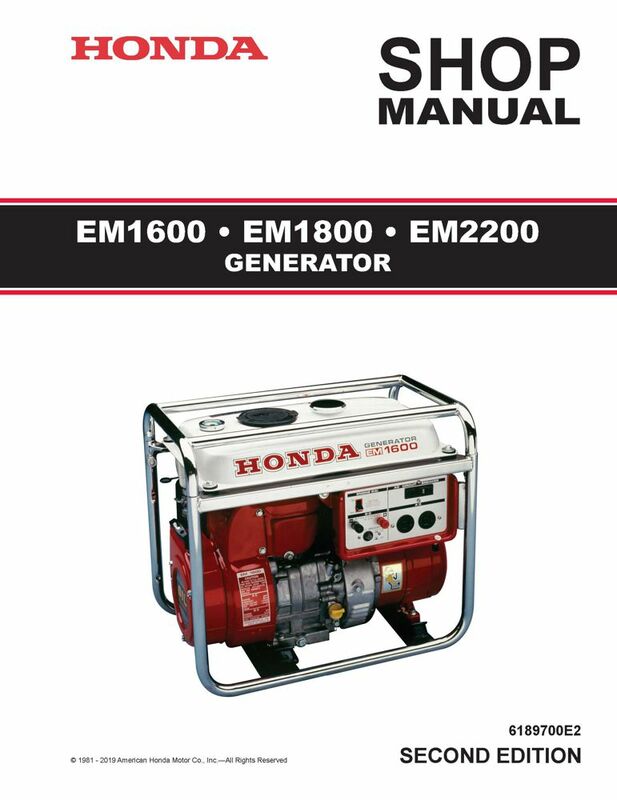 The Honda EM1600, EM1800, EM2200 Generator Shop Manual covers service and repair procedures for the EM1600, EM1800, and EM2200 generators. 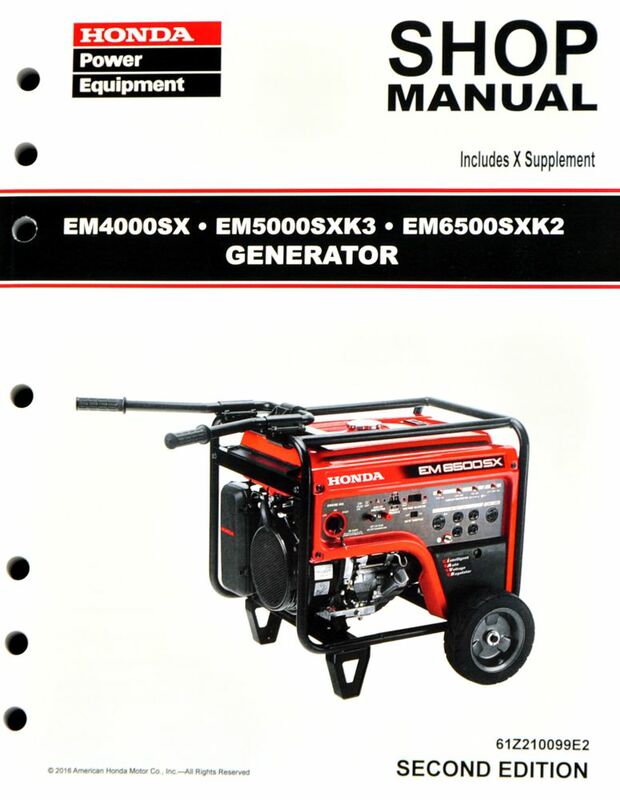 The Honda EM3000, EM4000, EMS4000, EMS4500 Generator Shop Manual covers service and repair procedures for the EM3000, EM4000, EMS4000, and EMS4500 generators. 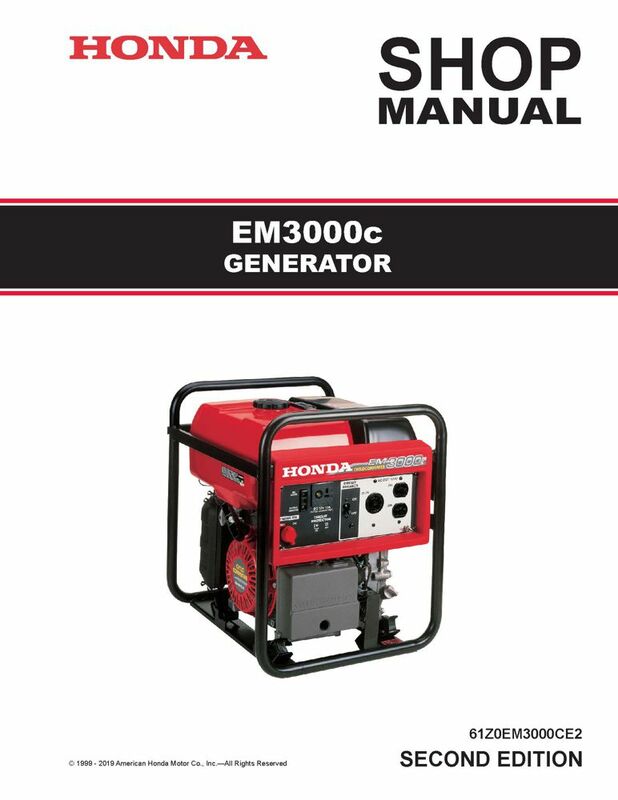 The Honda EM3000c Generator Shop Manual covers service and repair procedures for the EM3000c generators. Enter your serial number prefix (such as EZGL) in the search box to locate applicable shop manuals, parts catalogs, and free downloads. 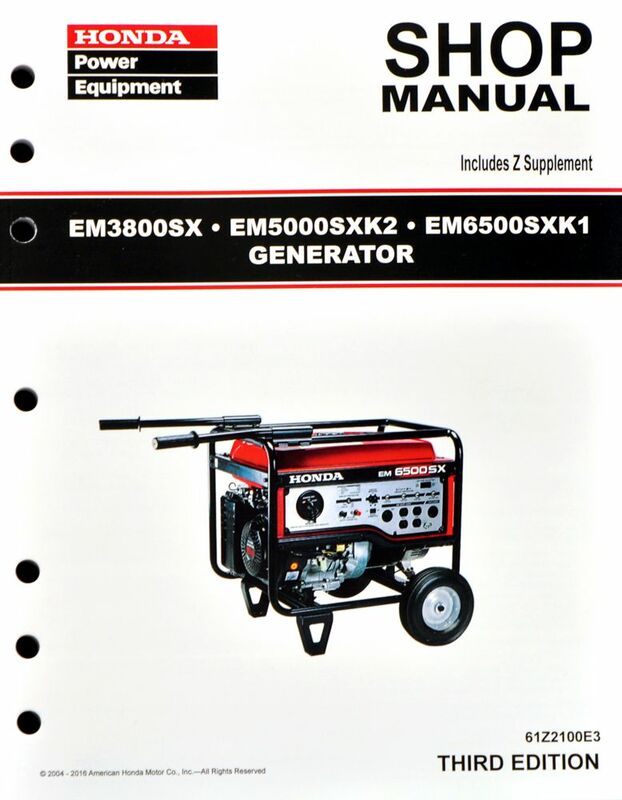 The Honda EM3800SX, EM5000SXK2, EM6500SXK1 Generator Shop Manual covers service and repair procedures for the EM3800SX, EM5000SXK2, and EM6500SXK1 generators. Enter your serial number prefix (such as EAPC) in the search box to locate applicable shop manuals, parts catalogs, and free downloads. 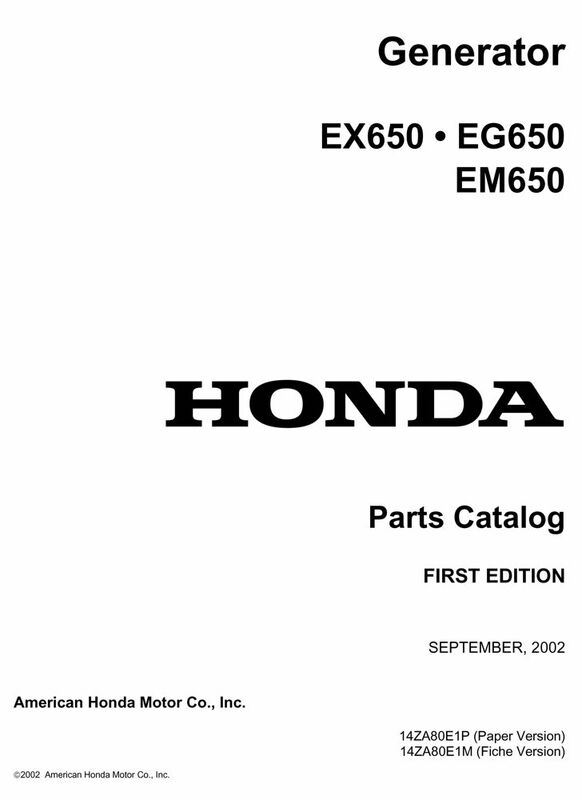 The Honda EM4000SX, EM5000SXK3, and EM6500SXK2 Generator Shop Manual covers service and repair procedures for the EM4000SX, EM5000SXK3, and EM6500SXK2 generators. Enter your serial number prefix (such as EBJC) in the search box to locate applicable shop manuals, parts catalogs, and free downloads. 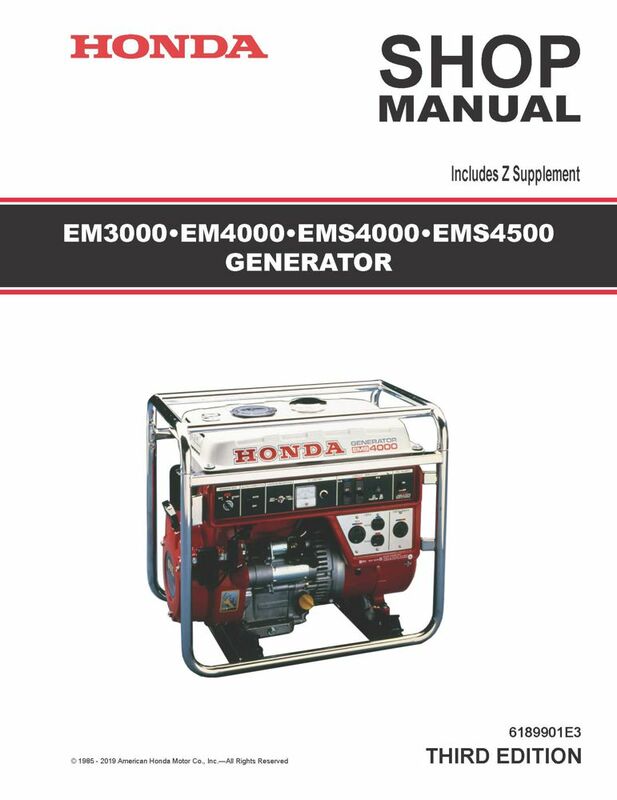 The Honda EM5000is, EM7000is Generator Shop Manual covers service and repair procedures for the EM5000is and EM7000is generators. Enter your serial number prefix (such as EAJJ) in the search box to locate applicable shop manuals, parts catalogs, and free downloads. 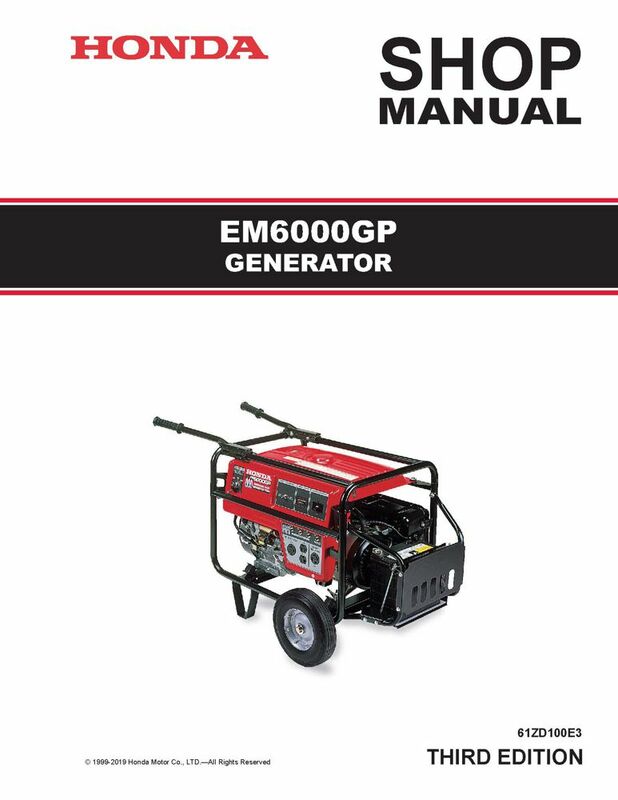 The Honda EM6000GP Generator Shop Manual covers service and repair procedures for the EM6000GP generators. Enter your serial number prefix (such as EZGR) in the search box to locate applicable shop manuals, parts catalogs, and free downloads. 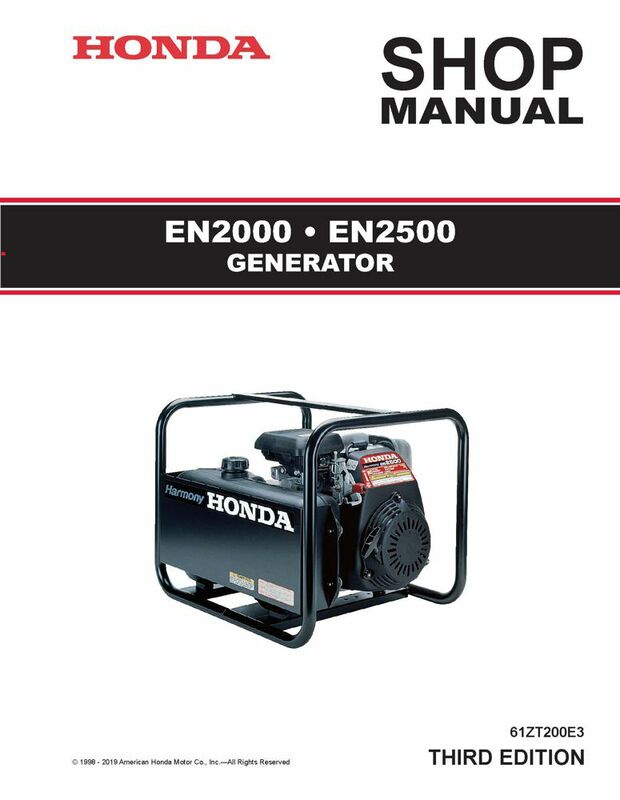 The Honda EN2000, EN2500 Generator Shop Manual covers service and repair procedures for the EN2000 and EN2500 generators. Enter your serial number prefix (such as EZFS) in the search box to locate applicable shop manuals, parts catalogs, and free downloads. 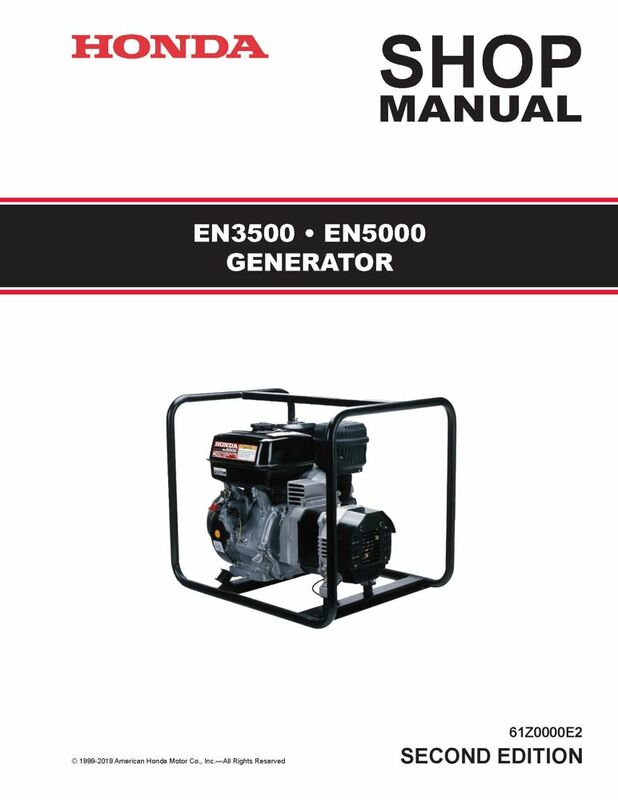 The Honda EN3500, EN5000 Generator Shop Manual covers service and repair procedures for the EN3500 and EN5000 generators. Enter your serial number prefix (such as EZGB) in the search box to locate applicable shop manuals, parts catalogs, and free downloads. 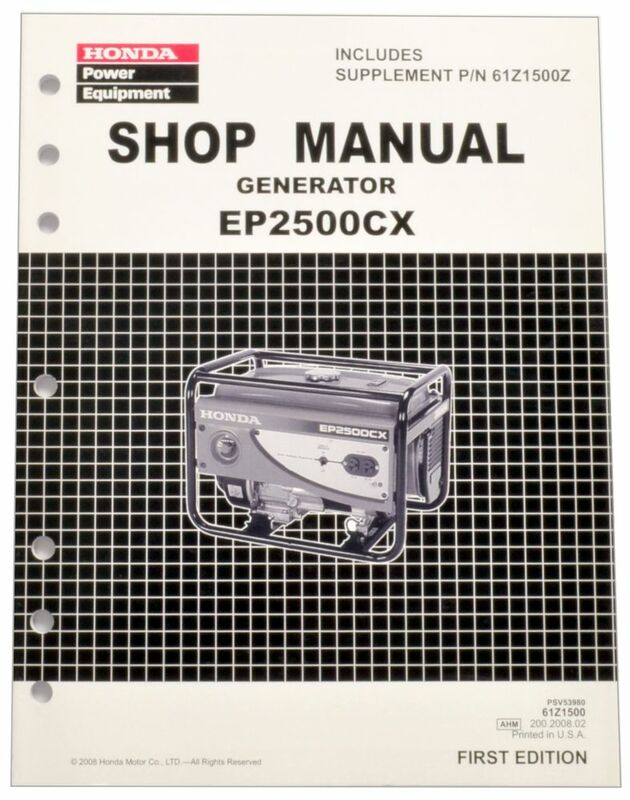 The Honda EP2500CX Generator Shop Manual covers service and repair procedures for the EP2500CX1 generators. Enter your serial number prefix (such as EAHC) in the search box to locate applicable shop manuals, parts catalogs, and free downloads. 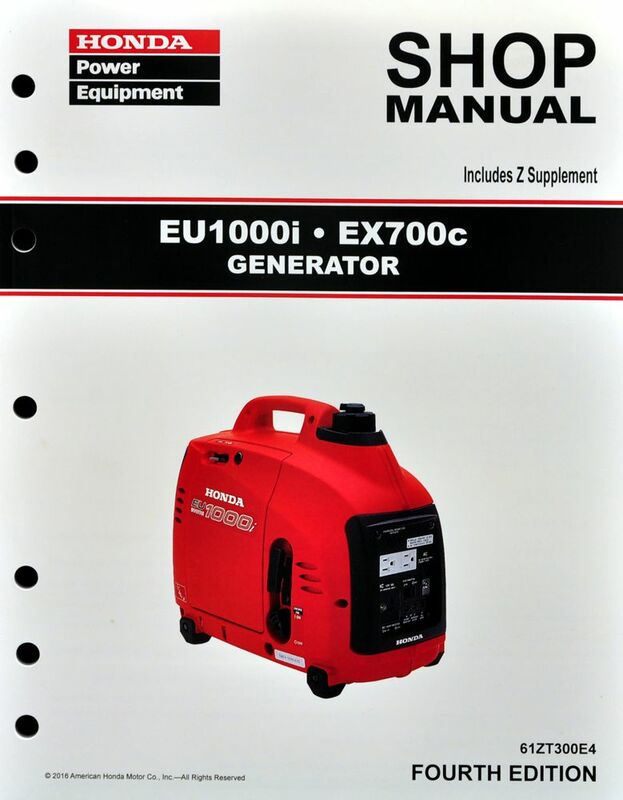 The Honda EU1000i Generator Shop Manual, including the EX700c Generator Shop Manual supplement, covers service and repair procedures for the EU1000i and EX700c generators. Enter your serial number prefix (such as EZGG) in the search box to locate applicable shop manuals, parts catalogs, and free downloads. 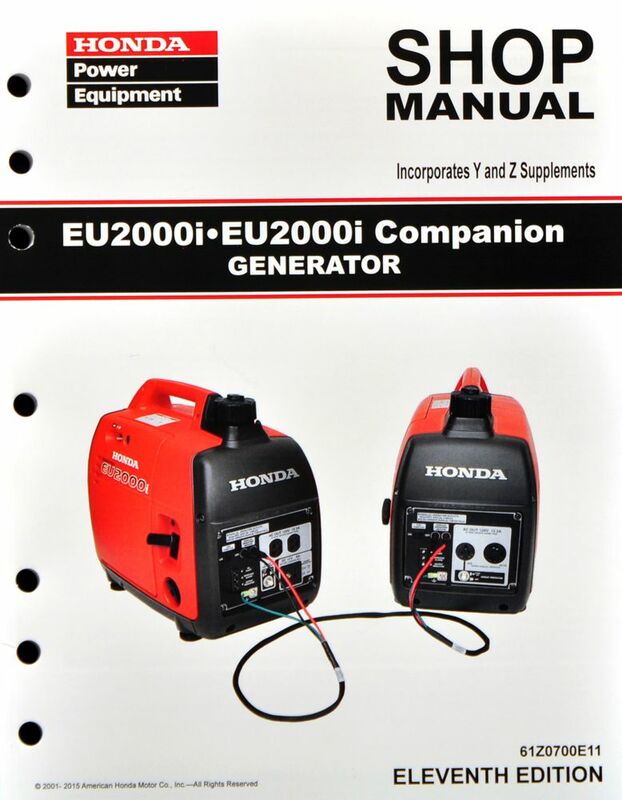 The Honda EU2000i Generator Shop Manual covers service and repair procedures for the EU2000i and EU2000i Companion generators. Enter your serial number prefix (such as EAAJ) in the search box to locate applicable shop manuals, parts catalogs, and free downloads. 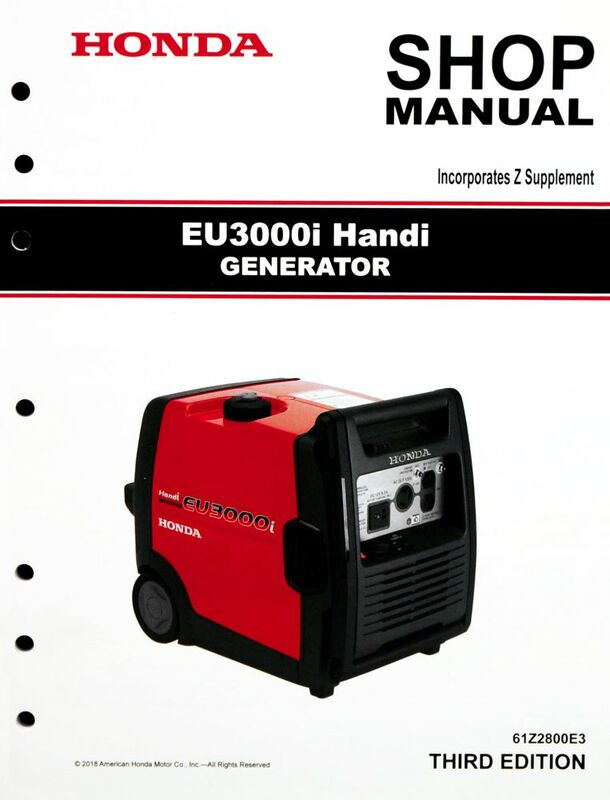 The Honda EU3000i Handi Generator Shop Manual covers service and repair procedures for the EU3000i Handi generators. Enter your serial number prefix (such as EAVJ) in the search box to locate applicable shop manuals, parts catalogs, and free downloads. 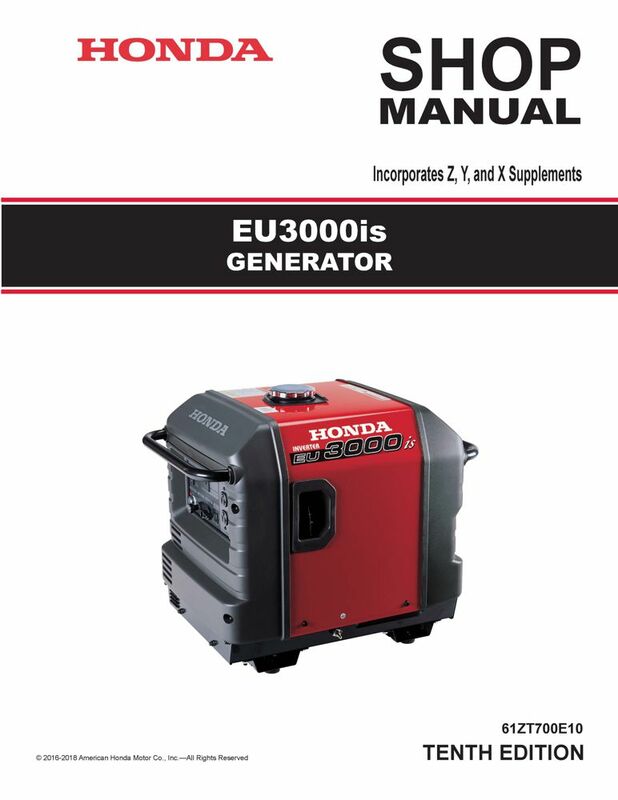 The Honda EU3000is Generator Shop Manual covers service and repair procedures for the EU3000is K0 generators. Enter your serial number prefix (such as EZGF) in the search box to locate applicable shop manuals, parts catalogs, and free downloads. 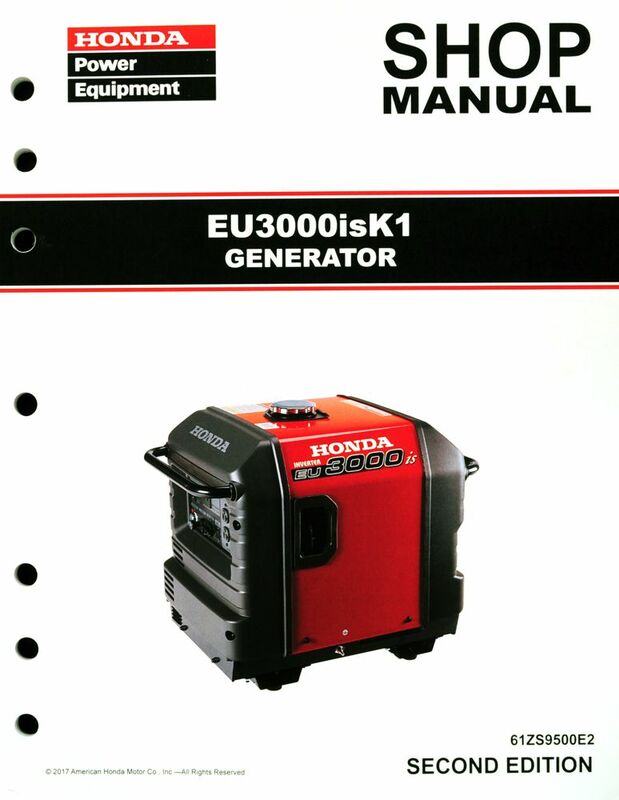 The Honda EU3000isK1 Generator Shop Manual covers service and repair procedures for the EU3000isK1 generator. 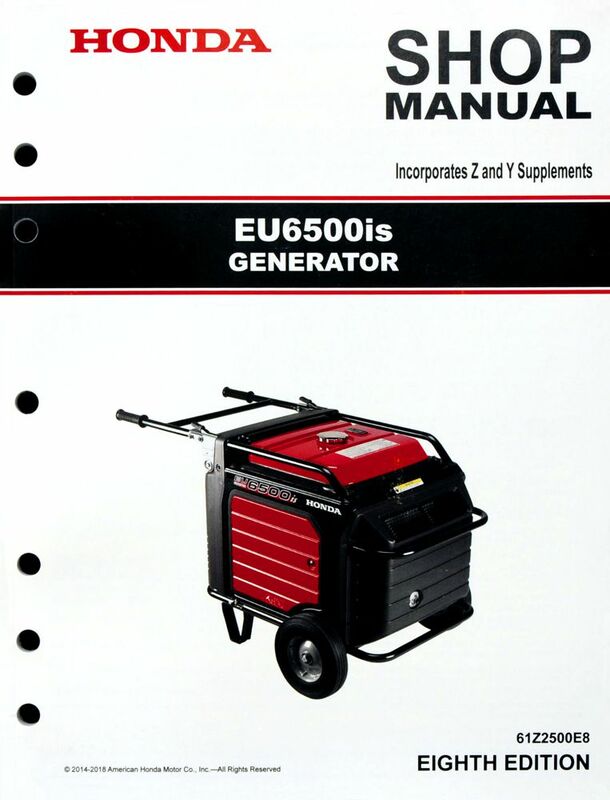 The Honda EU6500is Generator Shop Manual covers service and repair procedures for the EU6500is generators. Enter your serial number prefix (such as EASJ) in the search box to locate applicable shop manuals, parts catalogs, and free downloads. 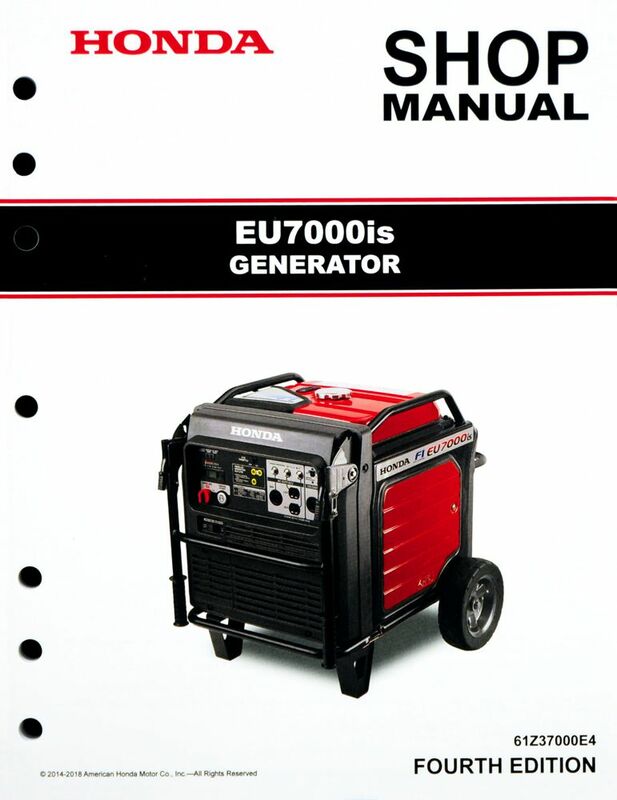 The Honda EU7000is Generator Shop Manual covers service and repair procedures for the EU7000is generators. See images for Table of Contents and sample page; bound, black/white, 8 1/2" x 11", 7-hole punched, 248 pages. Includes color wiring diagrams. Enter your serial number prefix (such as EEJD) in the search box to locate applicable shop manuals, parts catalogs, and free downloads. 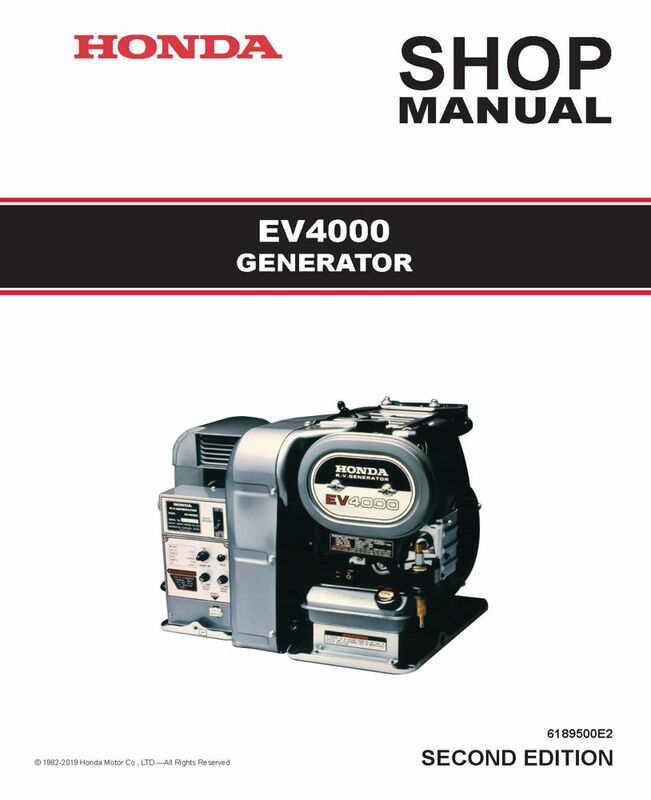 The Honda EV4000 Generator Shop Manual covers service and repair procedures for the EV4000 generators. Enter your serial number prefix (such as EV4000) in the search box to locate applicable shop manuals, parts catalogs, and free downloads. 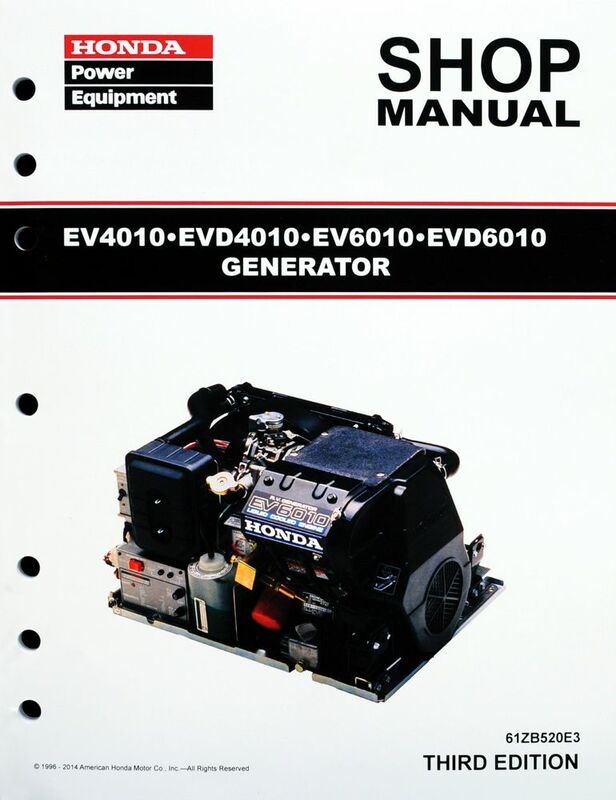 The Honda EV4010, EV6010, EVD4010, Generator Shop Manual covers service and repair procedures for the EV4010, EV6010, and EVD4010 generators. Enter your serial number prefix (such as EZCW) in the search box to locate applicable shop manuals, parts catalogs, and free downloads. 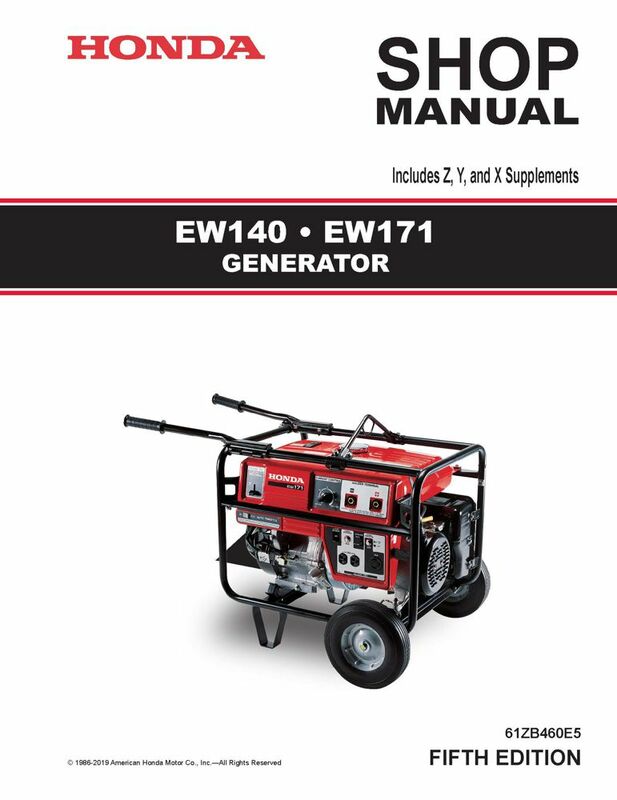 The Honda EW140, EW171 Generator Shop Manual covers service and repair procedures for the EW140 and EW171 welder generators. Enter your serial number prefix (such as EB1) in the search box to locate applicable shop manuals, parts catalogs, and free downloads. 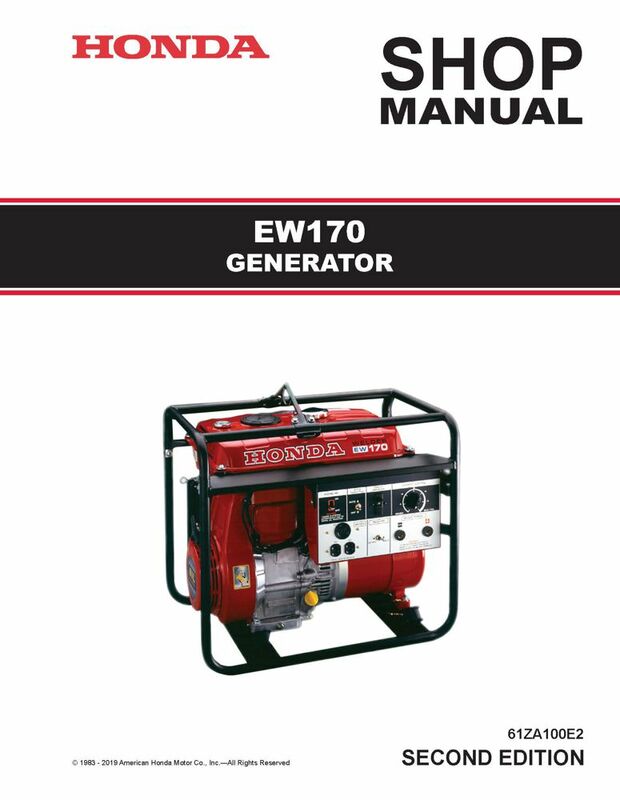 The Honda EW170 Generator Shop Manual covers service and repair procedures for the EW170 welder generators. Cover slightly damaged during shipping from print vendor. 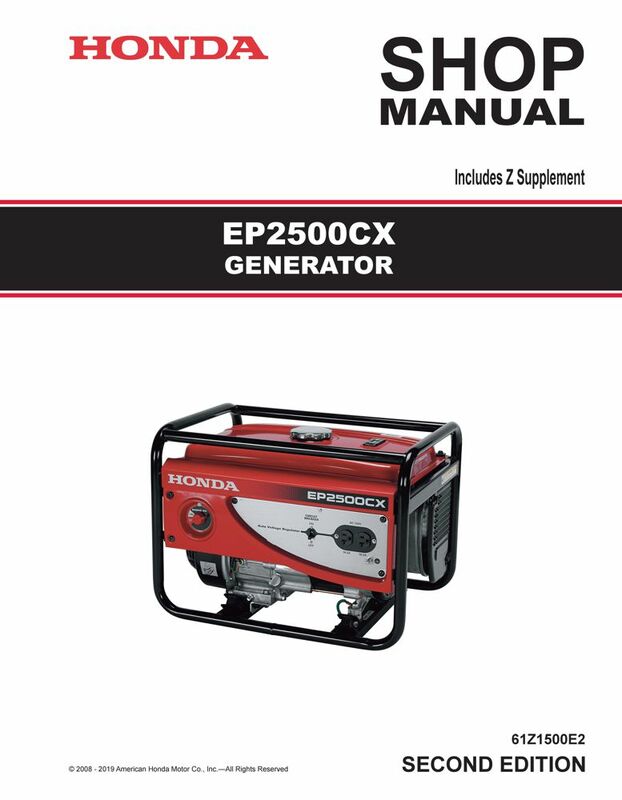 The Honda Power Equipment EP2500CX Generator Shop Manual covers service and repair procedures for the EP2500CX1 generators. Cover slightly damaged during shipping from print vendor. 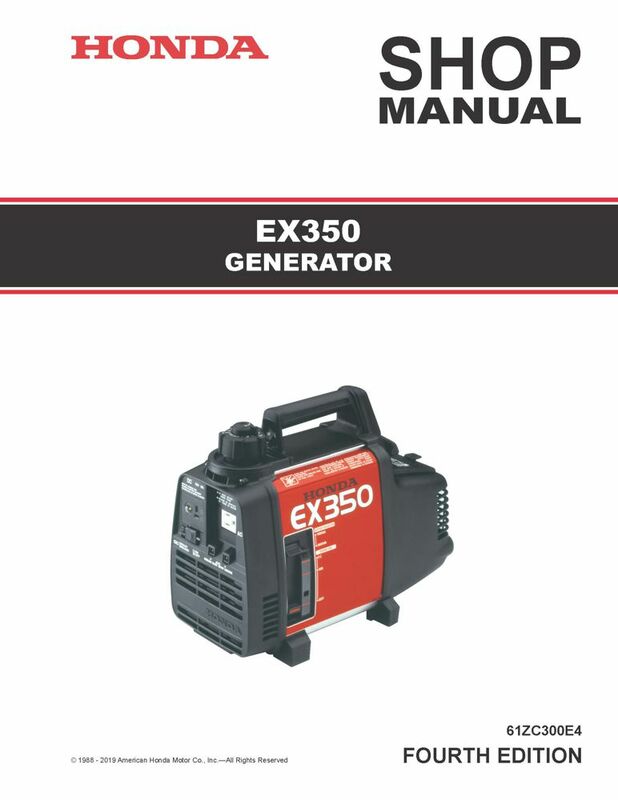 The Honda EX350 Generator Shop Manual covers service and repair procedures for the EX350 generators. Enter your serial number prefix (such as ECC) in the search box to locate applicable shop manuals, parts catalogs, and free downloads. 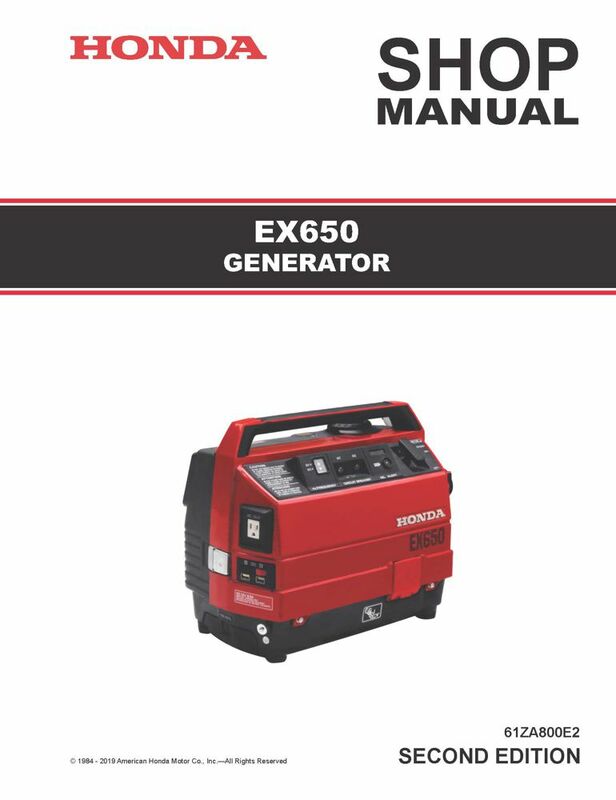 The Honda EX650 Generator Shop Manual covers service and repair procedures for the EX650 generators. Enter your serial number prefix (such as GE100) in the search box to locate applicable shop manuals, parts catalogs, and free downloads. 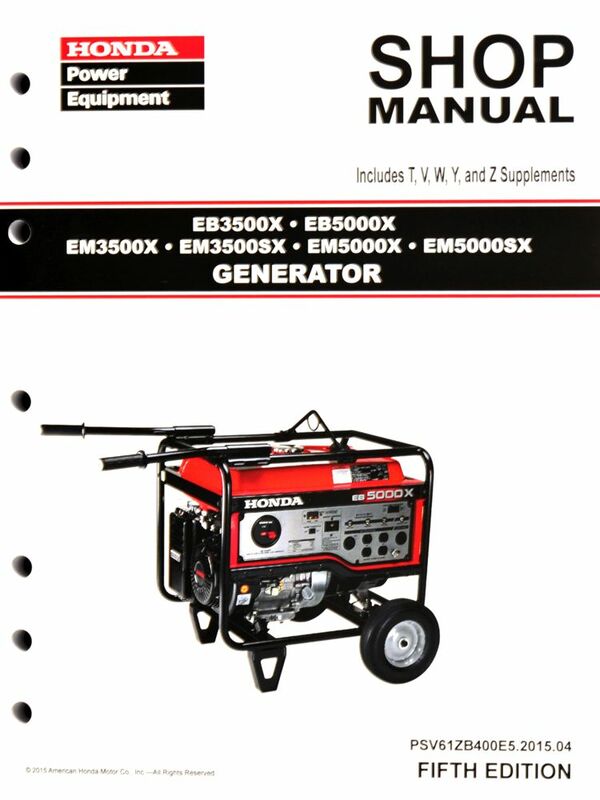 The Honda EX800 Generator Shop Manual covers service and repair procedures for the EX800 generators. 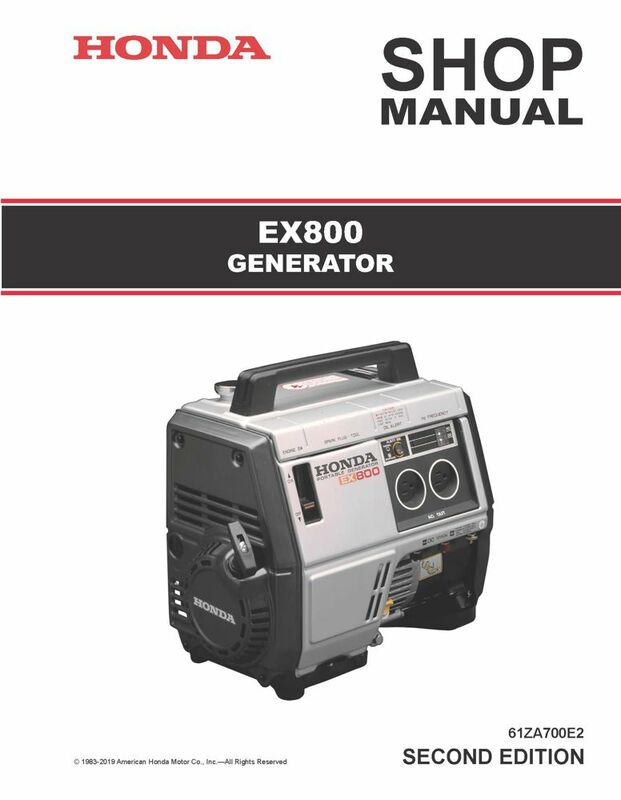 The Honda EX1000 Generator Shop Manual covers service and repair procedures for the EX1000 generators. Enter your serial number prefix (such as EA4) in the search box to locate applicable shop manuals, parts catalogs, and free downloads. 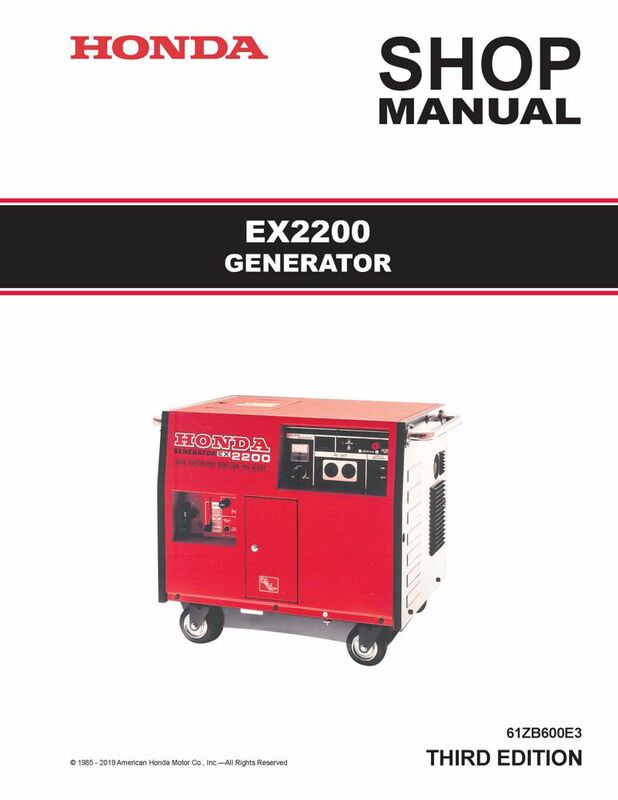 The Honda EX2200 Generator Shop Manual covers service and repair procedures for the EX2200 generators. Enter your serial number prefix (such as EA2) in the search box to locate applicable shop manuals, parts catalogs, and free downloads. 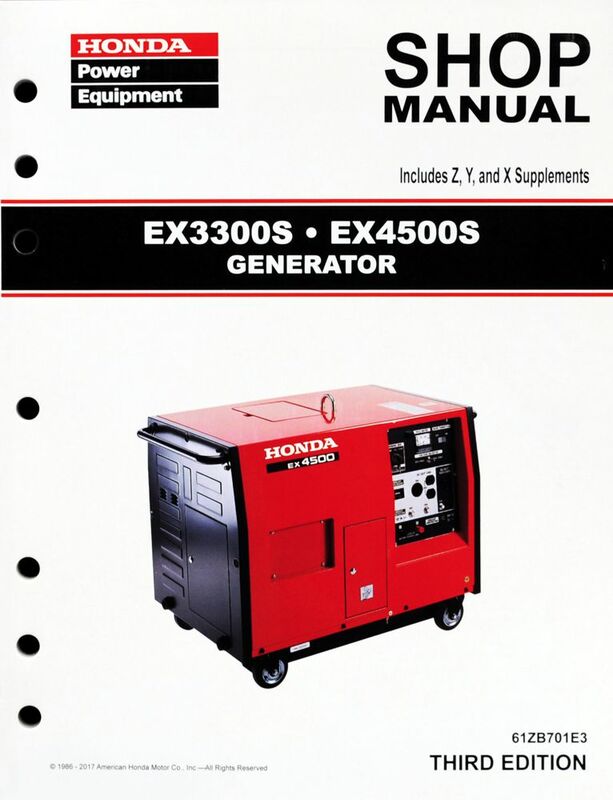 The Honda EX3300S, EX4500S Generator Shop Manual covers service and repair procedures for the EX3300SK0, EX3300SK1, EX4500SK0, and EX4500SK1 generators. Enter your serial number prefix (such as EB2) in the search box to locate applicable shop manuals, parts catalogs, and free downloads. 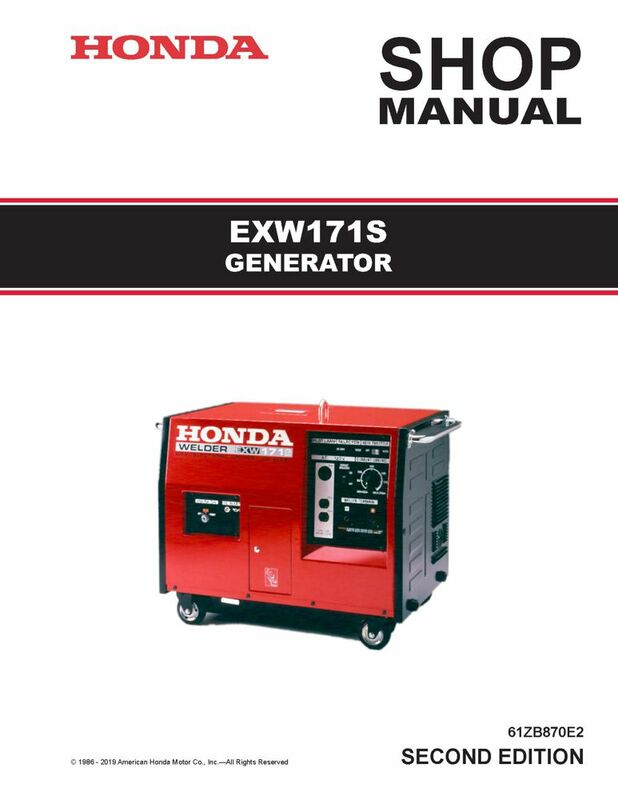 The Honda EXW171S Generator Shop Manual covers service and repair procedures for the EXW171S generators. Enter your serial number prefix (such as EB5) in the search box to locate applicable shop manuals, parts catalogs, and free downloads. 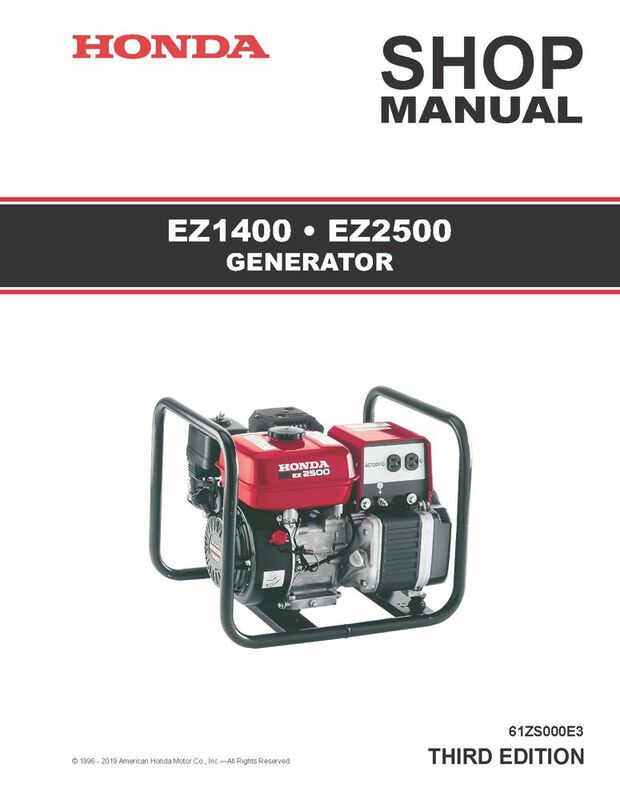 The Honda EZ1400, EZ2500 Generator Shop Manual covers service and repair procedures for the EZ1400 and EZ2500 generators. Enter your serial number prefix (such as EZEJ) in the search box to locate applicable shop manuals, parts catalogs, and free downloads. 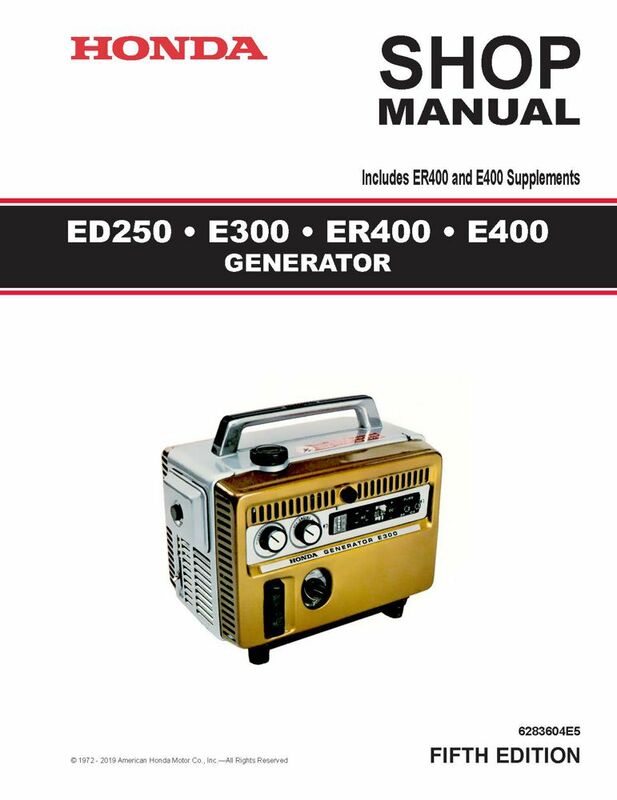 The Honda EZ3500, EZ5000 Generator Shop Manual covers service and repair procedures for the EZ3500 and EZ5000 generators. Enter your serial number prefix (such as EZEL) in the search box to locate applicable shop manuals, parts catalogs, and free downloads. Your Honda generator engine is designed and manufactured to precise specifications to ensure years of trouble-free operation. This includes the fuel system. This consumer handout outlines steps you can take to avoid fuel-related problems. Your Honda generator engine is designed and manufactured to precise specifications to ensure years of trouble-free operation. This includes the fuel system. However, the properties of the fuel you use can quickly deteriorate and cause starting or running problems and, in some cases, damage to the fuel system. The good news is most fuel-related problems can be avoided by following a few simple steps. Your Honda lawn mower is designed and manufactured to precise specifications to ensure years of trouble-free operation. This includes the fuel system. This consumer handout outlines steps you can take to avoid fuel-related problems. Your Honda lawn mower is designed and manufactured to precise specifications to ensure years of trouble-free operation. Your Honda snow blower is designed and manufactured to precise specifications to ensure years of trouble-free operation. This includes the fuel system. This consumer handout outlines steps you can take to avoid fuel-related problems. Your Honda snow blower is designed and manufactured to precise specifications to ensure years of trouble-free operation. Honda generators equipped with electric start contain low-maintenance batteries. These batteries require very little maintenance, but they do require periodic charging. 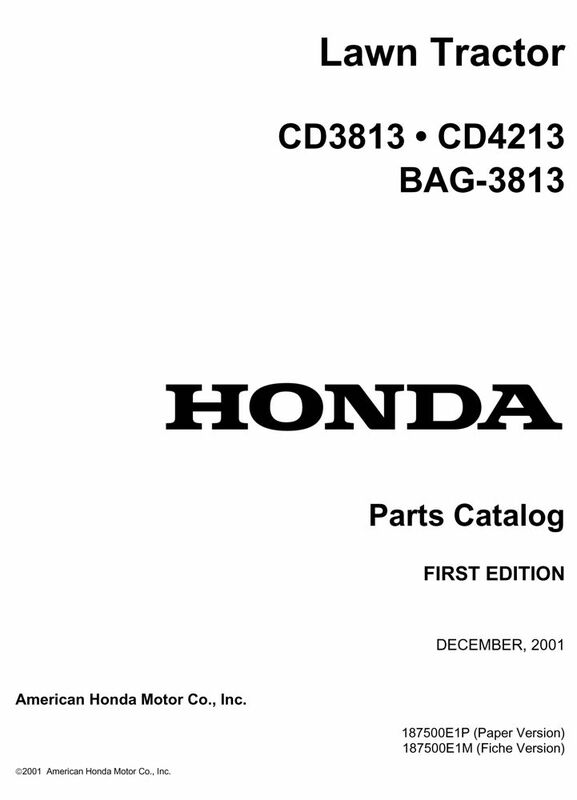 Paper parts catalog for the CD3813 Cutter Deck, CD4213 Cutter Deck, and BAG-3813 Grass Catcher Lawn Tractor Attachments. 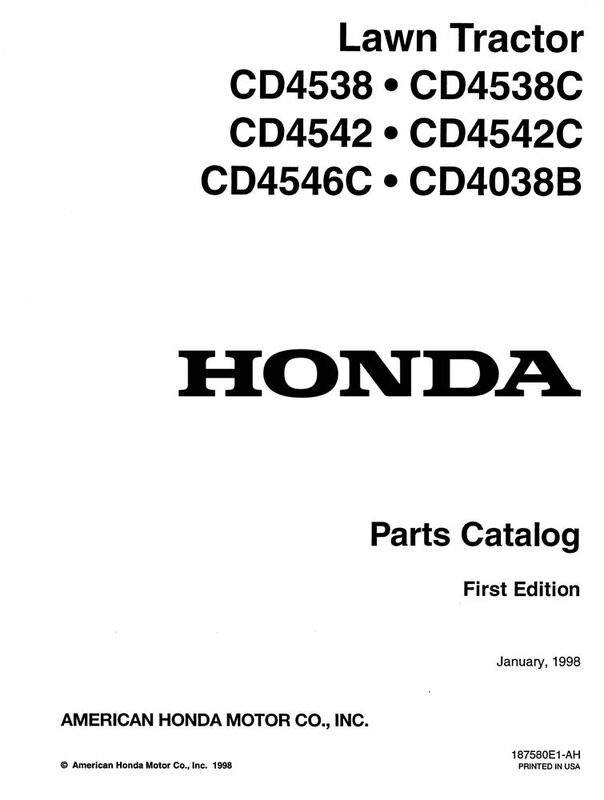 Paper parts catalog for the CD4538, CD4538C, CD4542, CD4542C, CD4546C, and CD4038B Lawn Tractor Cutter Deck Attachments. See images for Table of Contents and sample page. 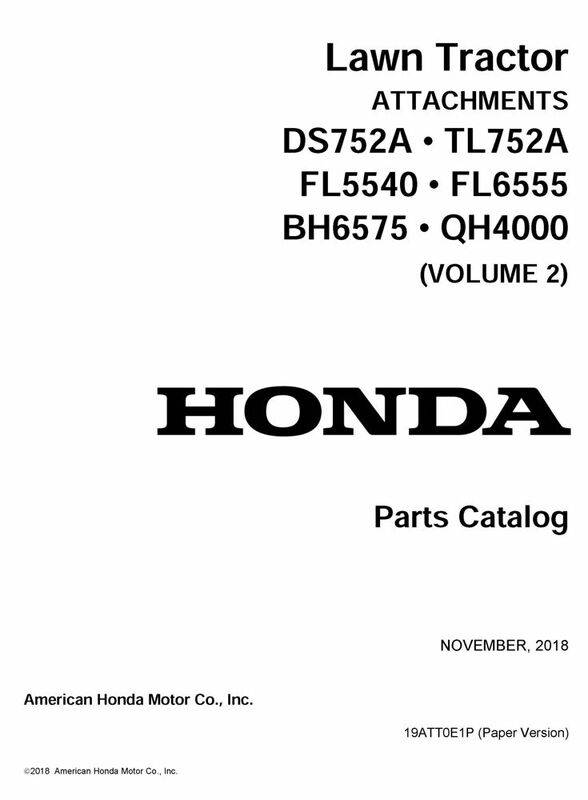 Paper parts catalog for the DS752A, TL752A, FL5540, FL6555, BH6575, and QH4000 Lawn Tractor Attachments. 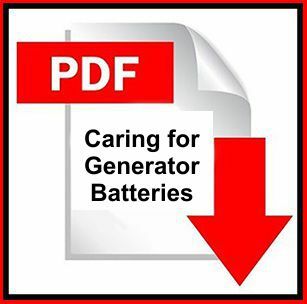 Paper parts catalog for the E1500, E1500K1, E1500K2, and E1500K3 Generators. See FAQs for assistance in locating your frame serial number. Enter your serial number prefix (such as E1500) in the search box to locate applicable shop manuals, parts catalogs, and free downloads. 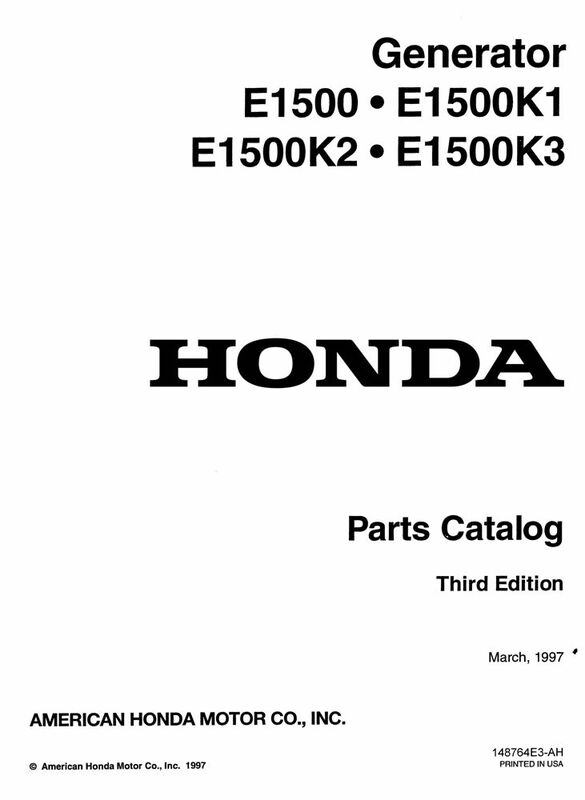 Paper parts catalog for the E1500K4 Generator. See FAQs for assistance in locating your frame serial number. 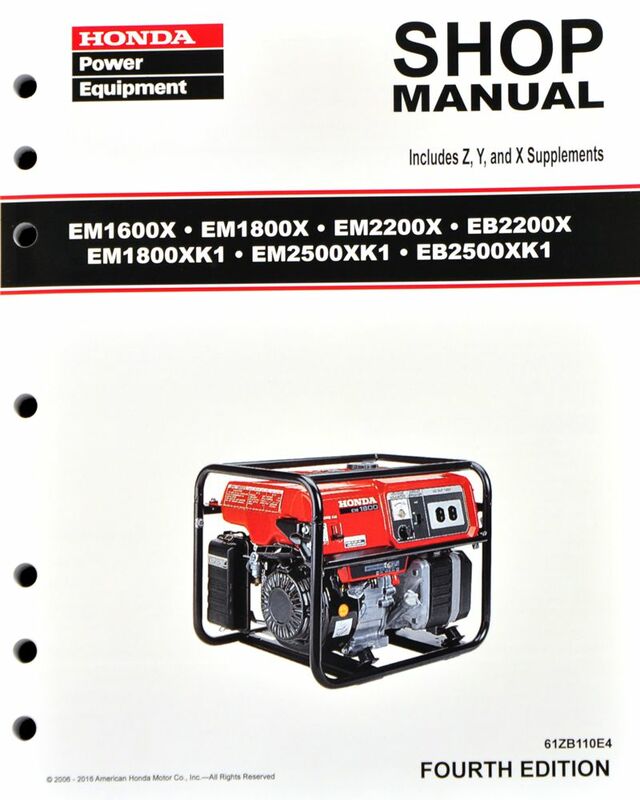 Paper parts catalog for the E2500K2 and E2500K3 Generators. See FAQs for assistance in locating your frame serial number. Enter your serial number prefix (such as E2500) in the search box to locate applicable shop manuals, parts catalogs, and free downloads. 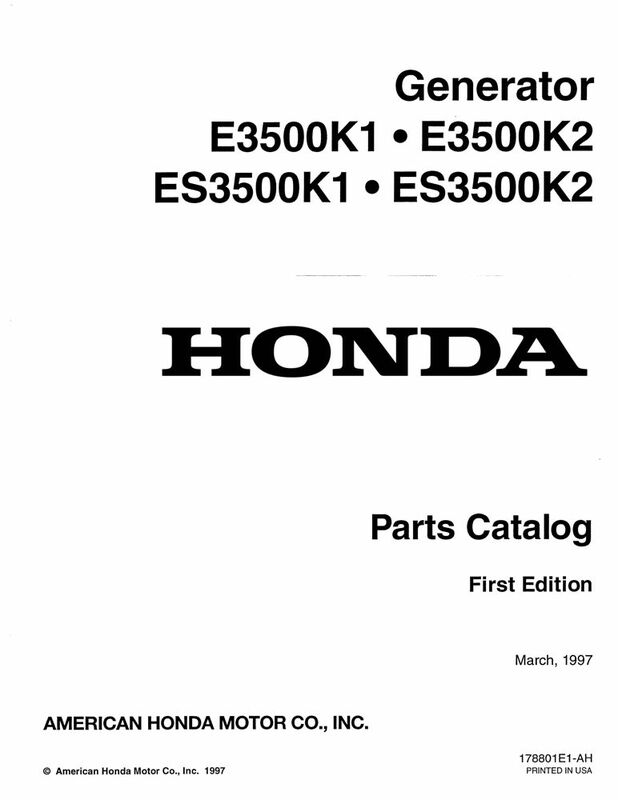 Paper parts catalog for the E2500K4 Generator. See FAQs for assistance in locating your frame serial number. 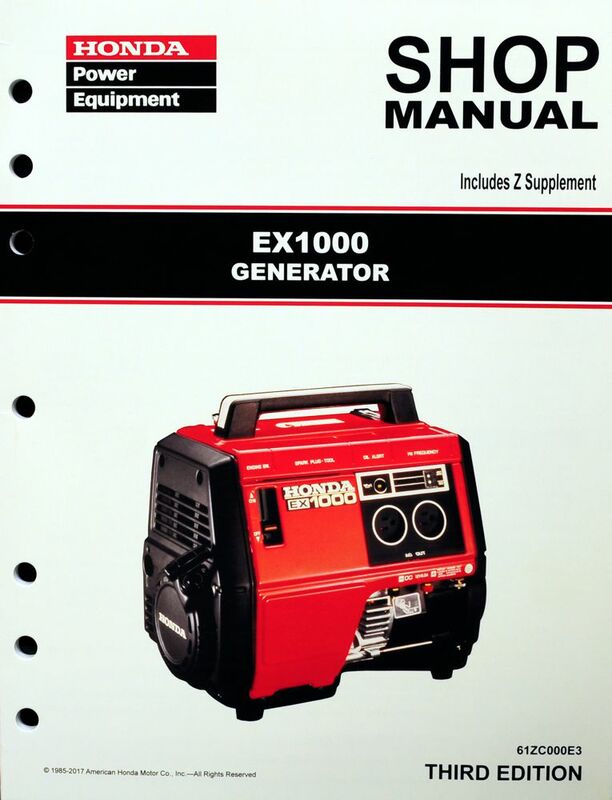 Paper parts catalog for the E300, E300K1, E300K2, and E300K3 Generators. See FAQs for assistance in locating your frame serial number. 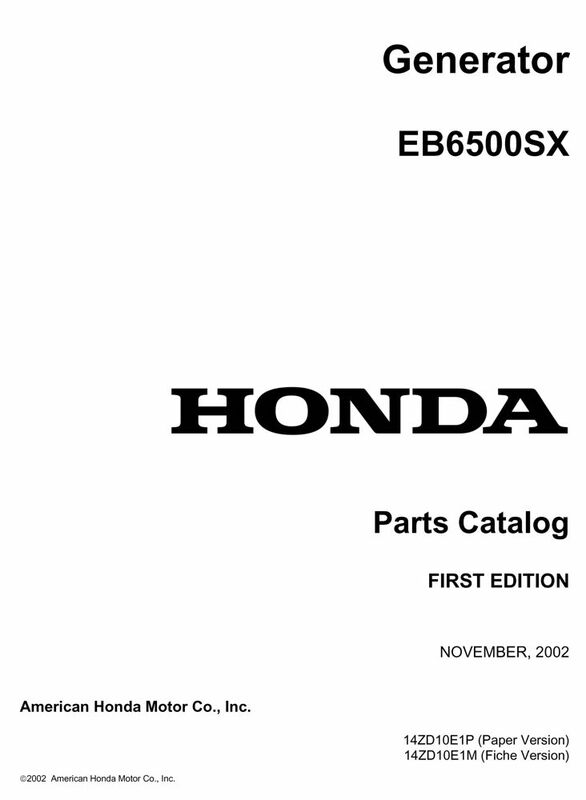 Enter your serial number prefix (such as E300) in the search box to locate applicable shop manuals, parts catalogs, and free downloads. 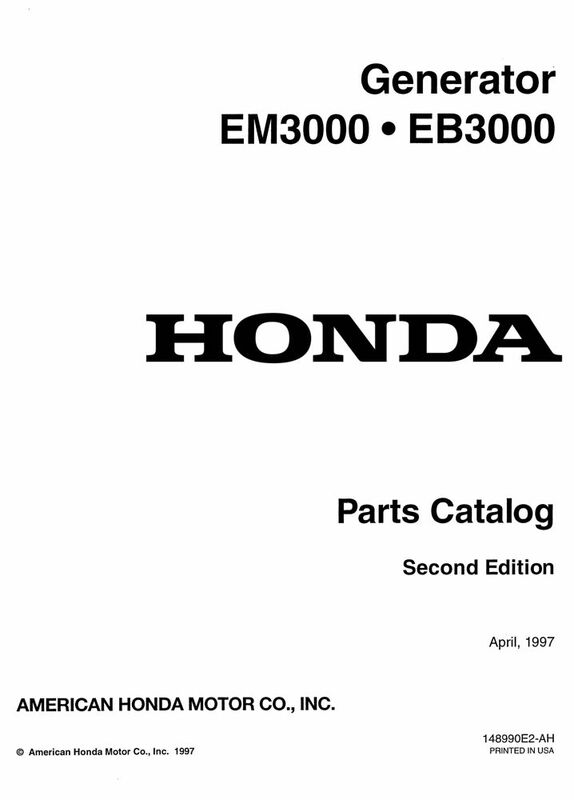 Paper parts catalog for the E3500K1, E3500K1, ES3500K1, and ES3500K2 Generators. See FAQs for assistance in locating your frame serial number. Enter your serial number prefix (such as E3500) in the search box to locate applicable shop manuals, parts catalogs, and free downloads. Paper parts catalog for the E40 Generator. See FAQs for assistance in locating your frame serial number. 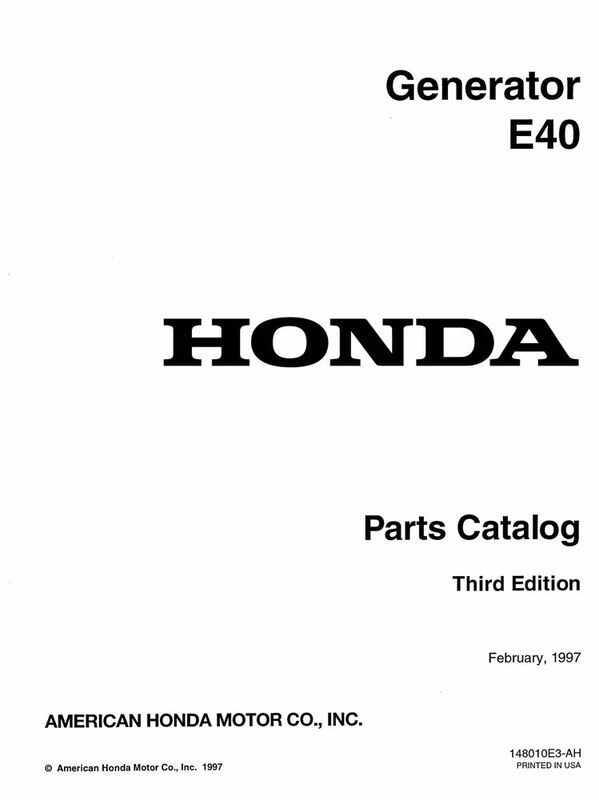 Enter your serial number prefix (such as E40) in the search box to locate applicable shop manuals, parts catalogs, and free downloads. 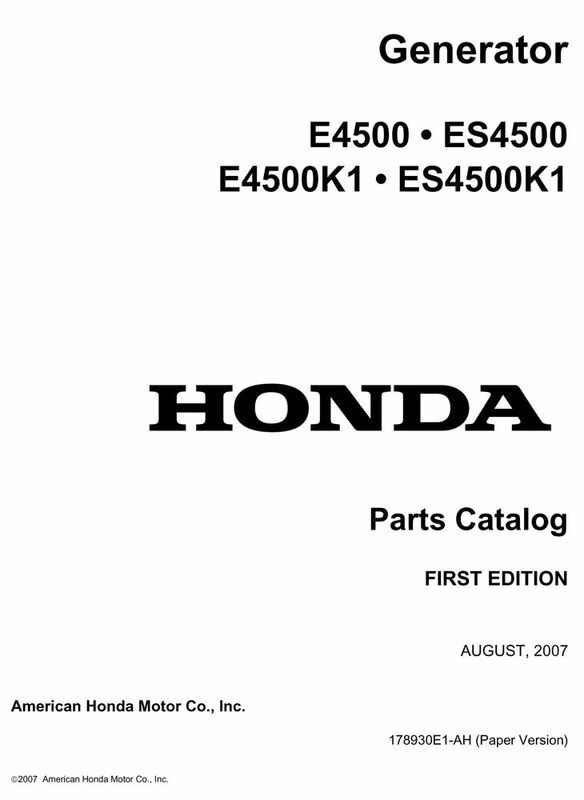 Paper parts catalog for the E4500, ES4500, E4500K1, and ES4500K1 Generator. See FAQs for assistance in locating your frame serial number. Enter your serial number prefix (such as E4500) in the search box to locate applicable shop manuals, parts catalogs, and free downloads. Paper parts catalog for the E900 Generator. See FAQs for assistance in locating your frame serial number. Enter your serial number prefix (such as E900) in the search box to locate applicable shop manuals, parts catalogs, and free downloads. 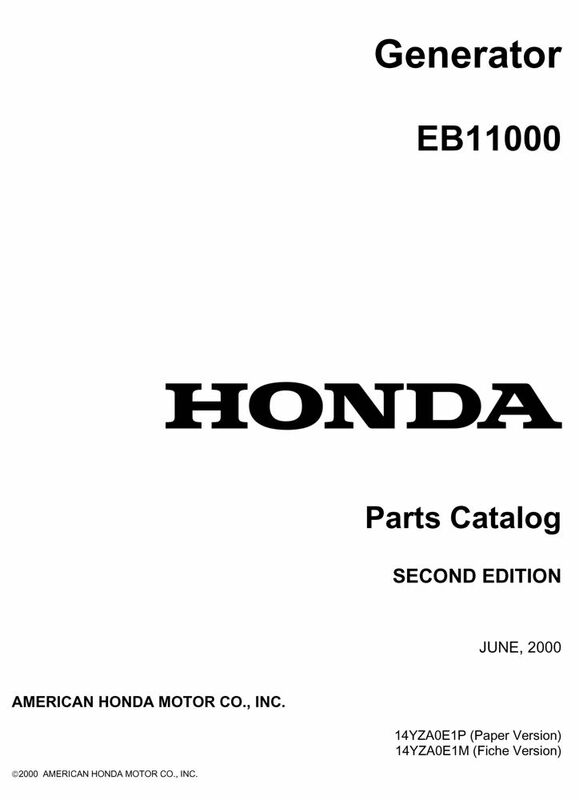 Paper parts catalog for the EB10000 Generator. See FAQs for assistance in locating your frame serial number. 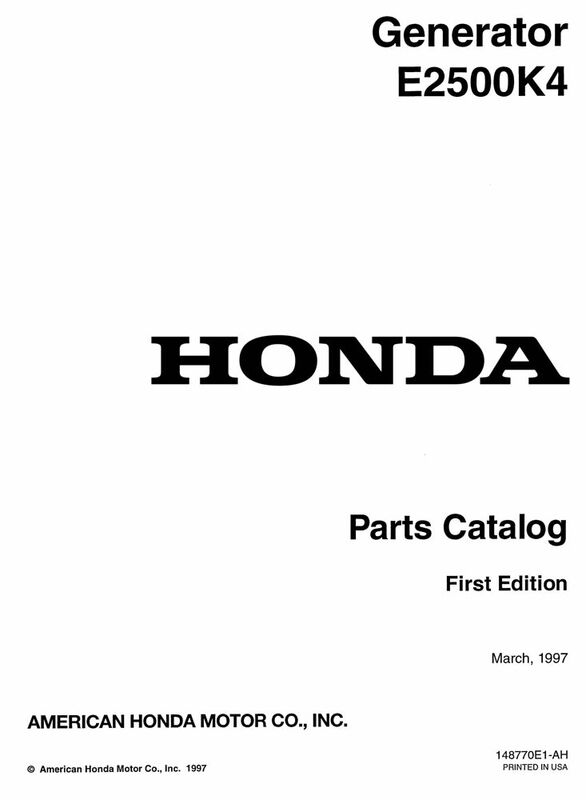 Paper parts catalog for the EB11000 Generator. See FAQs for assistance in locating your frame serial number. 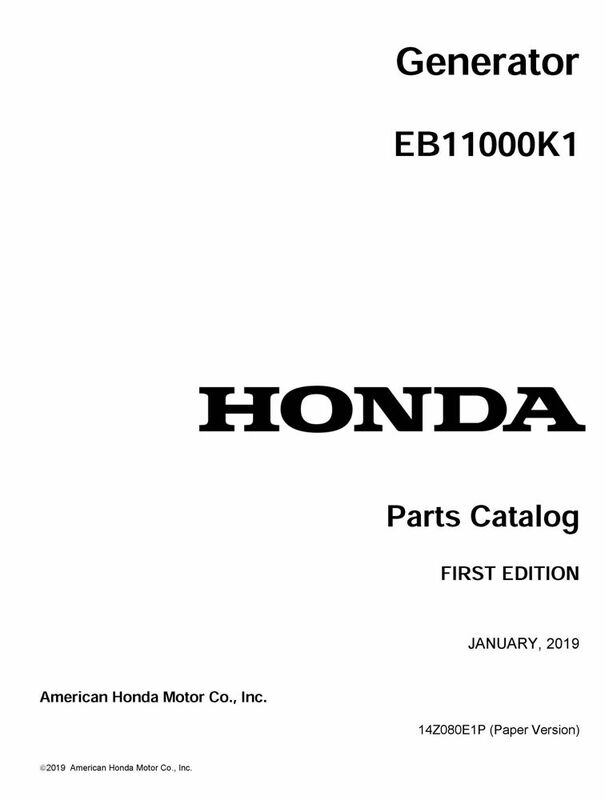 Paper parts catalog for the EB11000K1 Generator. See FAQs for assistance in locating your frame serial number. 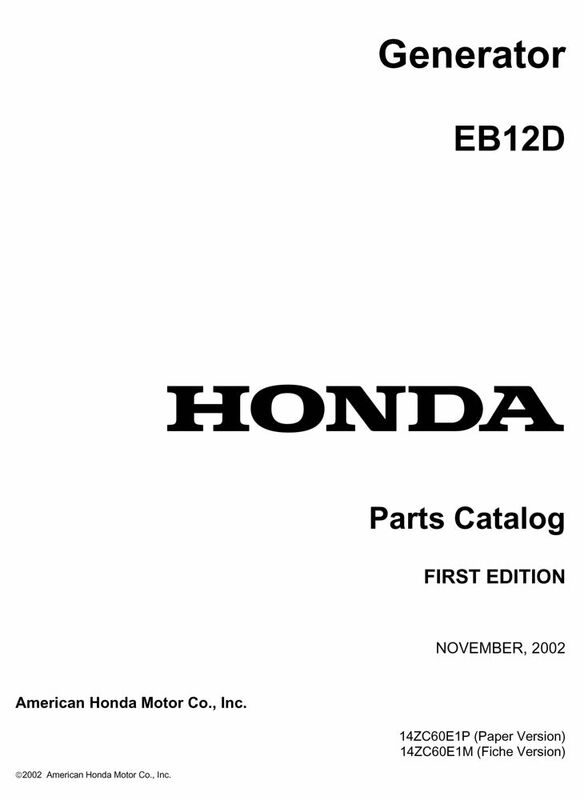 Paper parts catalog for the EB12D Generator. See FAQs for assistance in locating your frame serial number. Enter your serial number prefix (such as ECD) in the search box to locate applicable shop manuals, parts catalogs, and free downloads. 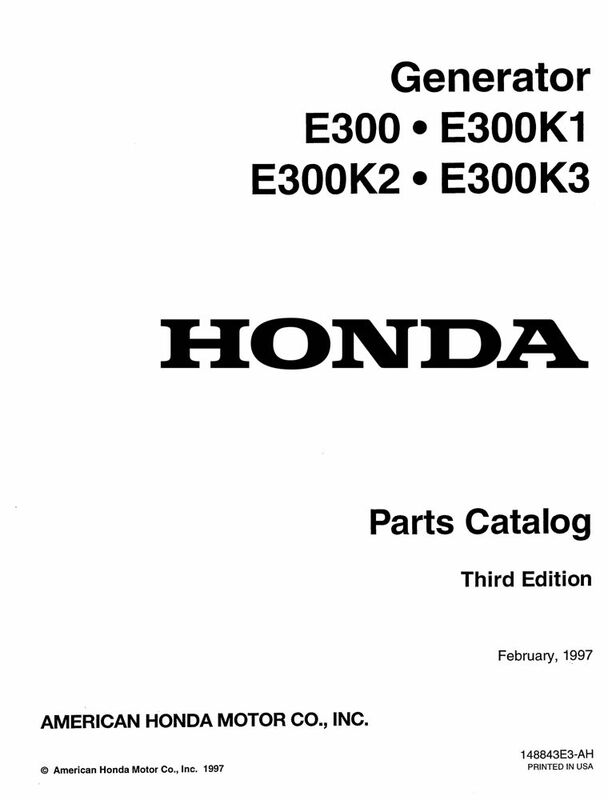 Paper parts catalog for the EB2000I Generator. See FAQs for assistance in locating your frame serial number. 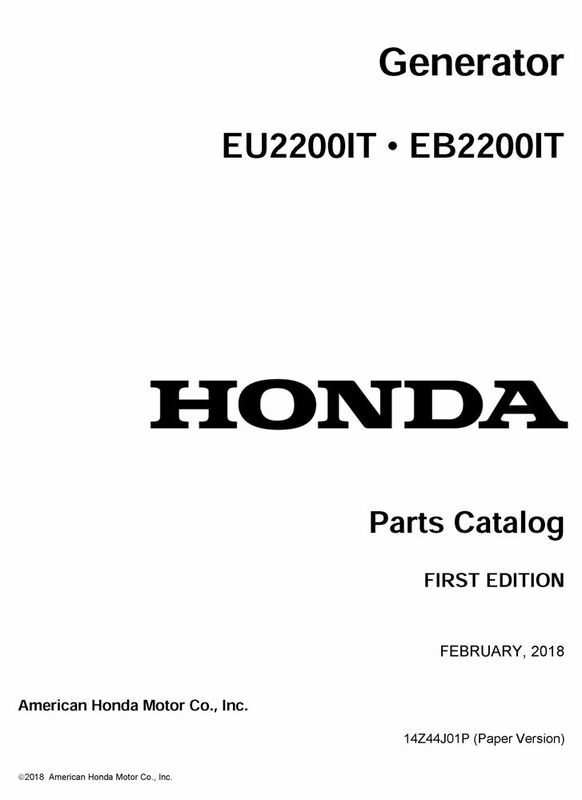 Paper parts catalog for the EB2000IT1 and EU2000IT1 Generators. See FAQs for assistance in locating your frame serial number. Enter your serial number prefix (such as EEAT) in the search box to locate applicable shop manuals, parts catalogs, and free downloads. 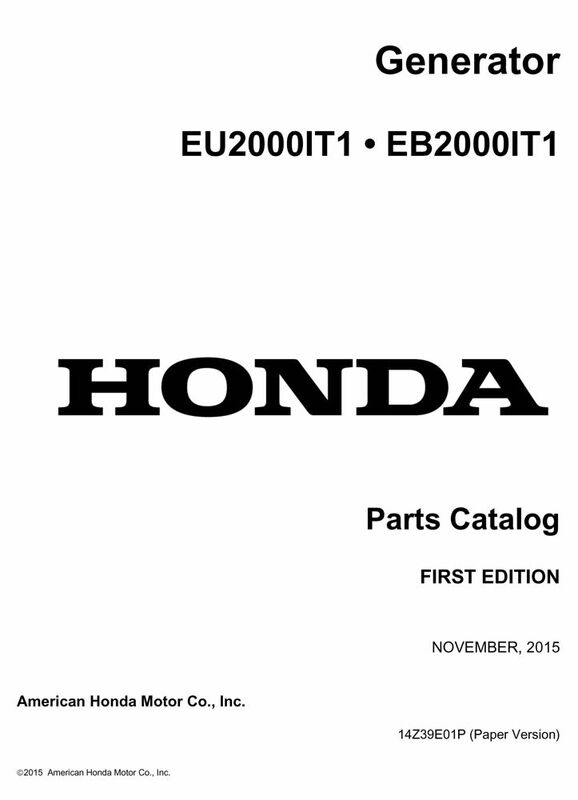 Paper parts catalog for the EB2200IT and EU2200IT Generators. See FAQs for assistance in locating your frame serial number. Enter your serial number prefix (such as EAJT) in the search box to locate applicable shop manuals, parts catalogs, and free downloads. Paper parts catalog for the EB2200X, EB2500XK1, EM1600X, EM1800X, EM1800XK1, EM2200X, and EM2500XK1 Generators. See FAQs for assistance in locating your frame serial number. Enter your serial number prefix (such as EZCP) in the search box to locate applicable shop manuals, parts catalogs, and free downloads. 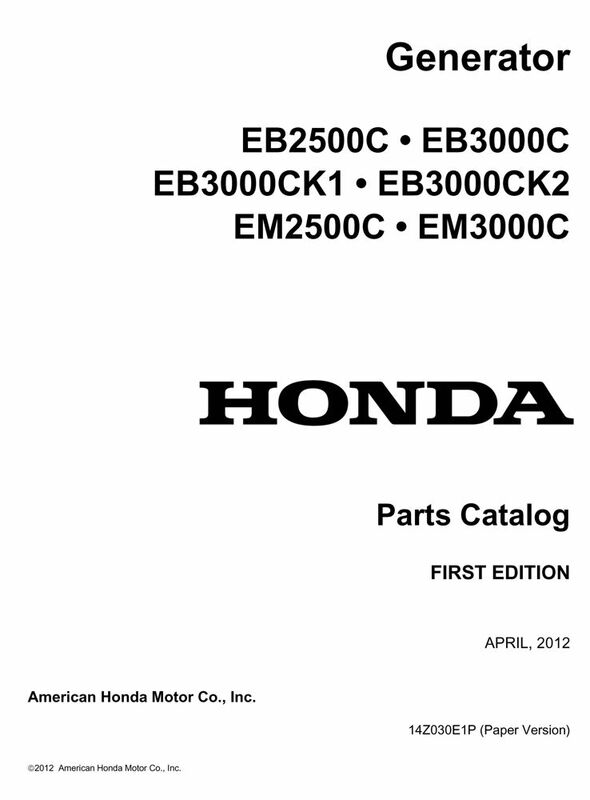 Paper parts catalog for the EB2500C, EB3000C, EB3000CK1, EB3000CK2, EM2500C, and EM3000C Generators. See FAQs for assistance in locating your frame serial number. Enter your serial number prefix (such as EZGN) in the search box to locate applicable shop manuals, parts catalogs, and free downloads. 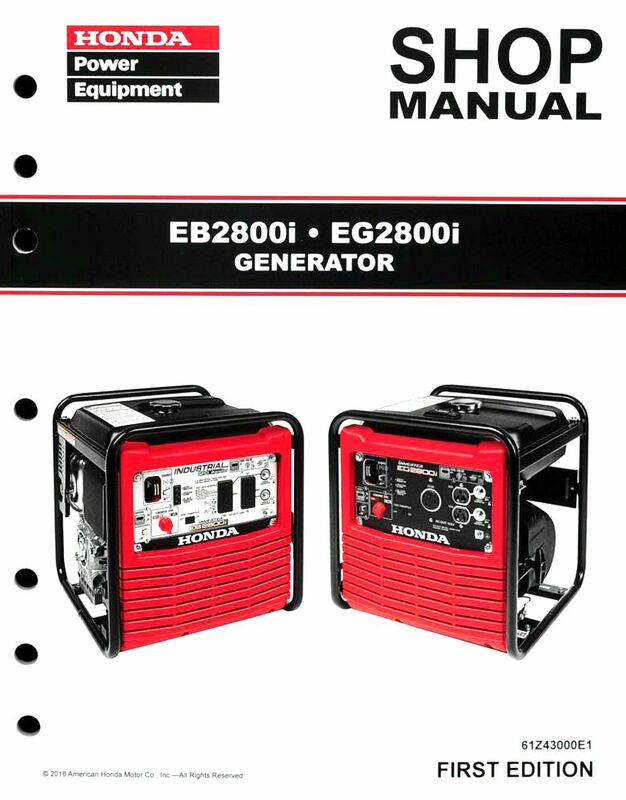 Paper parts catalog for the EB2800I and EG2800I Generators. See FAQs for assistance in locating your frame serial number. Enter your serial number prefix (such as EAAT) in the search box to locate applicable shop manuals, parts catalogs, and free downloads. 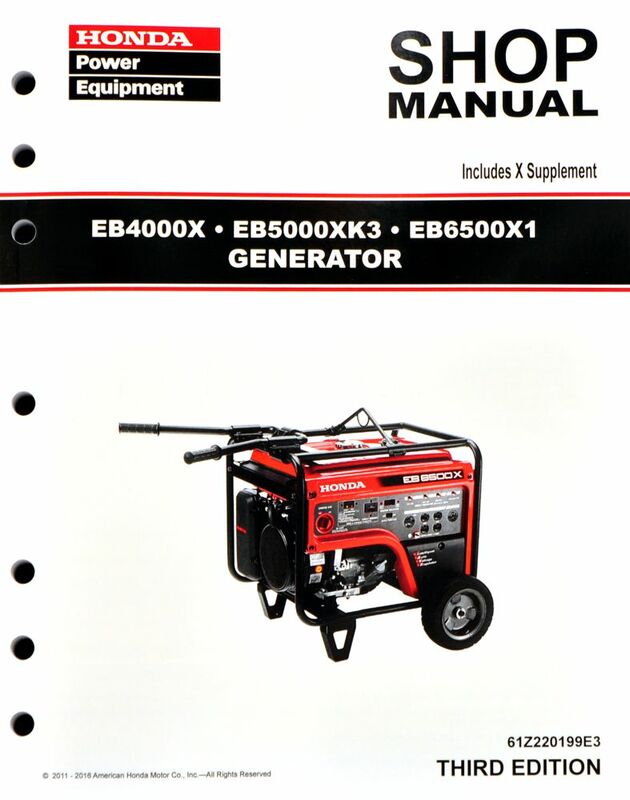 Paper parts catalog for the EB3000 and EM3000 Generators. See FAQs for assistance in locating your frame serial number. 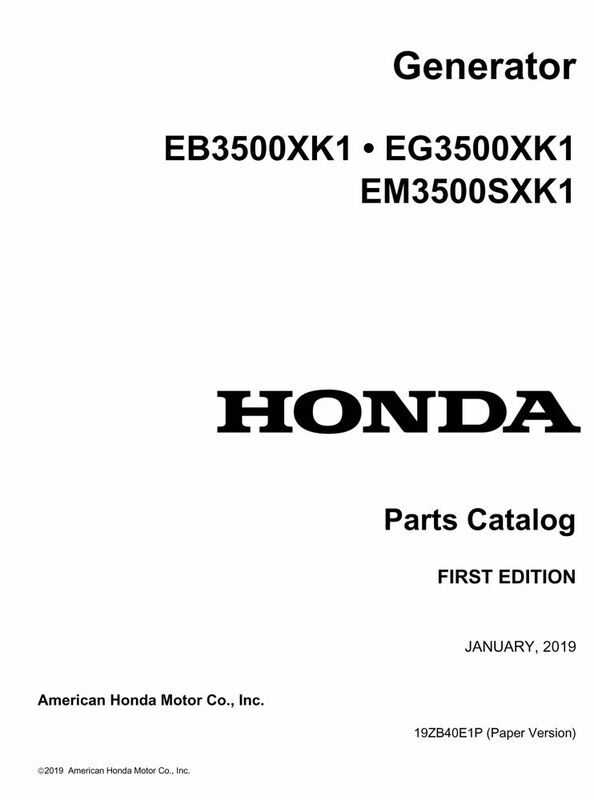 Paper parts catalog for the EB3500X, EG3500X, EM3500SX, and EM3500X Generators. See FAQs for assistance in locating your frame serial number. Enter your serial number prefix (such as EA6) in the search box to locate applicable shop manuals, parts catalogs, and free downloads. 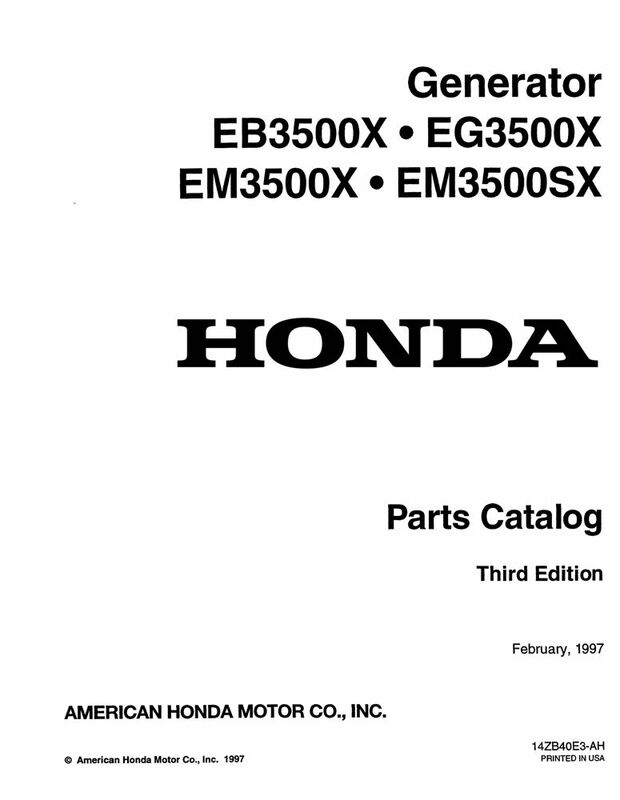 Paper parts catalog for the EB3500XK1, EG3500XK1, and EM3500SXK1 Generators. See FAQs for assistance in locating your frame serial number. Paper parts catalog for the EB3800X, EB4000X, EB5000XK2, EB5000XK3, EB6500X, and EB6500X1 Generators. See FAQs for assistance in locating your frame serial number. Enter your serial number prefix (such as EAJC) in the search box to locate applicable shop manuals, parts catalogs, and free downloads. 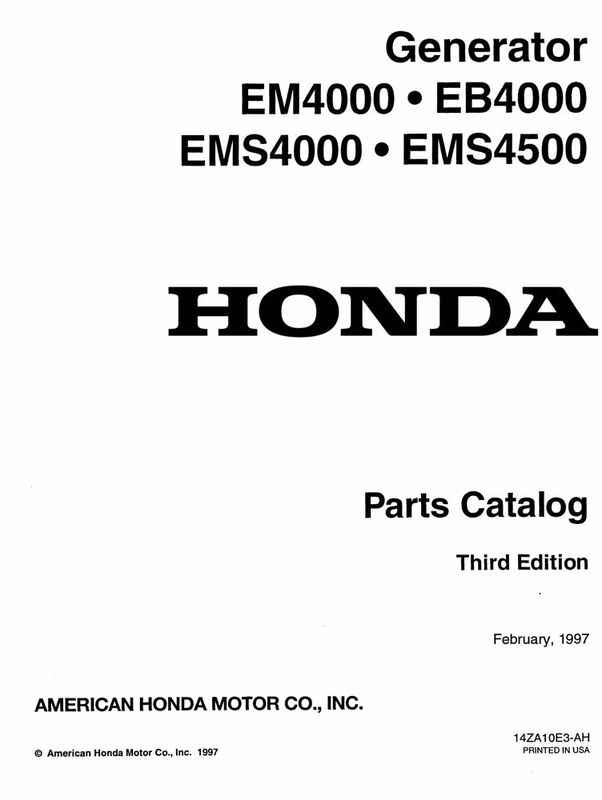 Paper parts catalog for the EB4000, EMS4000, EMS4500, and EM4000 Generators. See FAQs for assistance in locating your frame serial number. 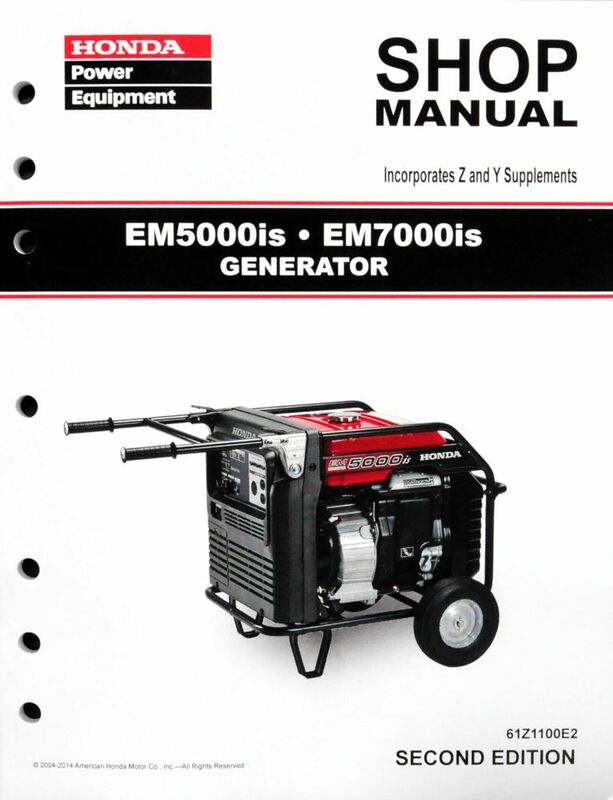 Paper parts catalog for the EB5000I, EB7000I, EM5000IS, EM5000IS1, and EM7000IS Generator. See FAQs for assistance in locating your frame serial number. Enter your serial number prefix (such as EALJ) in the search box to locate applicable shop manuals, parts catalogs, and free downloads. Paper parts catalog for the EB5000X, EG5000X, EM5000SX, and EM5000X Generators. See FAQs for assistance in locating your frame serial number. 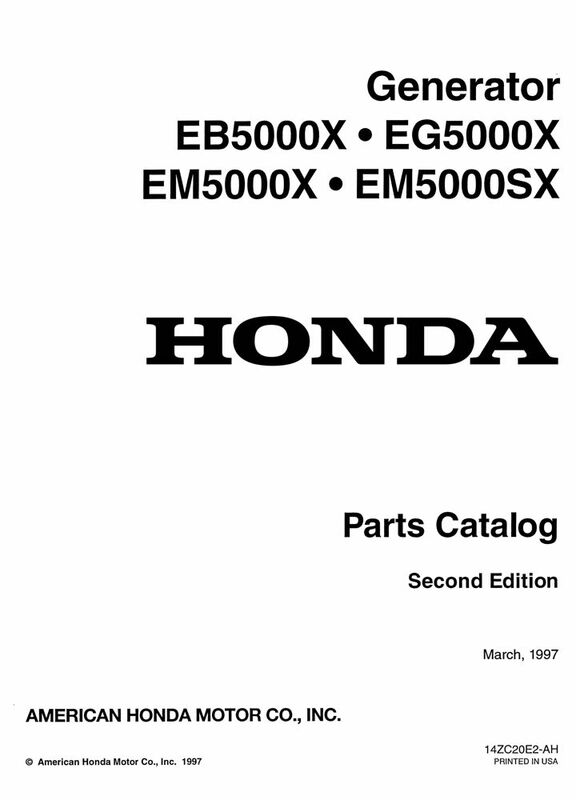 Paper parts catalog for the EB6500SX Generator. See FAQs for assistance in locating your frame serial number. 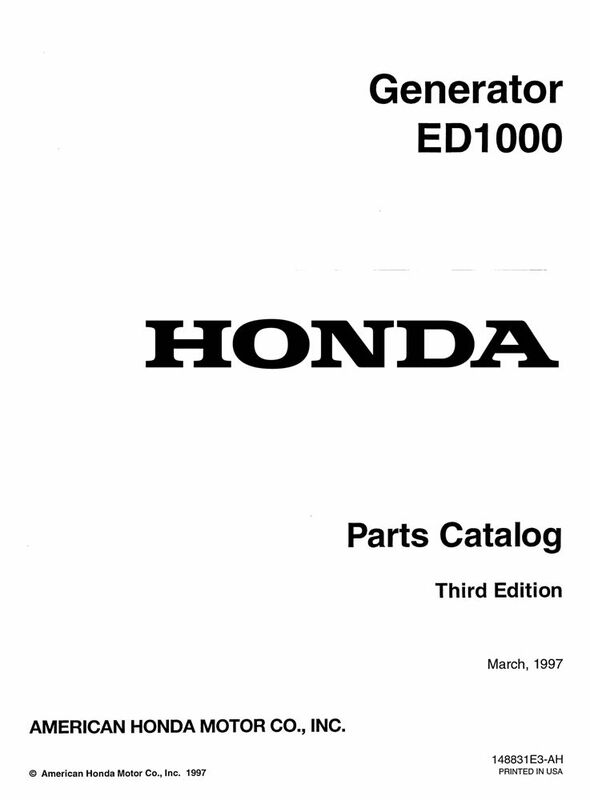 Paper parts catalog for the ED1000 Generator. See FAQs for assistance in locating your frame serial number. 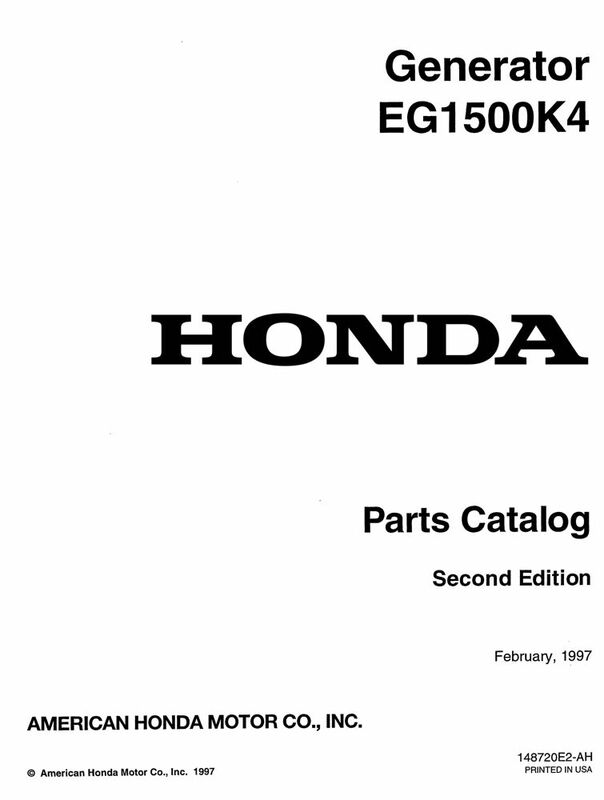 Paper parts catalog for the EG1000 Generator. See FAQs for assistance in locating your frame serial number. 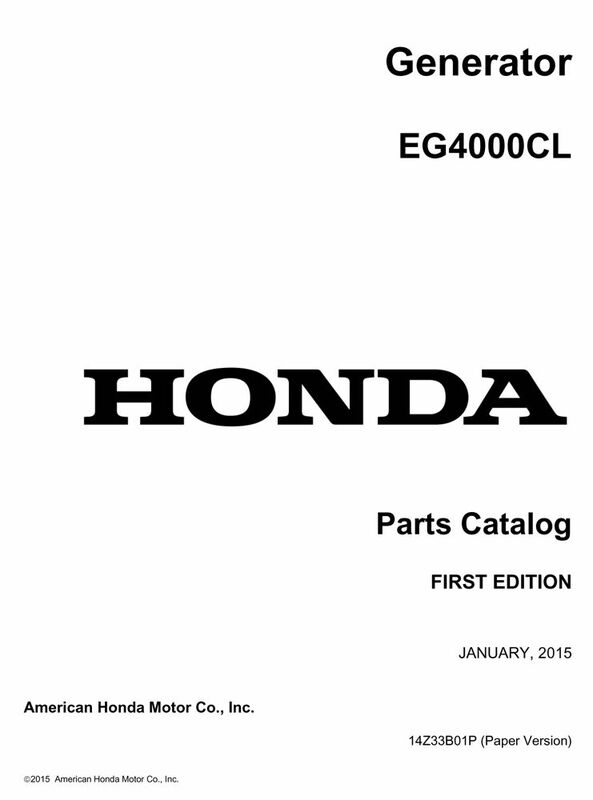 Paper parts catalog for the EG1400X, EG1400XK1, EG2200X, and EG2500XK1 Generators. See FAQs for assistance in locating your frame serial number. 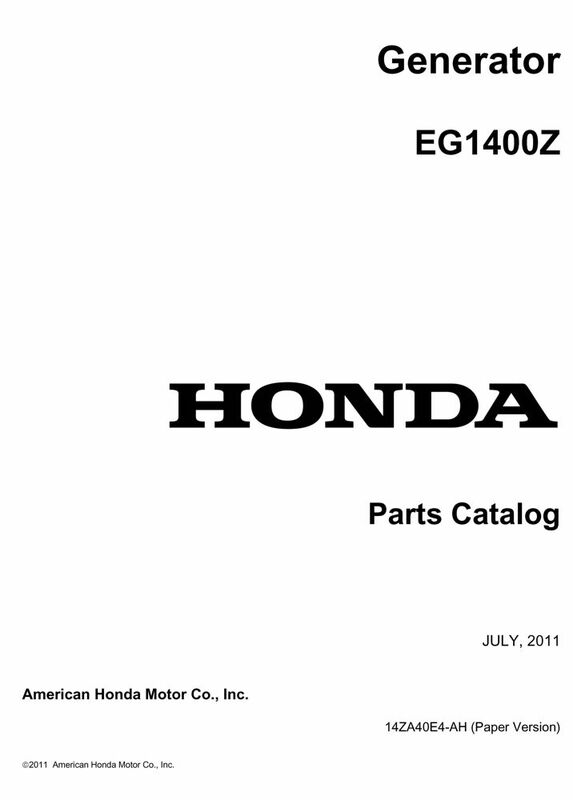 Paper parts catalog for the EG1400Z Generator. See FAQs for assistance in locating your frame serial number. Enter your serial number prefix (such as GE150) in the search box to locate applicable shop manuals, parts catalogs, and free downloads. 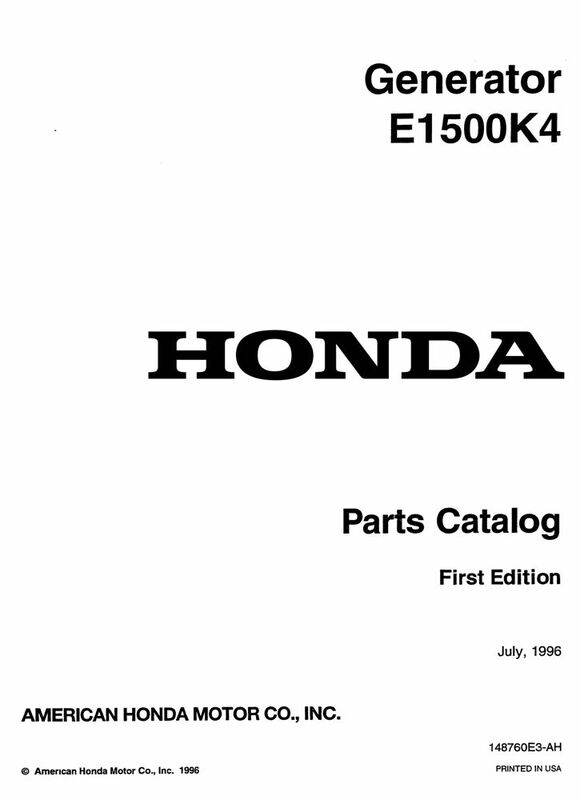 Paper parts catalog for the EG1500, EG1500K3, and ER1500 Generators. See FAQs for assistance in locating your frame serial number. Enter your serial number prefix (such as G41) in the search box to locate applicable shop manuals, parts catalogs, and free downloads. 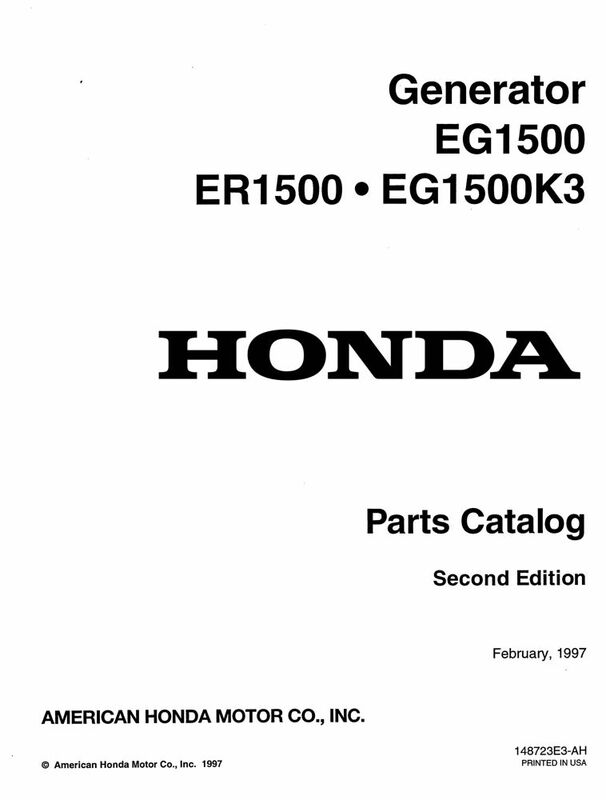 Paper parts catalog for the EG1500K4 Generator. See FAQs for assistance in locating your frame serial number. 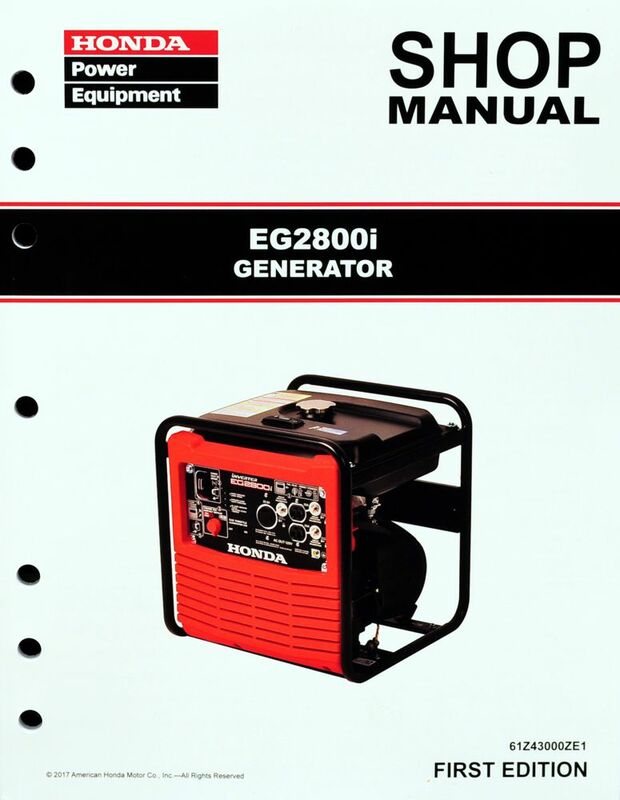 Paper parts catalog for the EG2200Z Generator. See FAQs for assistance in locating your frame serial number. 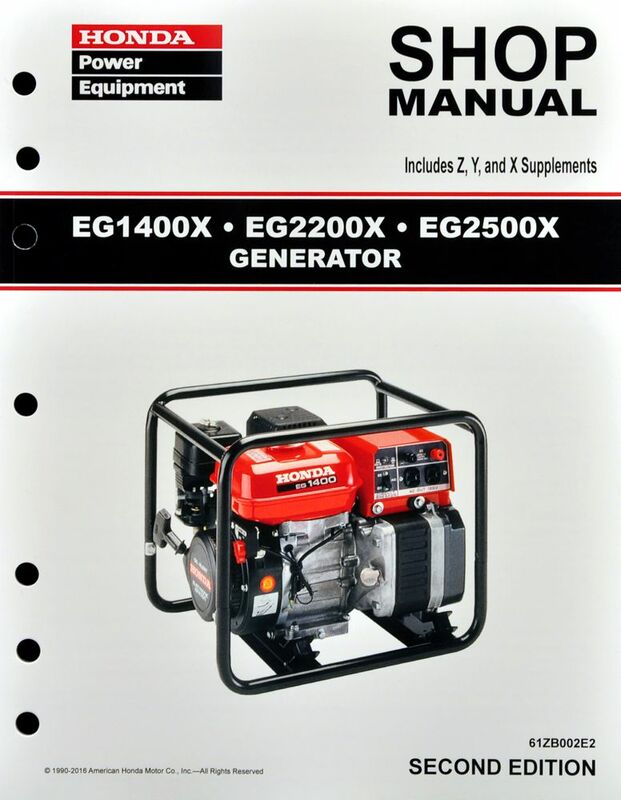 Paper parts catalog for the EG4000CL Generator. See FAQs for assistance in locating your frame serial number. Enter your serial number prefix (such as EBGC) in the search box to locate applicable shop manuals, parts catalogs, and free downloads. Paper parts catalog for the EG5000CL Generator. See FAQs for assistance in locating your frame serial number. Enter your serial number prefix (such as EBEC) in the search box to locate applicable shop manuals, parts catalogs, and free downloads. 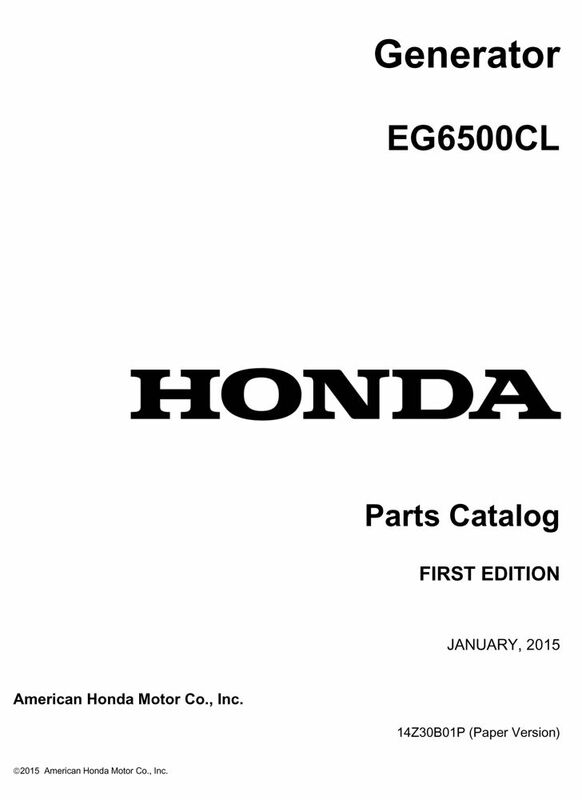 Paper parts catalog for the EG650, EM650, and EX650 Generator. See FAQs for assistance in locating your frame serial number. 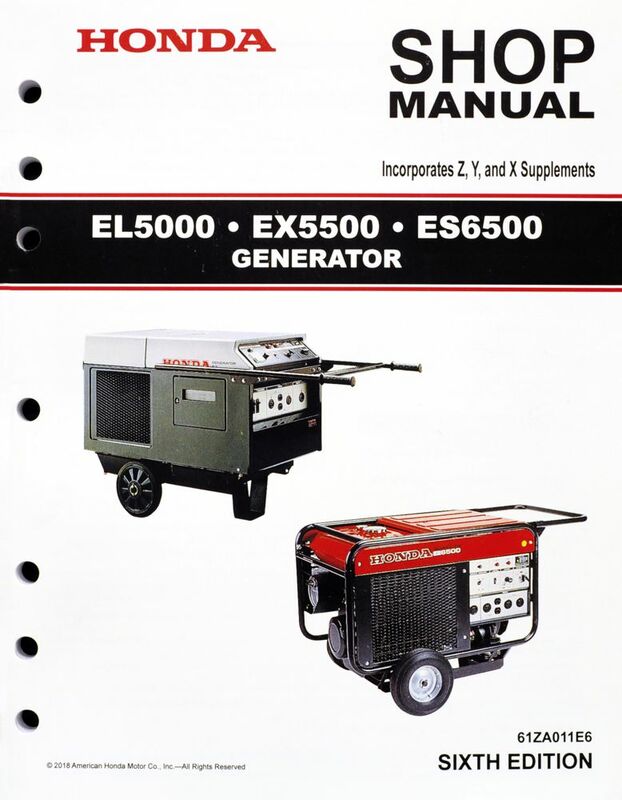 Paper parts catalog for the EG6500CL Generator. See FAQs for assistance in locating your frame serial number. Paper parts catalog for the EL5000, ES6500, ES6500K1, ES6500K2, EX5500, EX5500K1, and EX5500K2 Generators. See FAQs for assistance in locating your frame serial number.